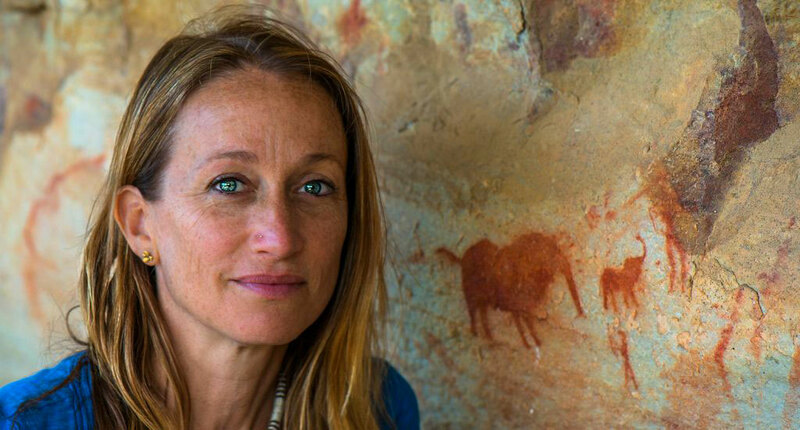 Céline Cousteau just launched her Kickstarter campaign for her documentary titled Tribes On The Edge. Please click on the play button below to see her exciting project and be sure to support her Kickstarter campaign to help finish her film. ''People protect what they love." 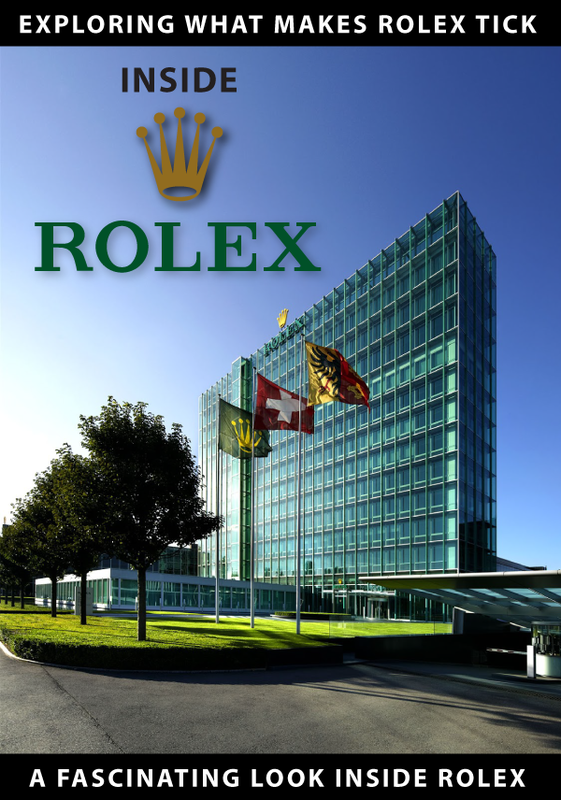 When I started Jake's Rolex World eleven years ago, my goal was to capture as much of Rolex's amazing history as possible, as well as to separate-the-fact-from-the-fiction on falsely perpetuated Rolex myths. 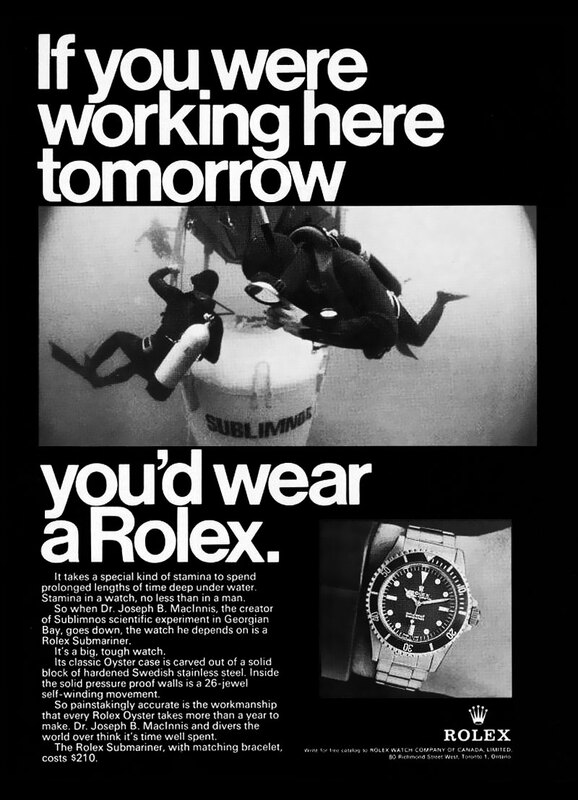 At the time, I couldn't help but notice there were two significant Rolex related historical figures who surprisingly seemed to almost not exist on the world-wide-web, and that was Rolex founder, Hans Wilsdorf and explorer, Jacques-Yves Cousteau. I will point out there were many career similarities between Cousteau and Wilsdorf in the sense that they were had superb marketing minds. 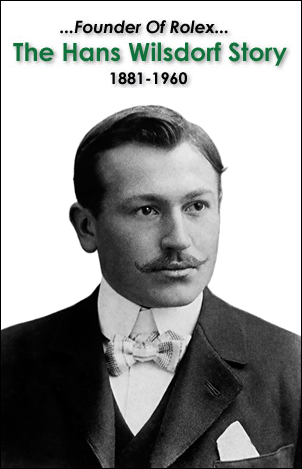 With Hans Wilsdorf, there were only two photos of him on the entire web—the one that was taken when he was an older man with the crazy hair, and the one when he was young and handsome with a mustache. This struck me as being almost a crime against humanity as I realized Wilsdorf was arguably one of the most successful entrepreneurs in history. I wanted to know Wilsdorf's story and assumed many of my readers did as well. And that is exactly what I did. I wrote an enormously detailed story which I believe captures the magic of Hans Wilsdorf's astronomical lifetime achievements. 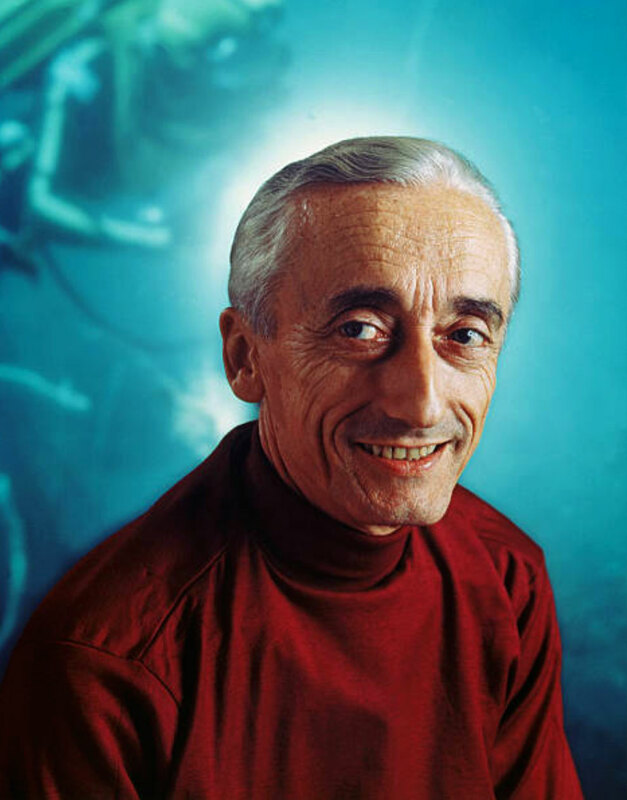 The second person almost absent from the internet a decade ago was Jacques-Yves Cousteau, which struck me as being really peculiar since he was so popular during my childhood!?!! 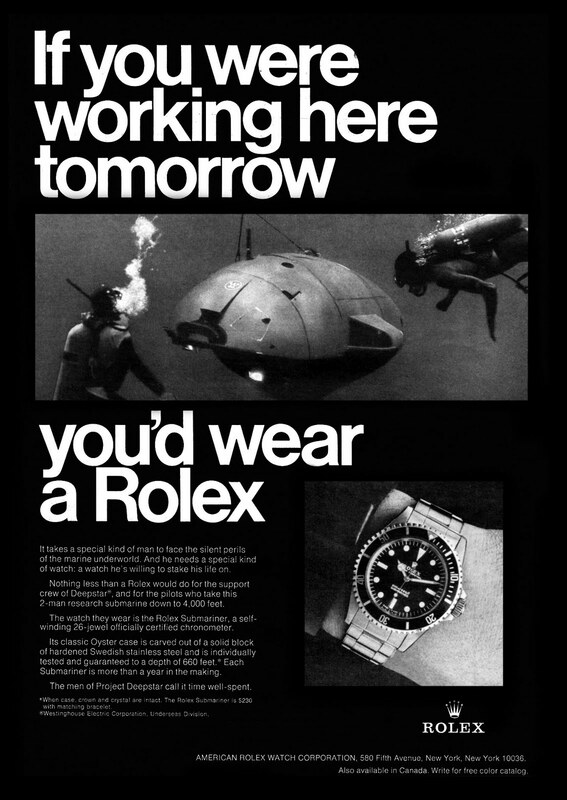 I am not talking specifically about Cousteau in the context of Rolex. I mean in general. There were some low resolution photos of Jacques-Yves Cousteau, and tidbits of writing, but nothing cohesive or substantial on his career achievements. As a result of my curiosity and frustration, I set out on a mission to extensively document both Hans Wilsdorf and Jacques-Yves Cousteau's career achievements, and ended up creating the single largest story on each man—on the web—which included the largest repositories of photos for both men. I did the same for Dr. Martin Luther King Jr., Paul Newman and Steve McQueen. It is interesting to note the year Jacques-Yves was born, the Rolex brand Hans Wilsdorf founded in London, England was only two years old. 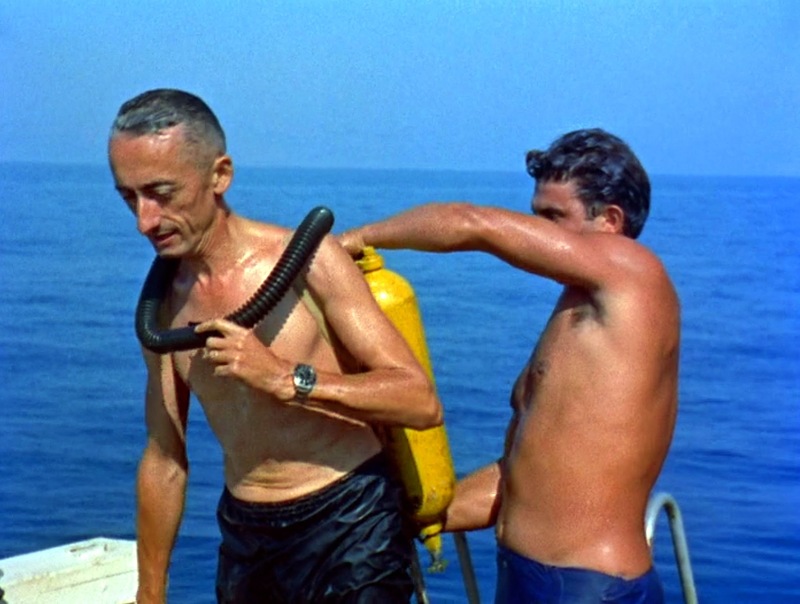 My first story on Jacques-Yves Cousteau was a 5 part series where I discovered he wore a Rolex Submariner prototype in 1953 when he was filming his Silent World documentary. 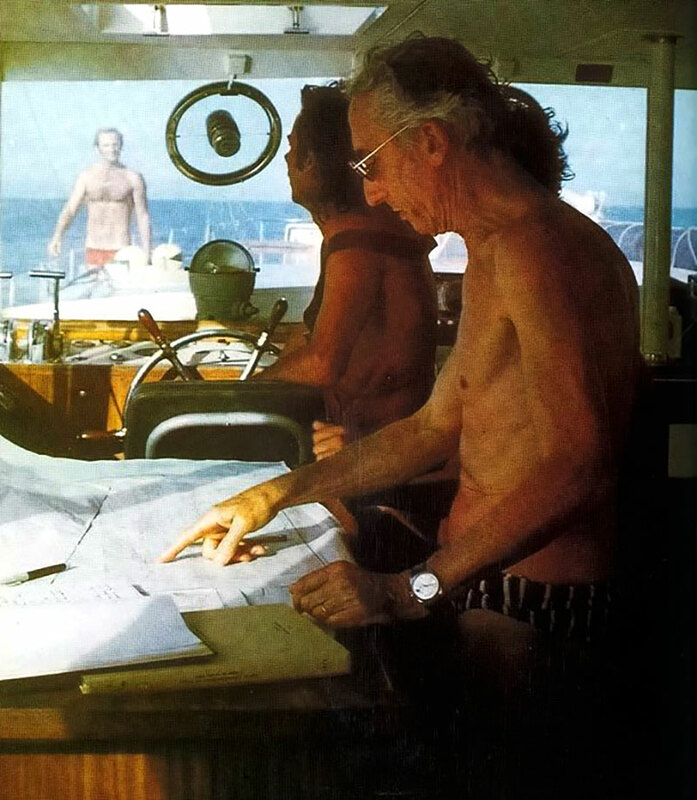 I remember I almost fell out of my chair when I first discovered in 2007 and published the image below of Cousteau taken aboard the Calypso in 1953 rockin' a Rolex Submariner!!! The fact Cousteau wore this Rolex Submariner was previously undocumented. 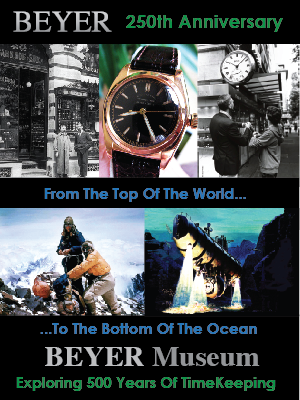 In that same year, I began what Ariel Adams from A Blog To Watch once described as an epic Rolex tome, which is my 20 Part series named: The Complete History of The Rolex Submariner and SEA-DWELLER: Rolex's Conquest Of The Ocean, which largely incorporated and revolved around Jacques-Yves Cousteau. 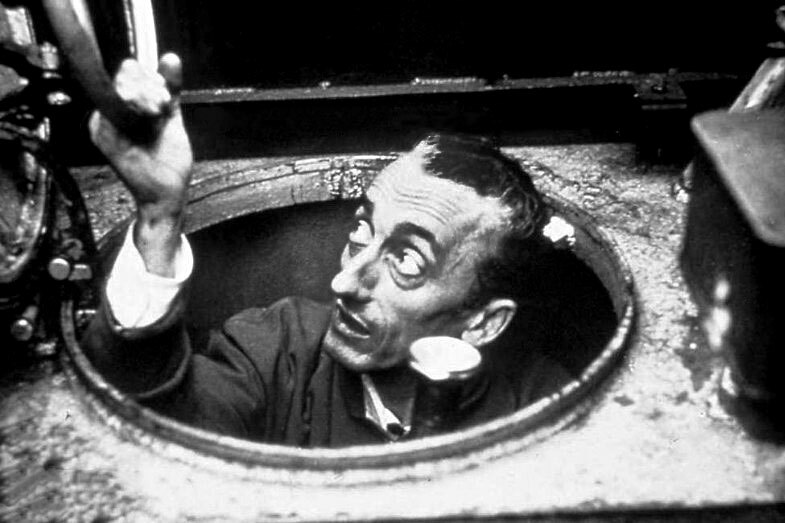 In that story, it seemed behind everything, or at the center of everything was Jacques-Yves Cousteau—in one way or another. 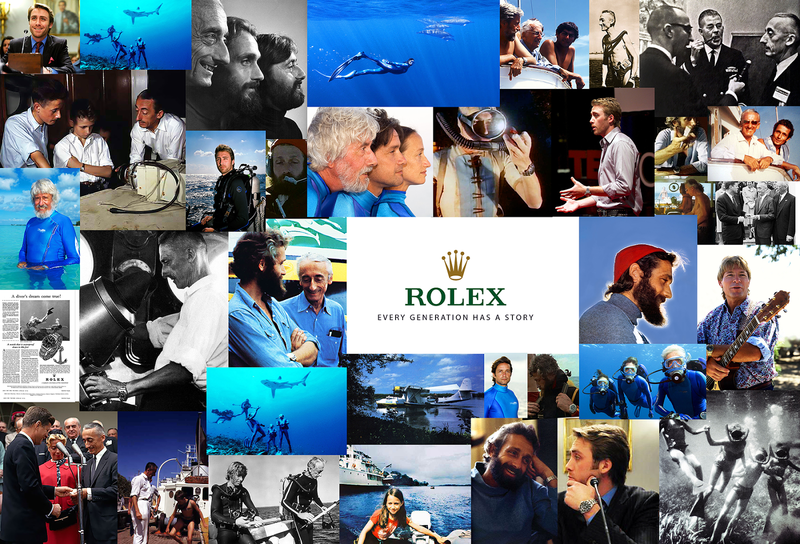 When I first interviewed Céline Cousteau she asked me about her grandfather Jacques-Yves and his relationship with Rolex. I took her on a tour of his Rolex history, and then when I interviewed her father Jean-Michel Cousteau who is Jacques-Yves Cousteau's son, he didn't seem that familiar with his father's history with Rolex either. That is one of the reasons I decided to write this definitive story—to put in one cohesive place a narrative that chronicles the Cousteau legacy and at the same time showcases in a comprehensive manner Jacques-Yves Cousteau's significant relationship with Rolex. I took this approach as I realized I have told Cousteau's story dozens of times in the past, but never in its totality as I do here. 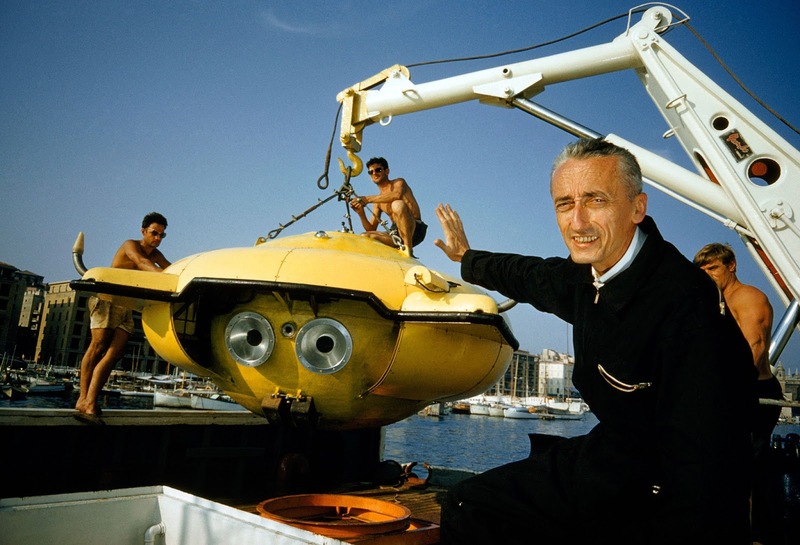 This is a very detailed story and after I wrote it I realized it's the first time Jacques-Yves Cousteau's in-depth Rolex story has been told in one place in its entirety. In other words, for the first time, we get a thorough understanding of Cousteau's significant contribution to the history of Rolex. Also, this story offers a fascinating update on all of Jacques Cousteau's adult descendants, of which I am certain Captain Cousteau would be very proud of. In the photo below we see Céline Cousteau swimming through the ocean with dolphins. Notice Celine is NOT wearing a tank but just a snorkel. Radical!!!! Check out the length of those flippers!!! She must get some serious speed going with those!!! Céline Cousteau has an effervescent personality with lots of moxie and determination. Like all of Jacques-Yves progeny, Céline remains in perpetual admiration of her grandfather and all of his incredible lifetime achievements. She told me, "My whole life I have been in awe of my father and grandfather and I strive to make a contribution to humanity they way they have!" In the next photo, we see Céline diving with a school of fish in the ocean. 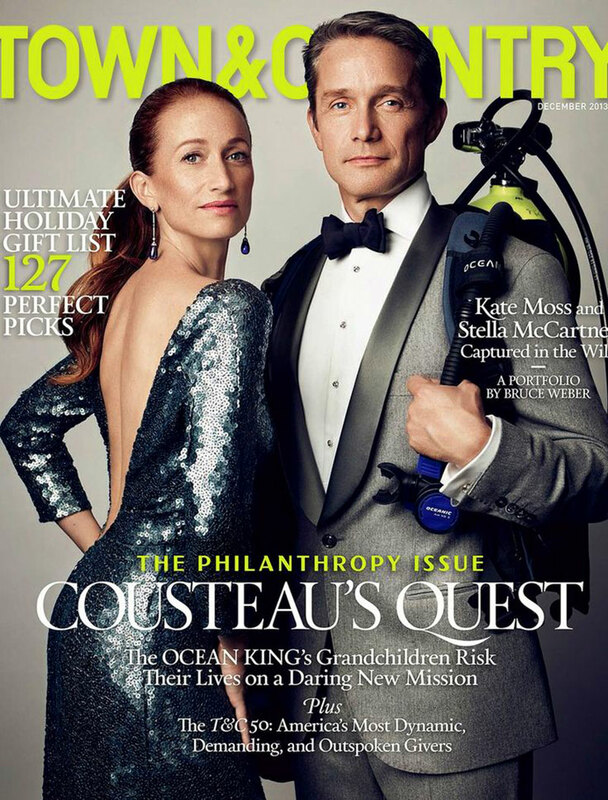 In the image below from the December 2013 cover of Town & Country Magazine we see Céline Cousteau with her brother Fabien Cousteau. 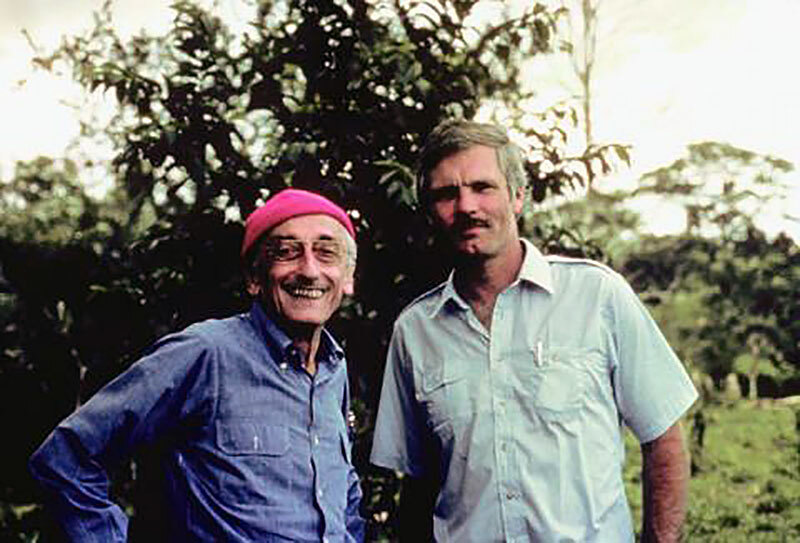 Céline Cousteau's grandfather lead his team and brought the Calpyso on an expedition in 1982 down the Amazon river which lasted several months. Mission Amazon ended up being a 5 part series that aired on the ABC television network to accolades and critical acclaim. Ted Turner financed the expedition and Jacques-Yves son, Jean-Michel helped produce it. Below is the original TV trailer for Cousteau's Amazon Expedition. 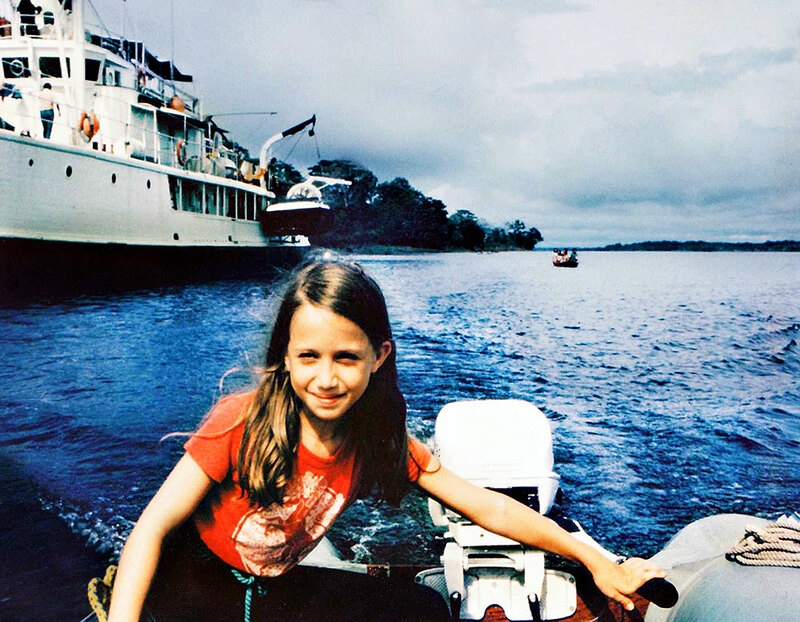 In the photo below we see Céline Cousteau piloting her zodiac boat down the Amazon with her grandfather Jacques-Yves Cousteau's Calypso in the background. 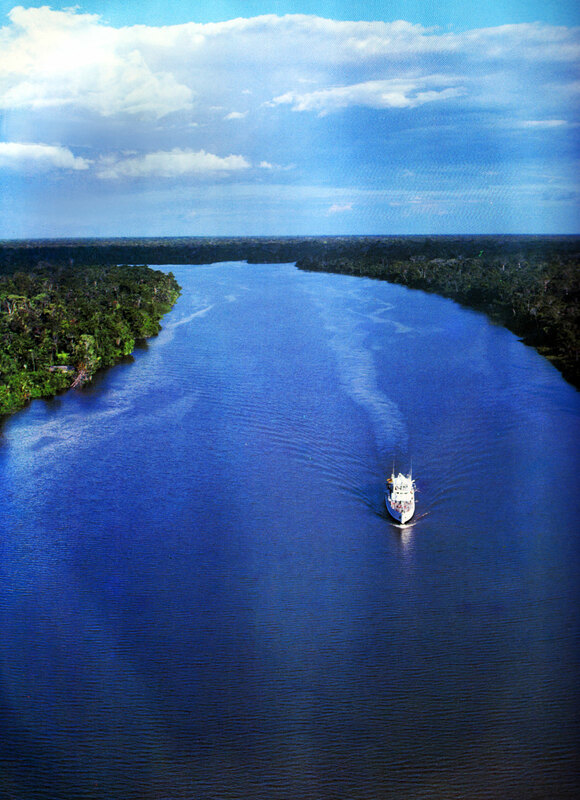 Céline and I discussed her first trip down the Amazon which her father Jean-Michel Cousteau took her on with her grandfather, and she mentioned how engaged and fascinated she was with the expedition, and in particular meeting the native people. This resulted in her returning a quarter of a century later with her father Jean-Michel on a return expedition to the Amazon. When we watch documentaries—which Céline's grandfather basically invented—we typically spend an hour watching from our comfortable chair, couch or bed, not realizing how painstaking and time consuming the background work was. Céline Cousteau and her team have to travel basically to the middle of nowhere, deep into the Amazonian wilderness to Javari, which seems like a place time almost forgot. Basically, if Jurassic Park was real it would probably be located in Javari which is highlighted in bright green on the map below. This next photo seen below which was taken by Carrie Vonderhaar, appears courtesy of Ocean Futures Society, and shows the "Long Commute" to work as we see Director of Photography Matt Ferraro napping, while Céline's brother Fabien Cousteau is contemplating, and we see Céline doing stretching exercises during their 33-hour trip to the Vale do Javari conference at Rio Novo during their father, Jean-Michel Cousteau's 2006-2007 Amazon expedition. 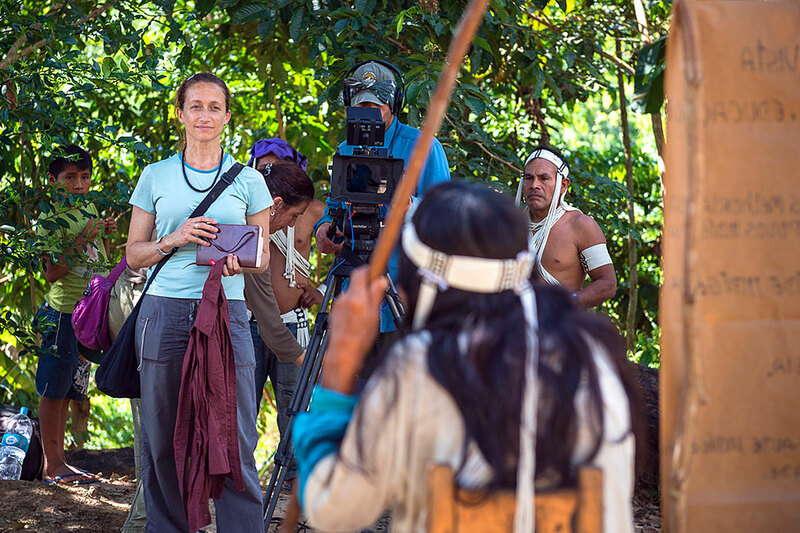 In 2013 Céline Cousteau returned a third time to the Javari in the Amazon to start filming her own documentary on some of the native tribes of the Amazon and their plight as we see in the photo below. This interesting documentary will be released soon as Céline and her team are still putting the finishing touches on their documentary. ABC News recently published this story about Céline Cousteau's upcoming project and also mentioned her Kickstarter campaign which launched on July 19, 2018. 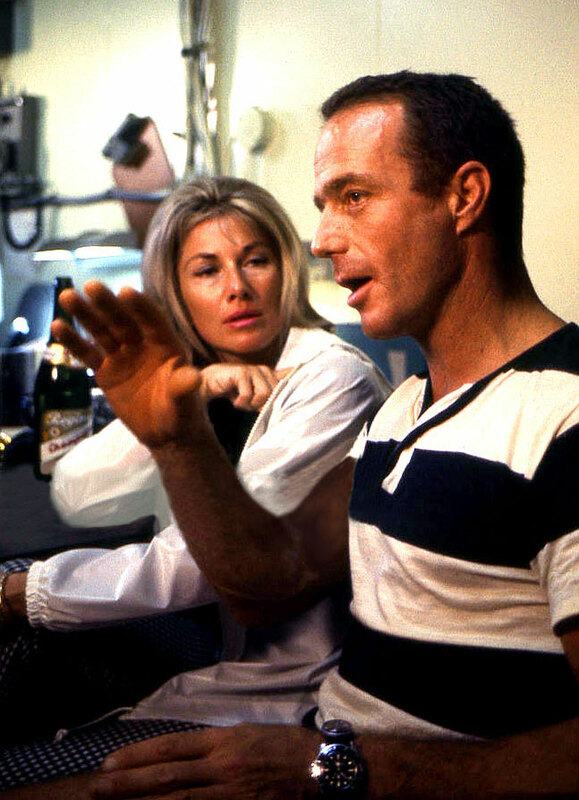 BTW, the Nell Newman Foundation is supporting Céline Cousteau's upcoming documentary named Tribes On The Edge having made a significant donation. 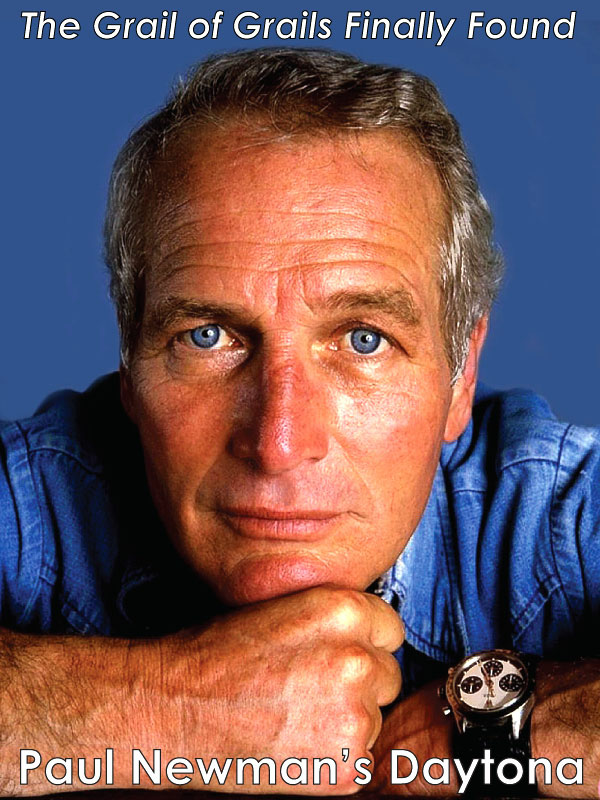 Nell Newman is Paul Newman's daughter, and if you ever wondered where all those millions of dollars went from the auction of her father's Rolex Daytona, you can rest assured they are being put to excellent use as part of the funds were donated toward the completion of Céline's documentary! 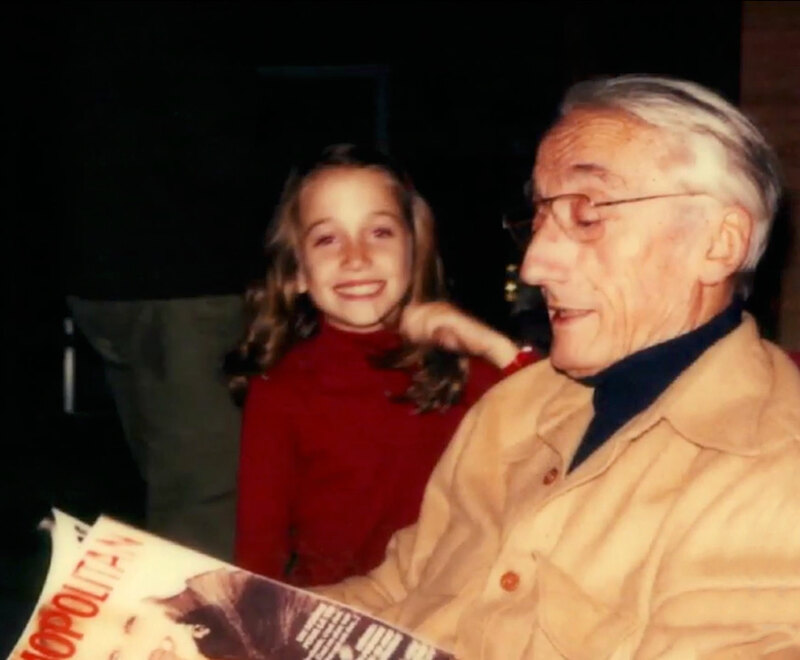 Céline Cousteau is pictured below with her legendary grandfather, Jacque-Yves Cousteau when she was a little girl. After having interviewed Céline I could not help but notice she shares her grandfather's Spirit of Inquiry and Exploration. 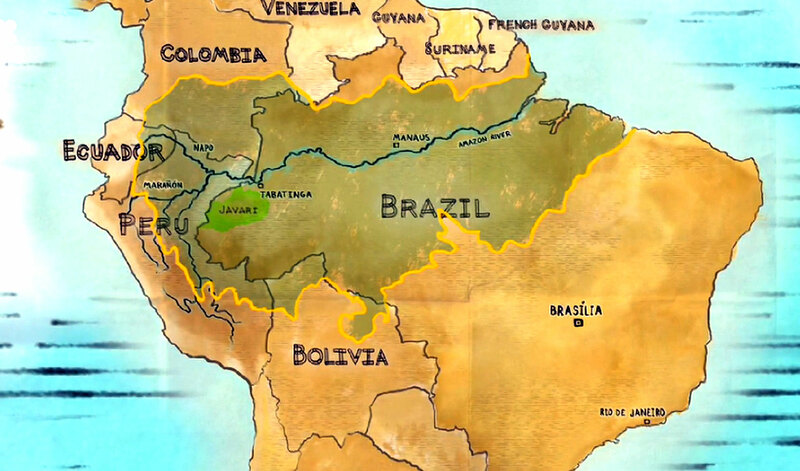 Below we see an earlier trailer for Céline Cousteau's upcoming documentary named "Vale do Javari: Tribes on the Edge." Céline wrote an article about this upcoming documentary which is very interesting. 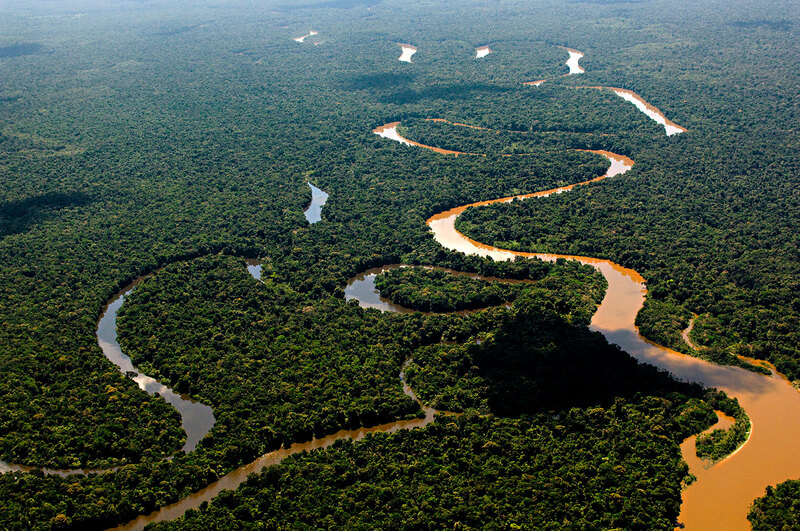 The Amazon River—as seen in the photo below—is the largest river in the world by discharge, and at 4,350 miles in length is filled with mystic surprises which include close to 3000 known species of fish that live in the river. Also, 20% of earths oxygen is generated by the vast Amazon rain-forest in Brazil. 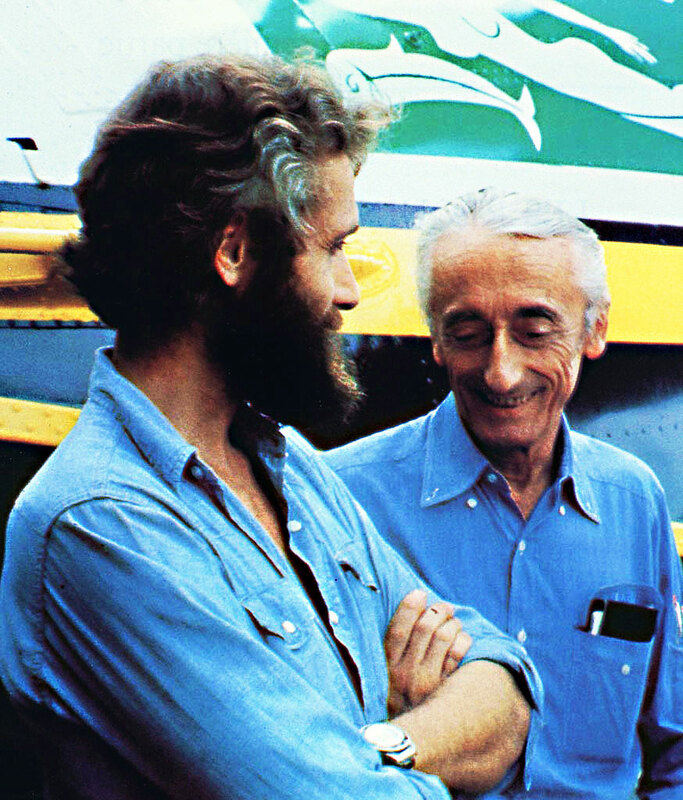 It was both a privilege and absolute pleasure to speak with Céline Cousteau. Céline mentioned a number of other fascinating projects she is working on and I look forward on covering them in the future. I recently had the absolute pleasure of speaking in detail with Jean Michel Cousteau who is the head of OceanFutures.org. Jean-Michel Cousteau is Royalty in the world of exploration as he is the son of the greatest explorer in history, Jacques-Yves Cousteau. 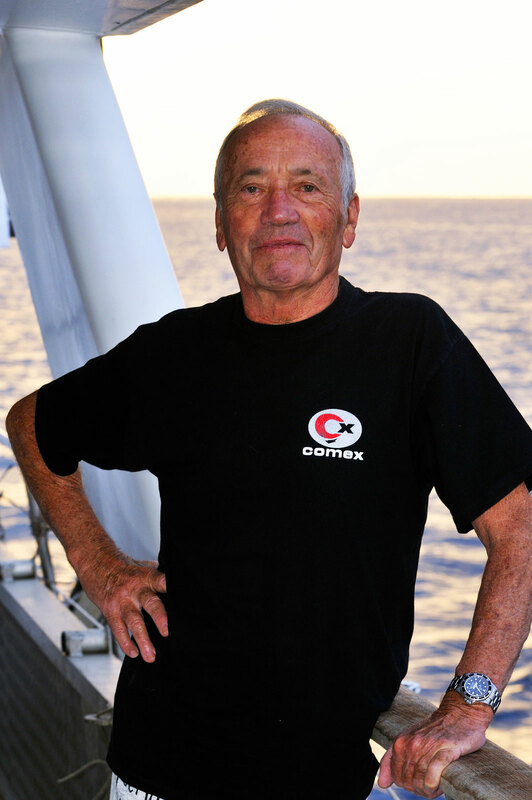 He is also Céline & Fabien Cousteau's father. Jean-Michel and I took a stroll down memory lane as we discussed so many different aspects of his history as well as his legendary father's history. 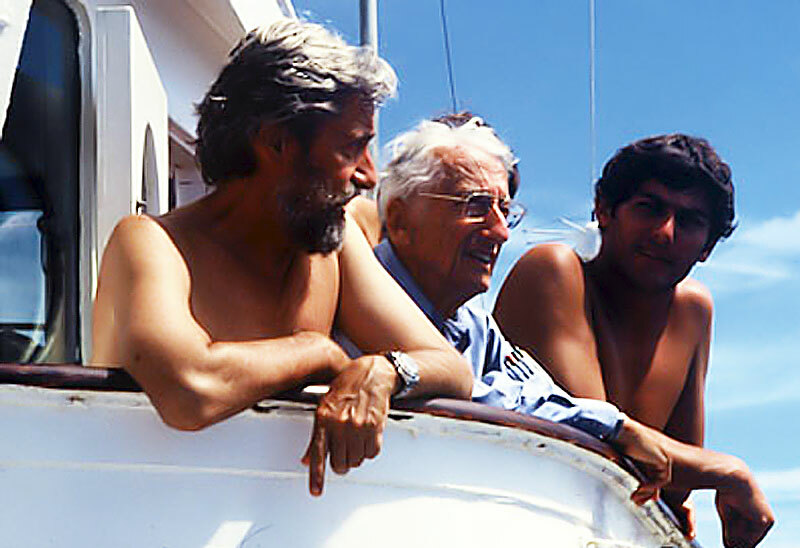 Jean-Michel Cousteau is pictured below in 1989 in Papaua, New Guinea with his father, Jacques-Cousteau aboard the Calypso, and notice he is wearing his Rolex SEA-DWELLER. I asked Jean-Michel what his first recollection was of wearing a Rolex Submariner and he told me it was when he was stationed in Madagascar in 1958 while serving in the French Navy. 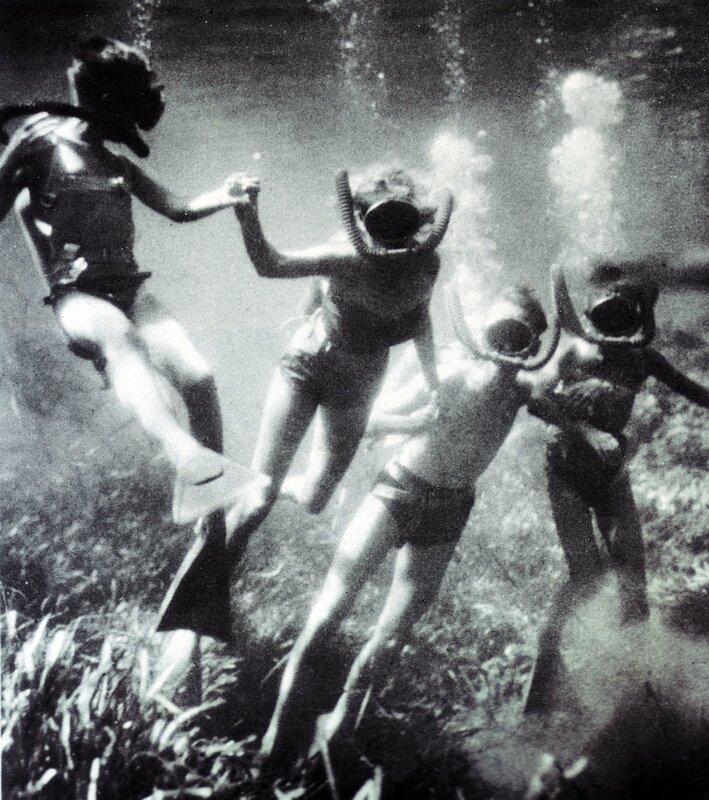 In the photo below we see Jean-Michel Cousteau with his father Jacques-Yves, mother Simone Melchior, and brother Philippe-Piere SCUBA diving in the 1940s. Jacques-Yves was one of the pioneers of early SCUBA diving. 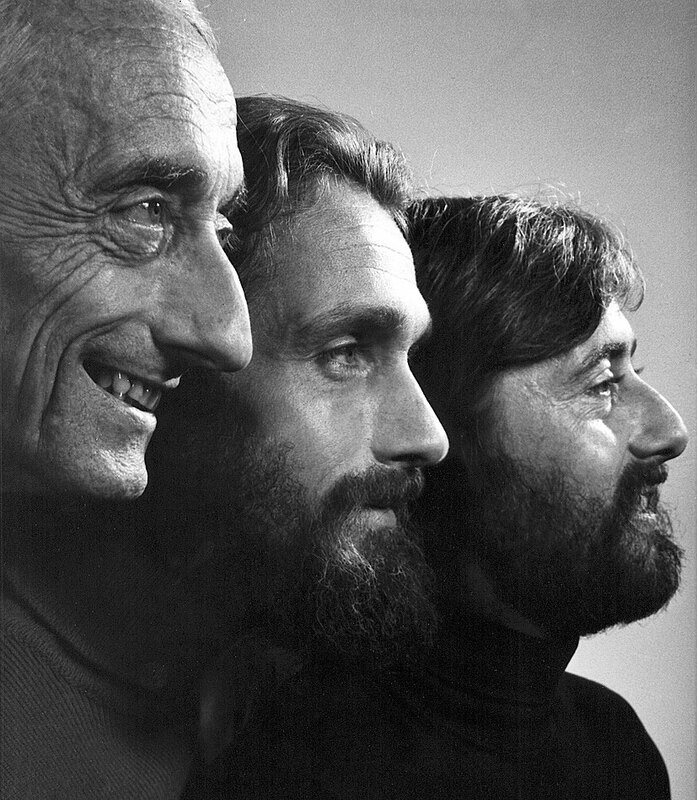 In the famous family portrait below we see Jacques-Yves with his two sons, Philippe and Jean-Michel Cousteau. 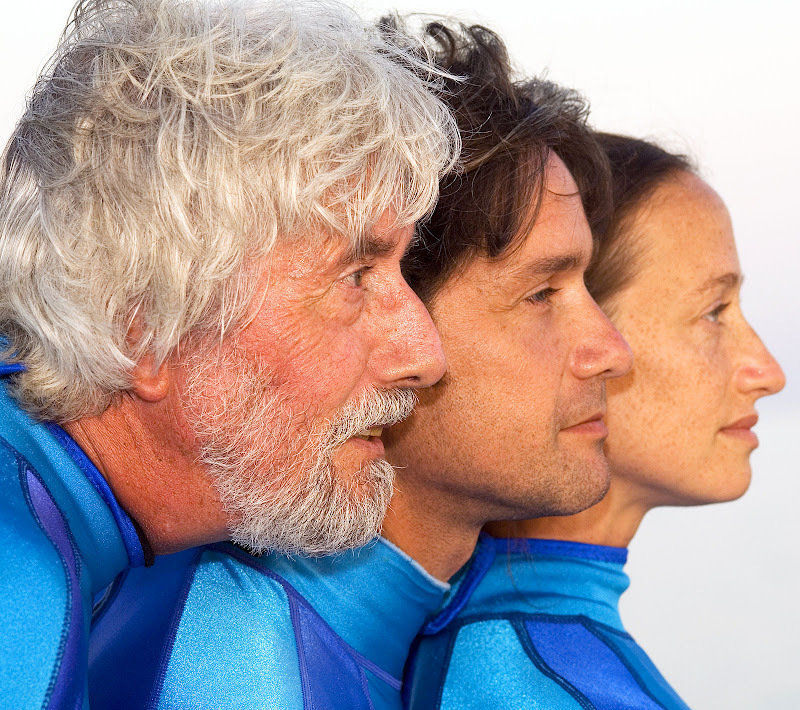 Jean-Michel Cousteau is in the photo below that was inspired by the family portrait above, with his children Fabien and Céline Cousteau. 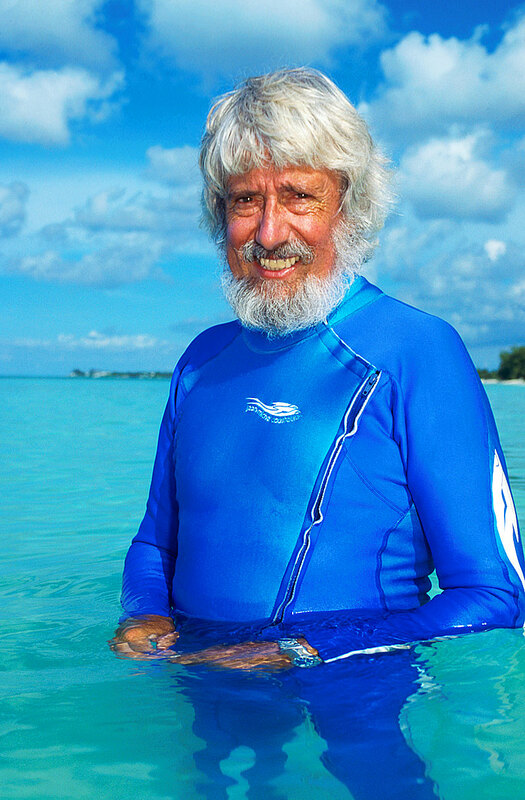 Jean-Michel Cousteau is pictured below from a TV documentary SCUBA Diving with his daughter Céline and son Fabien Cousteau. 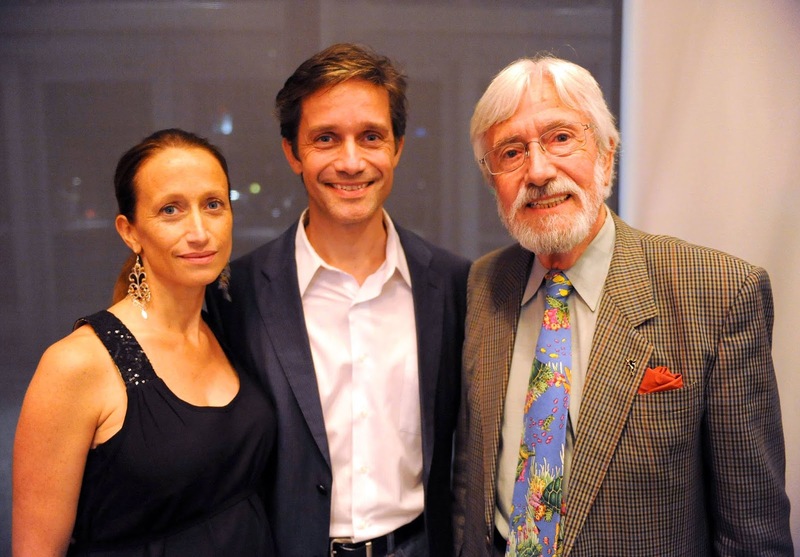 In this next photo we see Jean-Michel Cousteau with his daughter Céline and son Fabien Cousteau. In the video below we see Jean-Michel Cousteau with leading marine biologist, Dr. Sylvia Earle. Dr. Earle is also an avid explorer, author, and lecturer. She has been a National Geographic explorer-in-residence since 1998. If you are not familiar with Dr. Sylvia Earle, you should check out her recent documentary titled Mission Blue, which can be seen on Netflix. 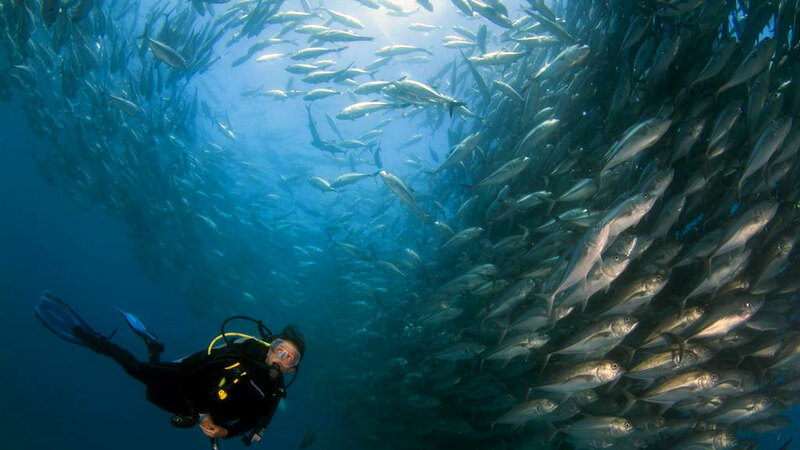 Also you can visit Sylvia Eearle's Mission-Blue.Org to learn more about her superb mission. 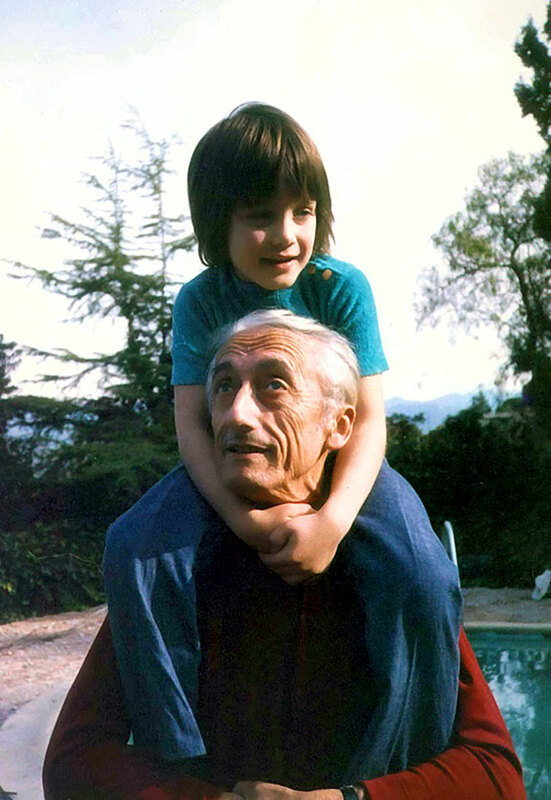 Fabien Cousteau is Jean-Michel's son and is pictured below on his grandfather, Jacques-Yves Cousteau's shoulders. 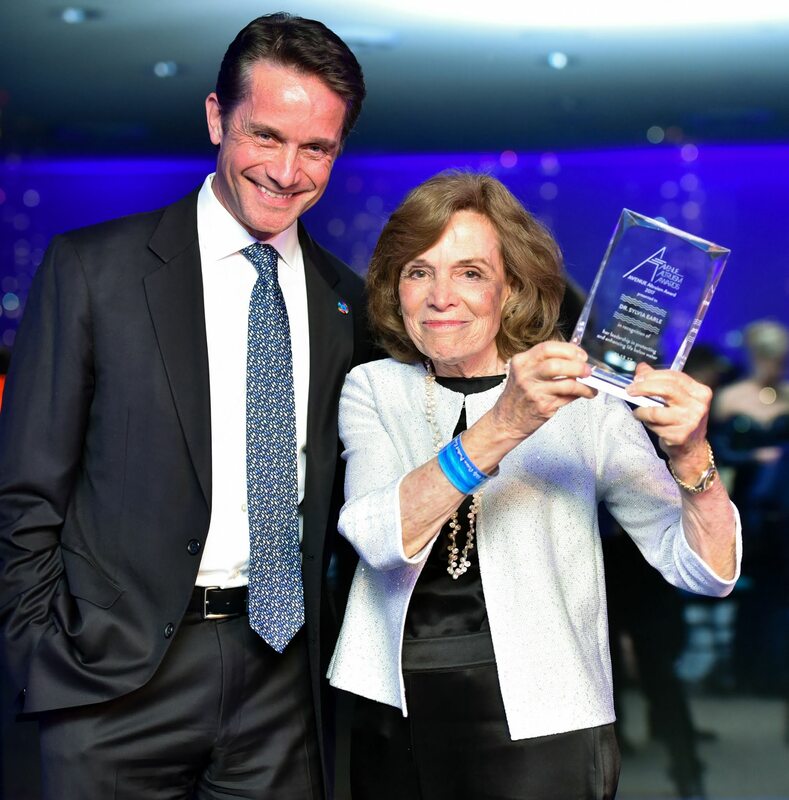 In the photo below we see Fabien Cousteau with Dr. Sylvia Earle who is a leading marine biologist as well as being a world renowned Rolex brand ambassador. I would say Sylvia Earle is almost like a female version of Jacques-Yves Cousteau. Below is a Ted Talk Fabien Cousteau gave which is amazing!!! Jean-Michel and I were talking about his career and he mentioned he is an architect by training. He told me his father asked him what he wanted to do after he got out of the mandatory French military service, and he told his father he wanted to design and build cities underneath the ocean, which at the time seemed like a viable possibility, so he ended up going to architectural school. 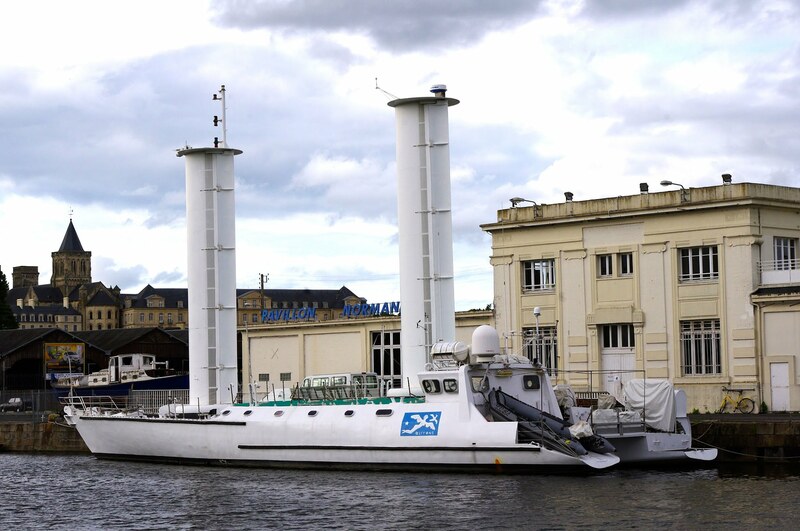 Jean-Michel mentioned one of his great lifetime achievements was in designing the predecessor to the Calypso which is named the Alcyone (daughter of the wind), that is a dual turbosail propulsion ship, which is pictured above and below. Jean-Micheal also mentioned he designed a Calypso II, which has yet to be built. How cool would it be if the Cousteau family builds the Calypso II and they start making documentaries aboard the ship!?!! "The work of my father was a hymn to life. On the wall of my office there is a quotation from my father: 'The happiness of the bee and the dolphin is to exist. For man it is to know that and to wonder at it.'" 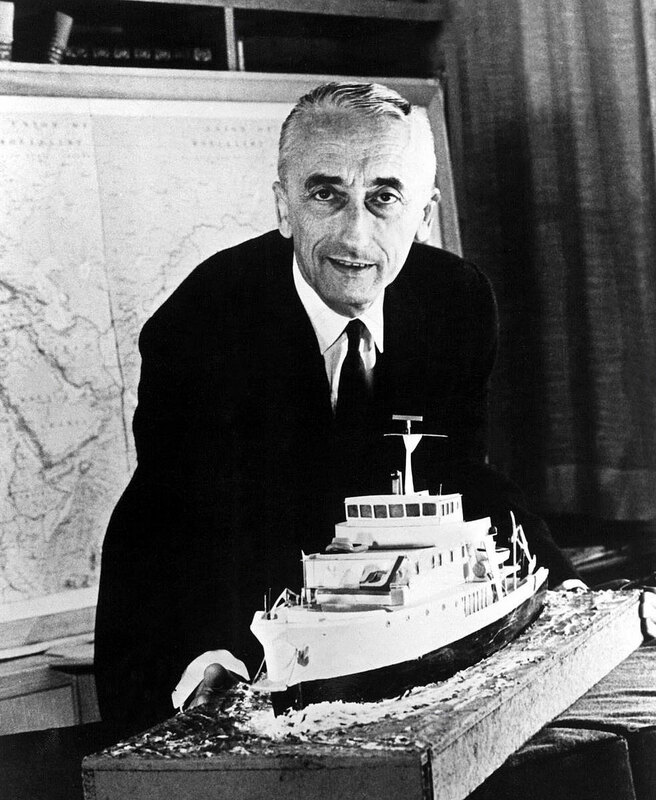 Jacques-Yves Cousteau, who is Jean-Michel's father and Céline Cousteau's grandfather is the greatest explorer that has ever lived—bar none. Not only did Jacques-Yves invent the documentary film, but he won three Academy Awards for Best Documentary making them. Jacques-Yves was a true renaissance man as he was a French Naval Officer, ecologist, filmmaker, scientist, innovator, author, photographer, and researcher. 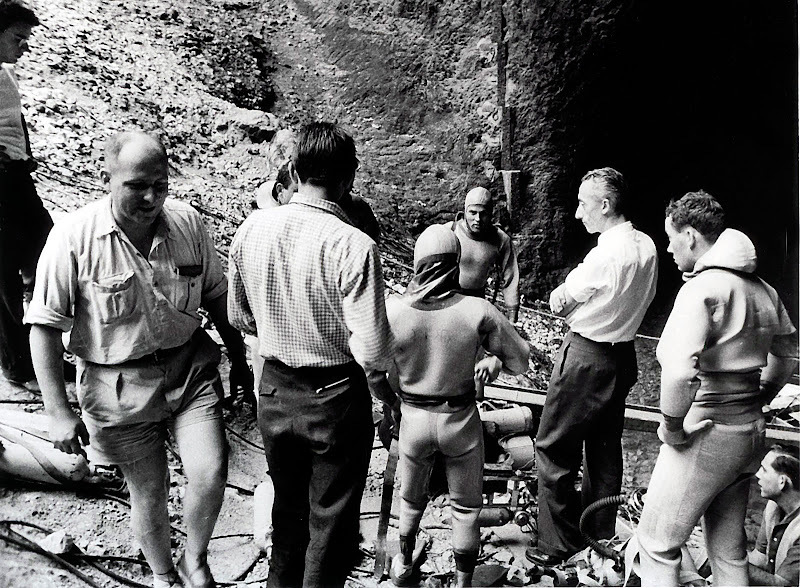 He also co-developed the aqua-lung, as well as much of the technology for filming underwater including special lighting and waterproof camera housing. 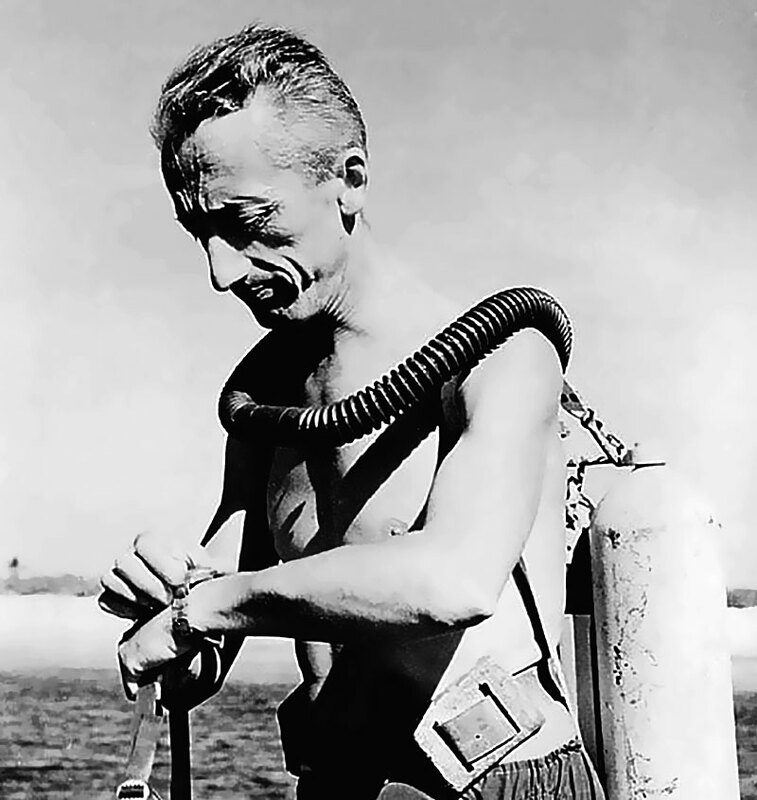 Jacques-Yves Cousteau was commonly referred to by his friends as J.Y.C., pronounced Jeek. J.Y.C. was a pioneer in marine preservation and was also commonly referred to as 'le Commandant Cousteau', which is 'Captain Cousteau' in English. I remember when I was a small child, every Sunday night my family would gather in front of the TV set to watch: "The Underwater World Of Jacques Cousteau", which ran from 1968 to 1976 on ABC. 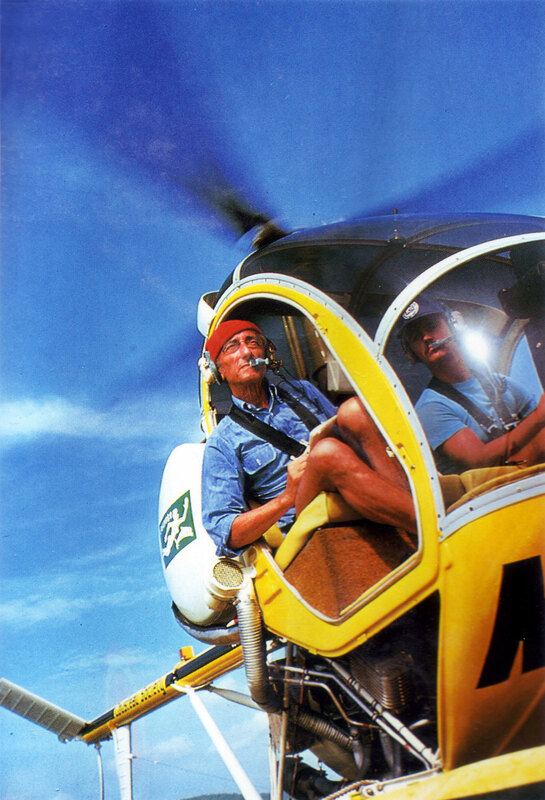 On this amazing show Captain Cousteau and his sons would take us on-board his famous Calypso ship, airplane, balloon and helicopter to explore all over the world. 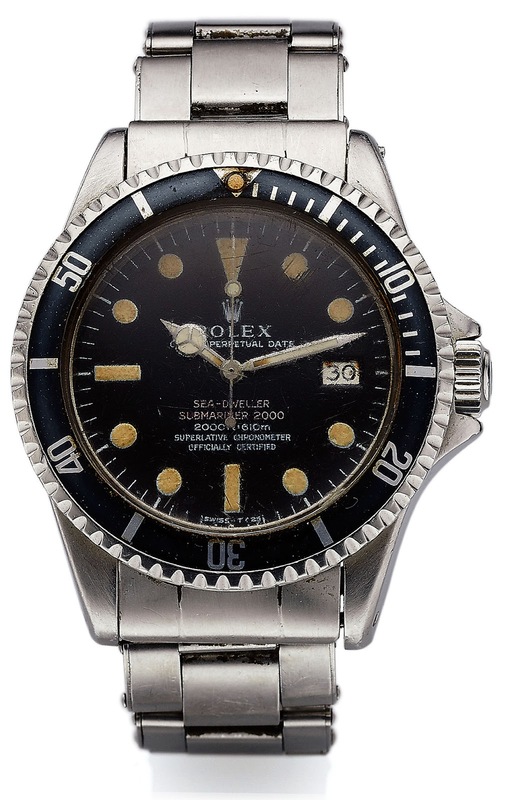 Have you ever wondered how and why Rolex ended up naming the Submariner model? Submariner is most commonly pronounced Suhb-mar-uh-ner, but it's original and proper pronunciation is Suhb-muh-ree-ner. 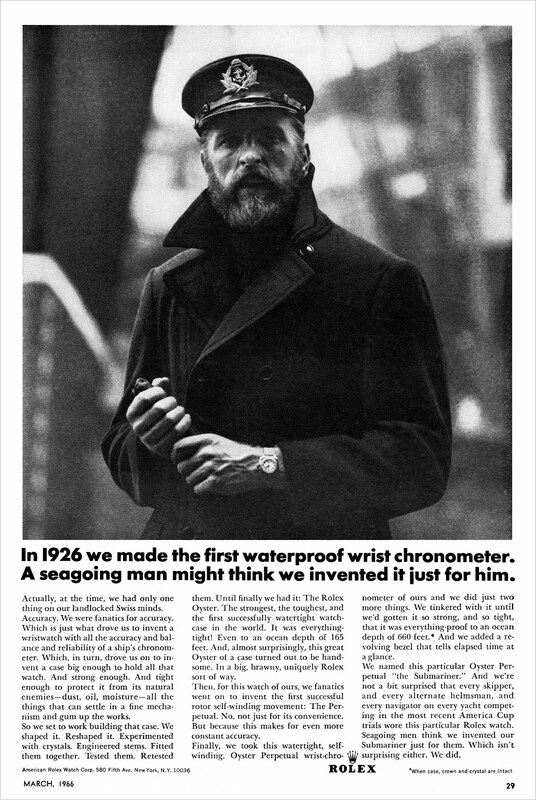 Meaning the watch was designed for a Submarine Captain, NOT a Mariner who was Sub-par. 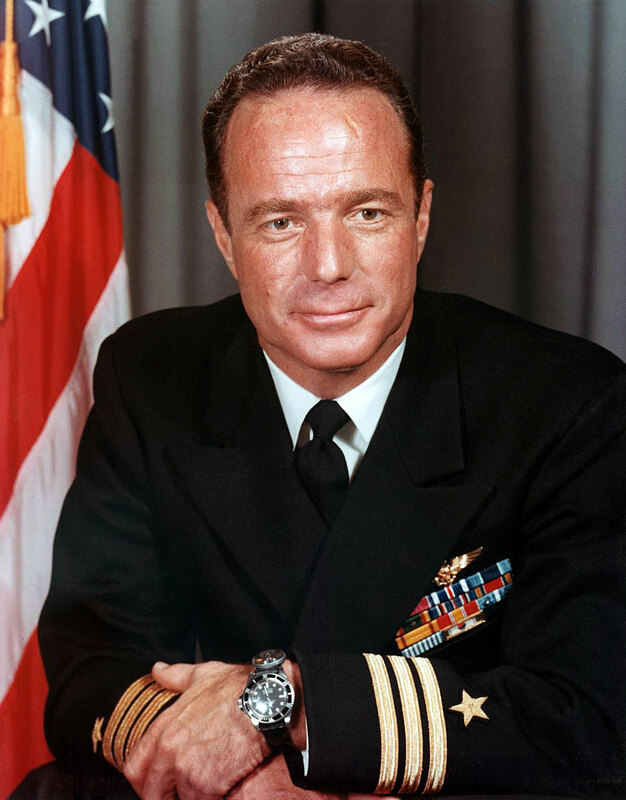 I first recall learning this from NASA Mercury Astronaut and SEALAB Aquanaut, Scott Carpenter, (pictured below) and have been reminded/corrected about this mispronunciation several times by U.S, Navy SEALAB Aquanaut and mission leader, Bob Barth. 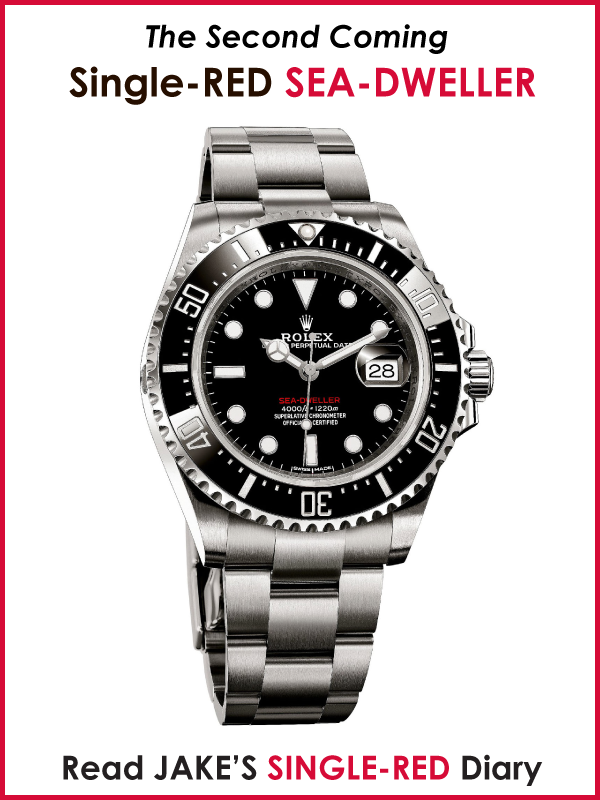 "The Rolex Submariner & Rolex SEA-DWELLER have a cachet that is unmatched by any other watch. 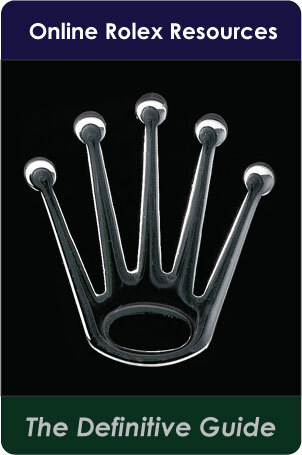 The Rolex brand is the most highly respected in my book. 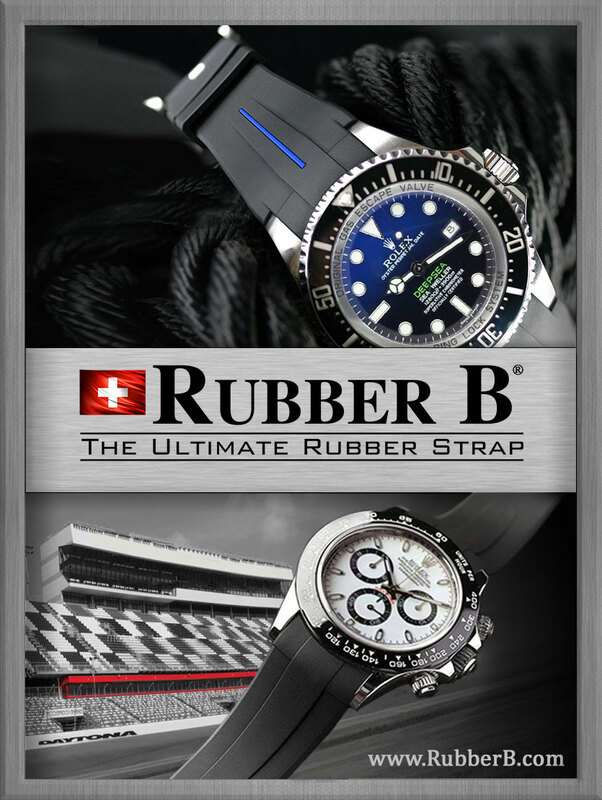 The Rolex Submariner was the preferred diving watch for U.S. NAVY SEALAB Divers." 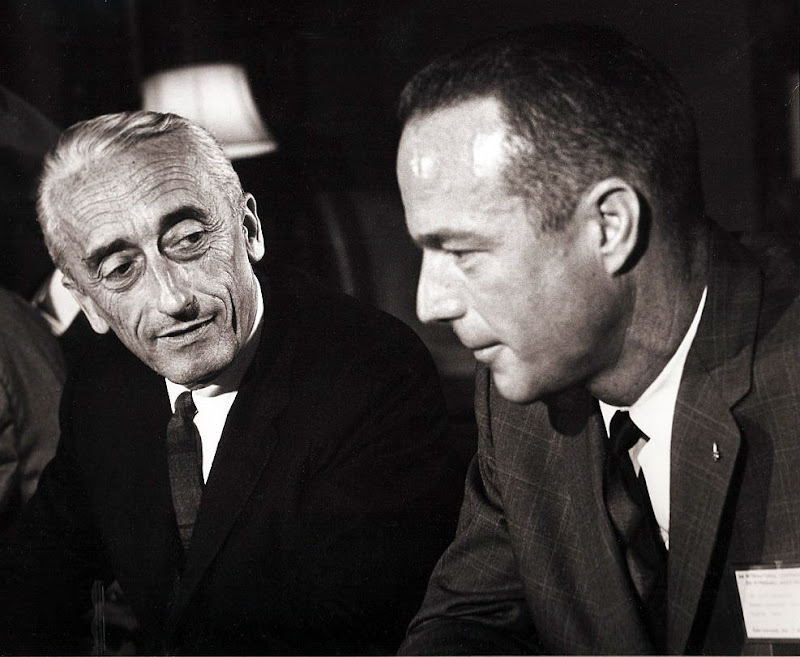 When I originally interviewed Scott Carpenter he mentioned he was inspired to become the first Astronaut/Aquanaut by Jacques-Yves Cousteau who he is pictured with below. Scott Carpenter is pictured below in front of the U.S. Navy SEALAB II Habitat with fellow Aquanauts, and later in this story we will be taking a closer look at the significance of the SEALAB program. "You're looking at the Rolex Submariner. For many years, it's been standard gear for SUBMARINERS, frogmen and all who make their living on the seas." 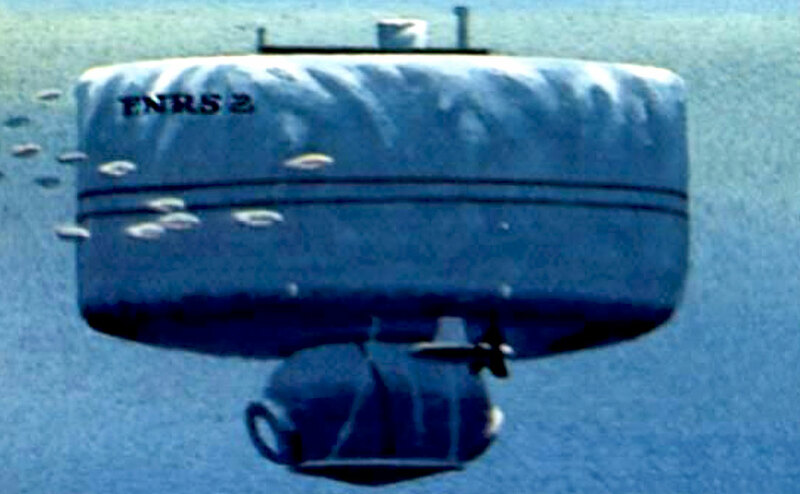 Before World War II occurred, legendary Swiss Physicist August Piccard had begun working on his first bathyscaphe design which is pictured below. 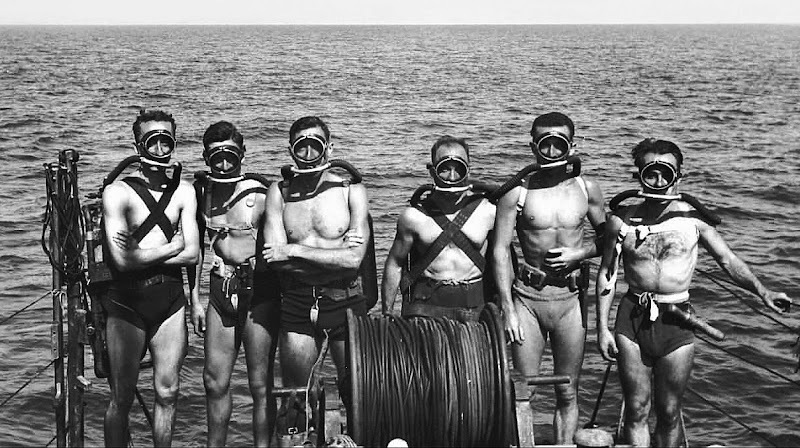 The photo below of the French Naval GRS team, shot in 1947 shows Jacques-Yves Cousteau on the far left, Destroyer Quartermaster Georges, Philippe Tailliez, Destroyer Master Pinard, Frederic Dumas and Second Master Morandiere aboard the L'Elie Monnier as they prepare to dispatch the French FNRS2 Bathyscaphe Submersible (pictured above) for Professor Auguste Piccard. 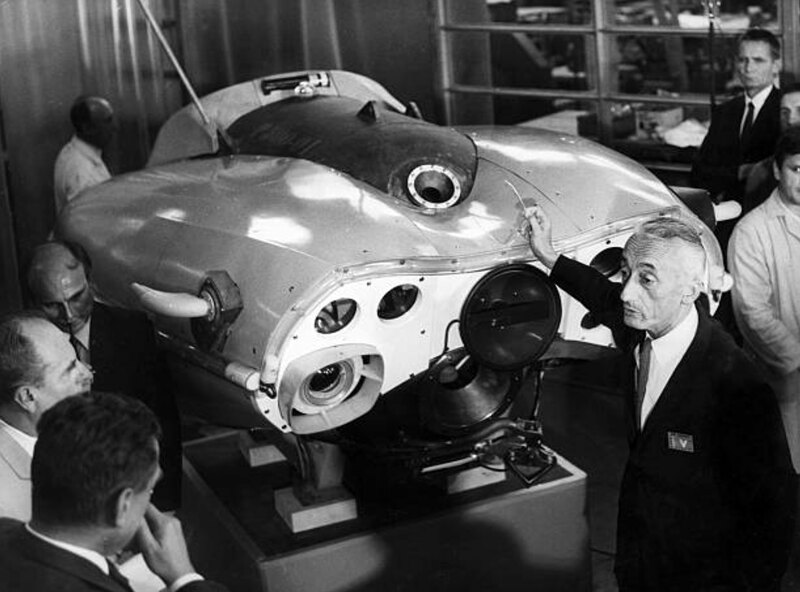 The photo below shows Jacques-Yves Cousteau with Swiss Physicist Auguste Piccard in 1948, in front of the Bathyscaphe F.N.R.S II Submarine which Piccard designed. 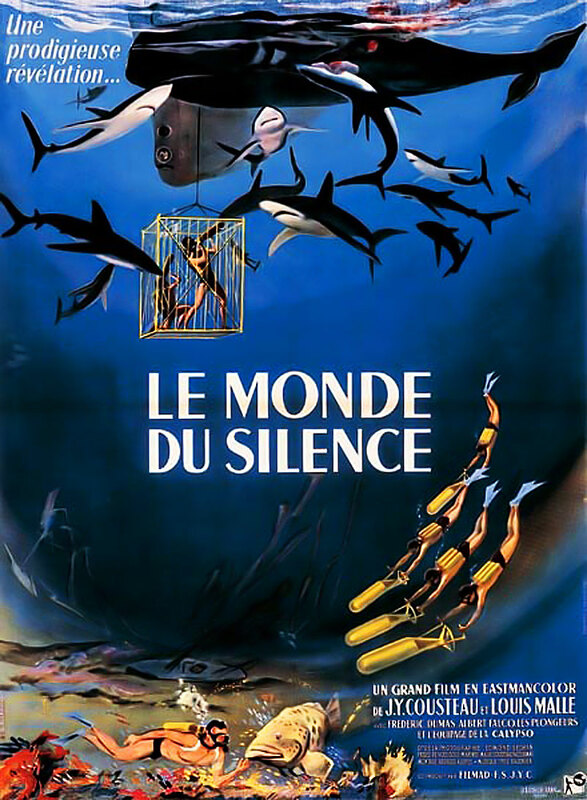 Captain Jacques-Yves Cousteau referred to the The F.N.R.S. II as the "Original Deep-Boat." Auguste Piccard decided to leave the F.N.R.S. III project and decided to build his own Submarine which he named The Bathyscaphe Trieste. In September of 1953, Auguste Piccard and his son Jacques Piccard (pictured below) set a new world depth record at 10,392 Feet (3,167 Meters) with their new submersible. 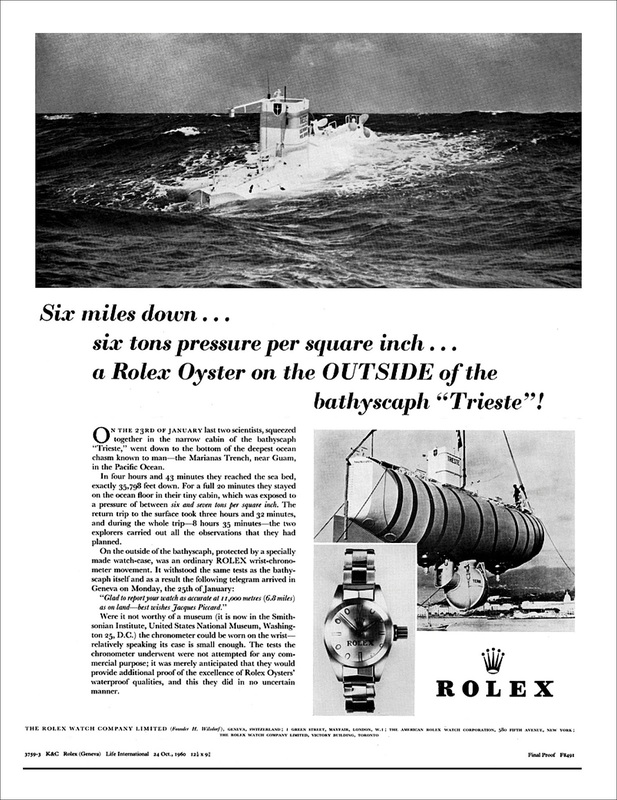 Piccard's Bathyscaphe Trieste had a Rolex DEEP-SEA prototype attached to the outside of the submersible which came back up to the surface in perfect working order. The photo below shows Jacques Piccard with his father and fellow legendary explorer, Auguste Piccard after they successfully set the all-time depth record in September of 1953. Auguste Piccard is in the center of the photo and he is wearing his trademark Beret, and his son Jacques Piccard is standing behind him, holding his arm. 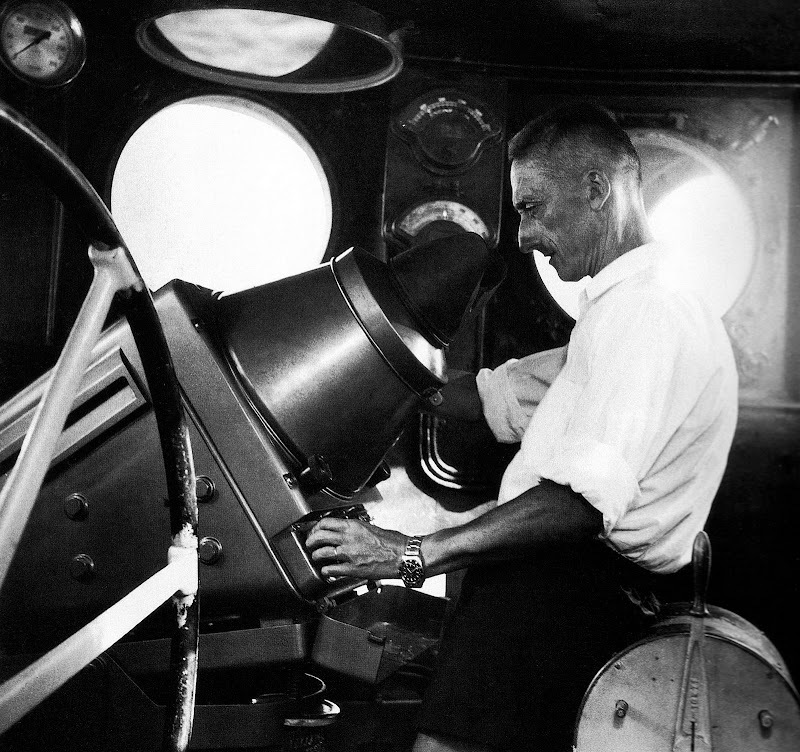 It is fascinating to note Auguste Piccard was 70 years old when this photo was taken in 1953. The photo below is of the actual 1953 Rolex DEEP-SEA Prototype that was attached to the observation chamber of the Bathyscaphe Trieste which is pictured above. 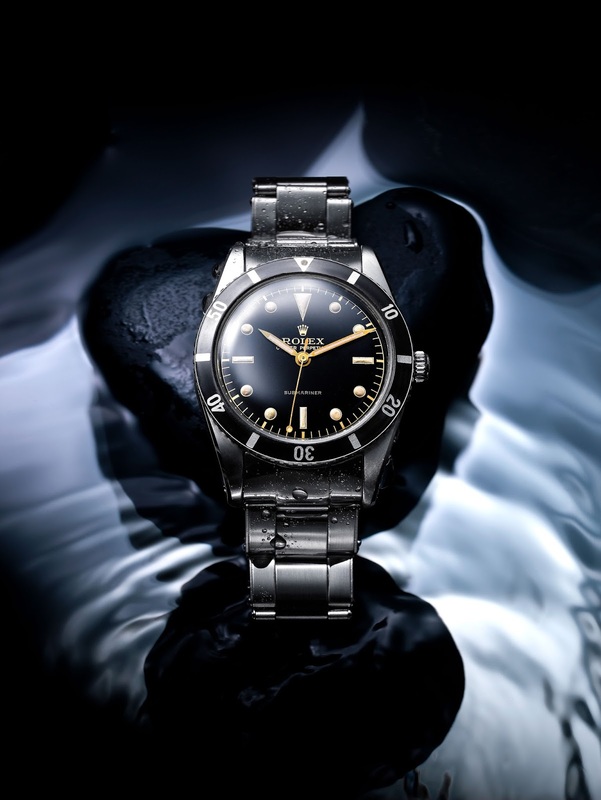 This first super-high resolution version of the 1953 Rolex DEEP-SEA Special is an exclusive photo that appears courtesy of Christies Auction House, who auctioned it in 2005 for around a quarter of a million dollars. 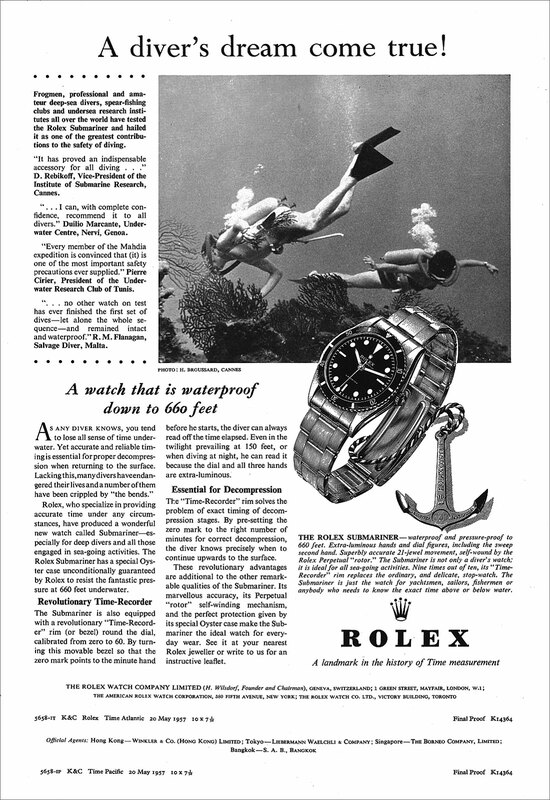 Rolex commemorated the record set in late 1953 by publishing the following Rolex ad in National Geographic in 1954. 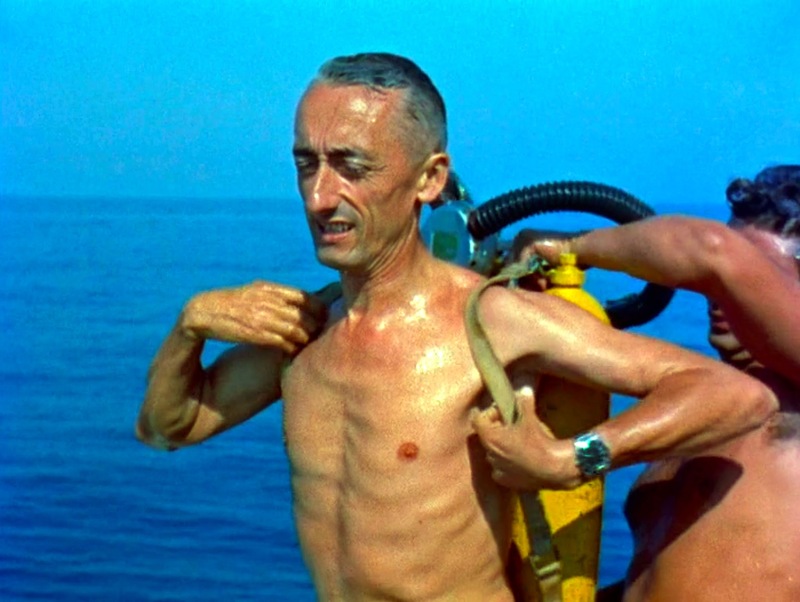 On February 15, 1954, Captain Jacques Cousteau commandeered the F.N.R.S. III down to 13,290 Feet (4,050 meters) 160 miles off Dakar, Senegal in the Atlantic Ocean, beating Piccard's 1953 record, set by the Trieste, by 900 meters to (the floor of the Mediterranean off Naples, 10,392 feet (3,167 m). 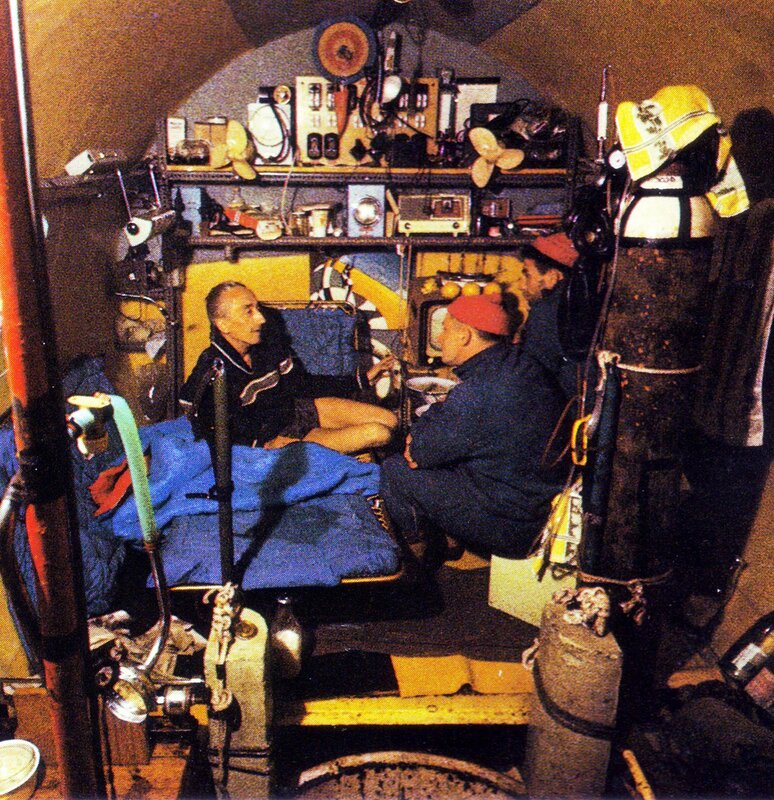 Keep in mind Jacques Cousteau took the F.N.R.S III Submersible down twenty-five times deeper than a standard submarine could go at that time in history. 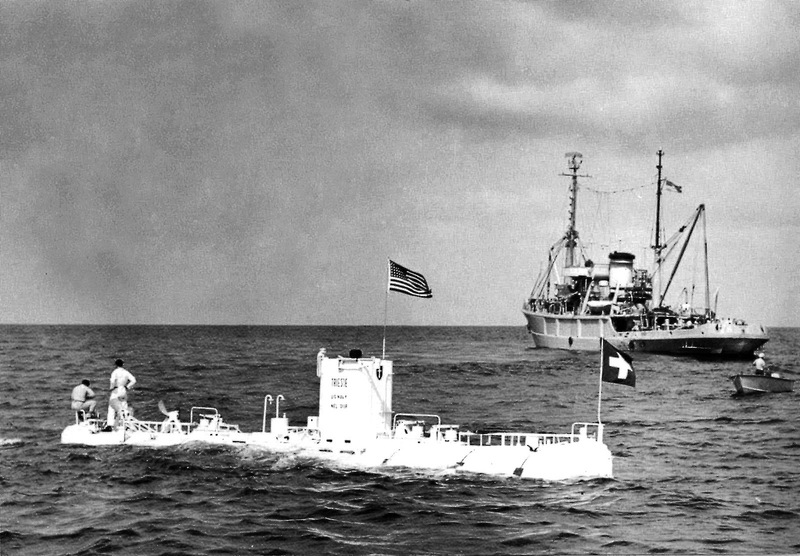 This record was not broken until Piccard had sold his Trieste Submersible to the U.S. Navy in 1958, and on January 23, 1960, it set the all-time depth record in the Challenger Deep, off the coast of Guam when she dove to 10,911 meters (35,797 ft), in the deepest known part of the Earth's oceans, the Challenger Deep, in the Mariana Trench near Guam in the Pacific. The following diagram gives a fascinating perspective on the Mariana Trench and the Challenger Deep. 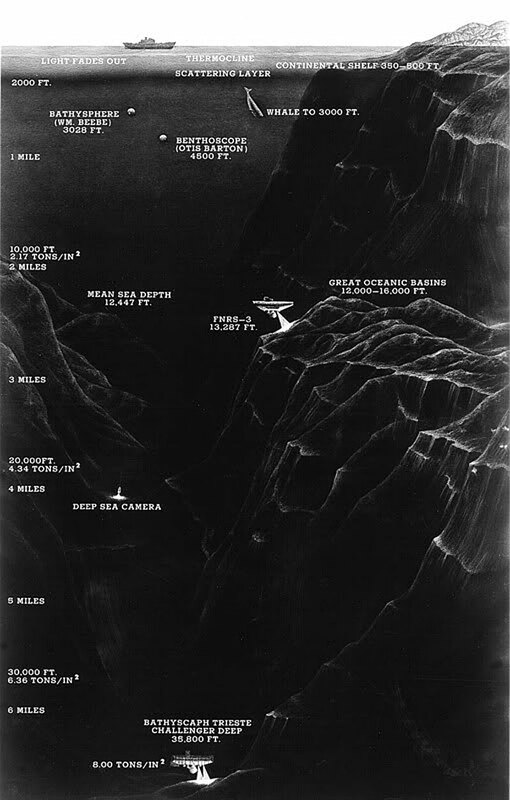 It is profound to note that the Challenger Deep at more than 35,000 feet is deeper than the highest point on earth which is Mt. Everest at just over 29,000 feet. 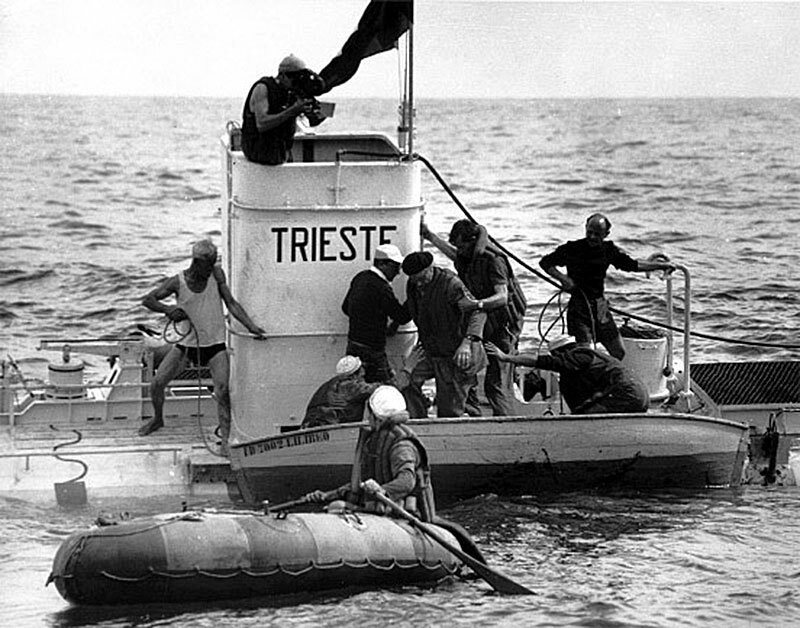 The photo below shows the Bathyscaphe Trieste out in the Pacific Ocean as she prepares to set the all-time depth record of 36,070 Feet on January 23, 1960. 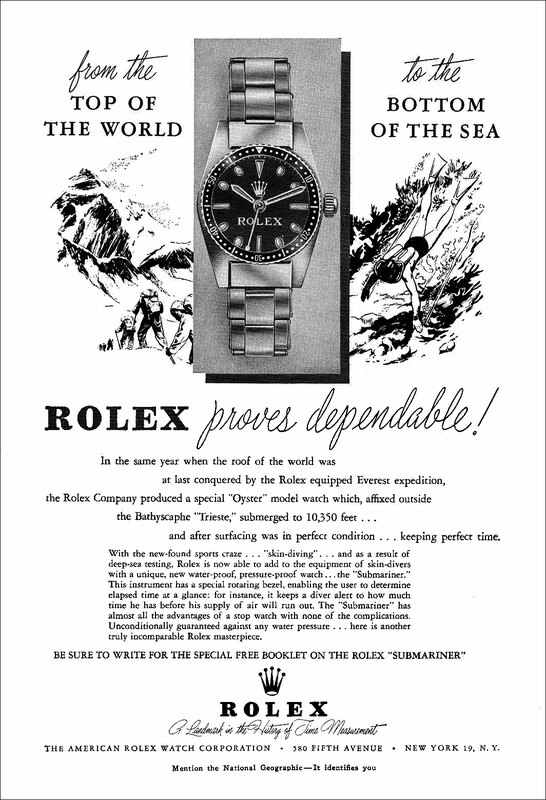 The following Rolex Magazine appeared in the international version of Life Magazine on October 24, 1960, and it perfectly contextualizes the way Rolex saw this achievement at the time. You can click on the image to make it easier to read the text. A Rolex DEEP-SEA Special prototype similar to one that was attached to the outside of the Bathyscaphe Trieste in 1960 is pictured below. 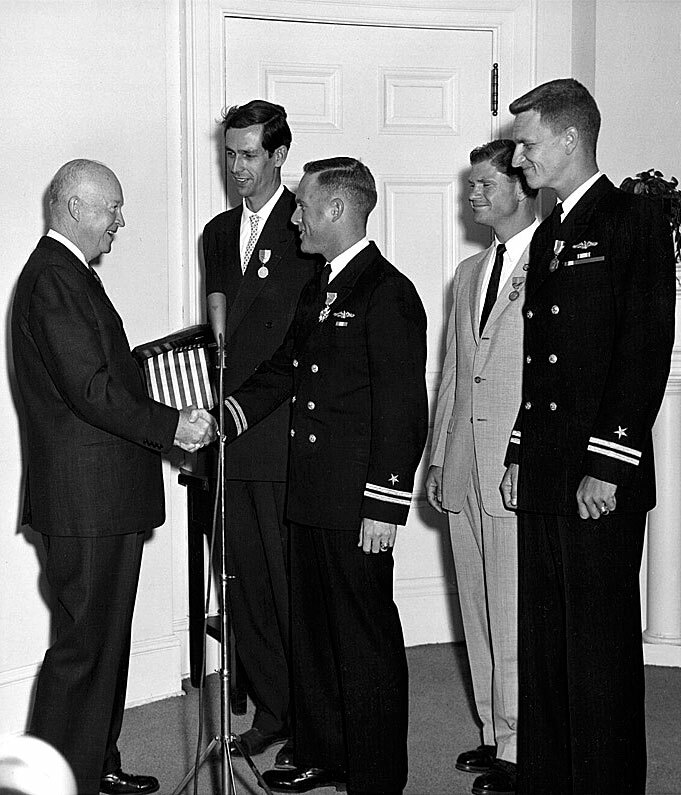 Presiden Eisenhower is pictured above congratulating Jacques Piccard and Don Walsh at the White House in Washington D.C.
As we see in the picture below, President Eisenhower as the first U.S. President to wear a Rolex. 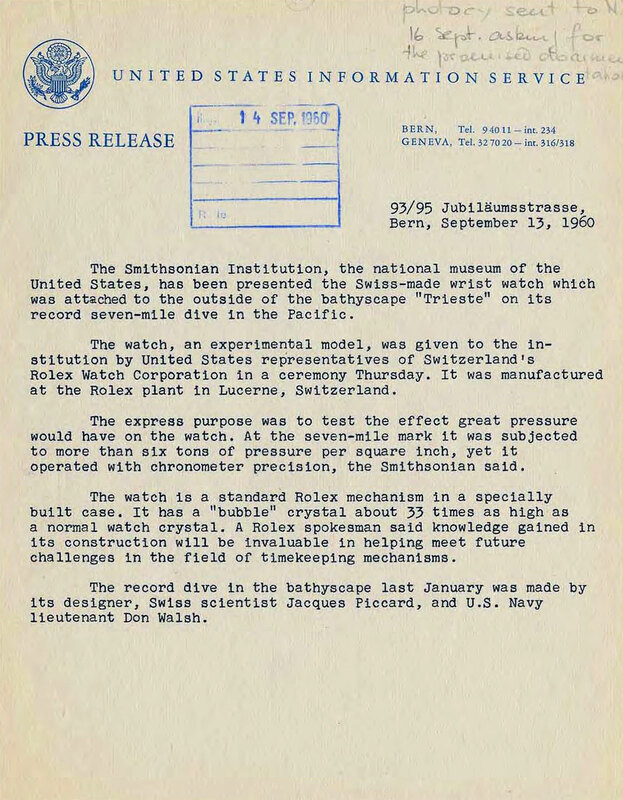 The press release below tells the story of the actual Rolex DEEP-SEA Special Prototype watch, and how it ended up in the Smithsonian Institute. 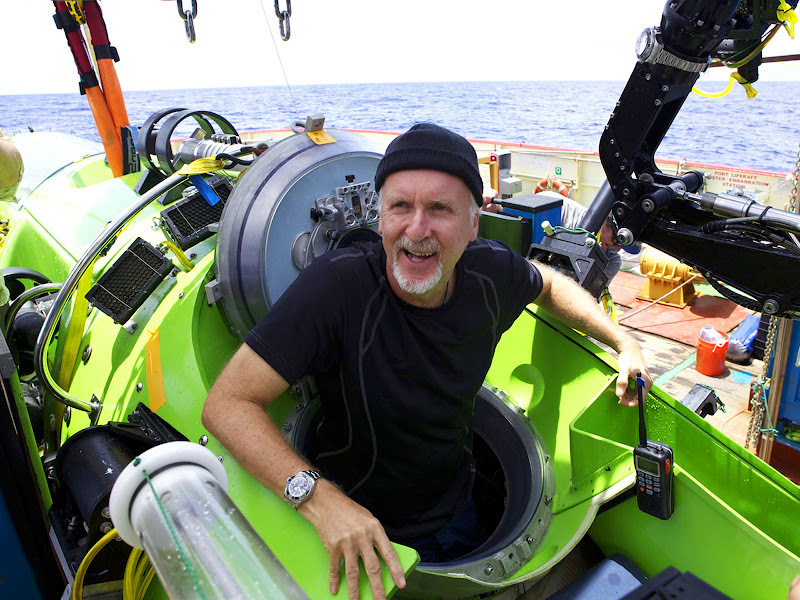 This major historical Rolex record has not been broken to this day, but director and explorer James Cameron basically matched it in 2012, and of course his submersible named the DEEPSEA CHALLENGER had a new generation of Rolex DEEP-SEA prototype attached to the outside which came back to the surface in one piece. I covered this amazing event live on Jake's Rolex World as it unfolded out in the south Pacific ocean. In this photo from Rolex, we see the two generations of special Rolex DEEP SEA watches that both traveled down to the deepest known part of the ocean, both setting all-time depth records. The first is the 1960 Rolex DEEP SEA SPECIAL which dove down attached to the outside of the U.S. Navy Bathyscaphe Trieste, and the second one also dove down into the Challenger Deep in 2012 attached to James Cameron's DEEPSEA CHALLENGER. 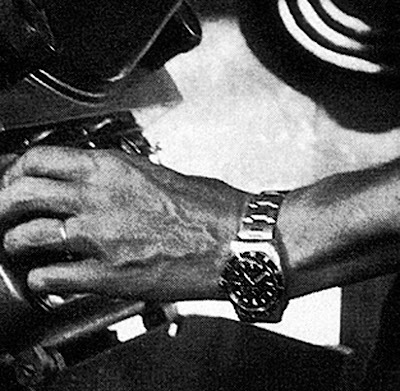 Jacques Yves-Cousteau is considered to be the father of Scuba Diving and modern underwater exploration, and he worked with Rolex in the early 1950s to develop the Rolex Submariner as seen on his wrist below in 1953. I believe Rolex named the Submariner as an homage to Jacques-Yves Cousteau. 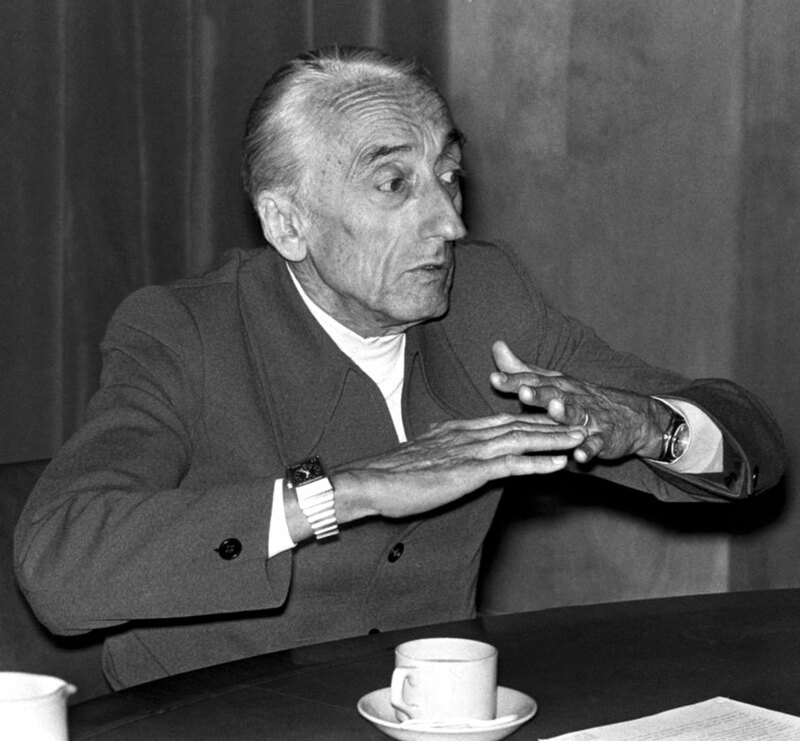 Jacques-Yves Cousteau was close friends with Rolex Director, Rene-Paul Jeanneret, who he worked with on the development of the Rolex 'Submariner' Diving Watch. I believe Rolex named the Submariner as a tribute to Jacques-Yves Cousteau, and I believe "Submariner" was intended to mean, "Mariner who explores below (Sub) the Sea, or pilots a Submarine". 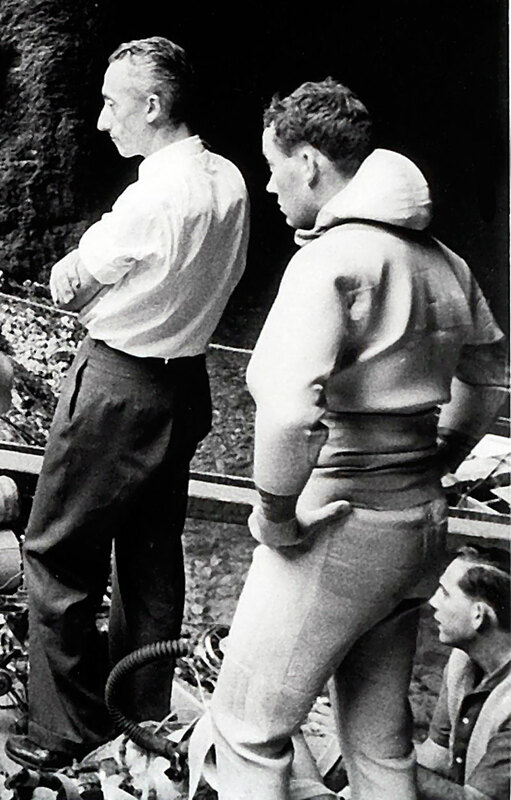 Jacques-Yves was instrumental in the development of the Rolex Submariner, and Jean-Michel and I discussed the image below taken in 1953 when his father was testing Rolex Submariner prototypes with his team aboard the Calypso in the Mediterranean. 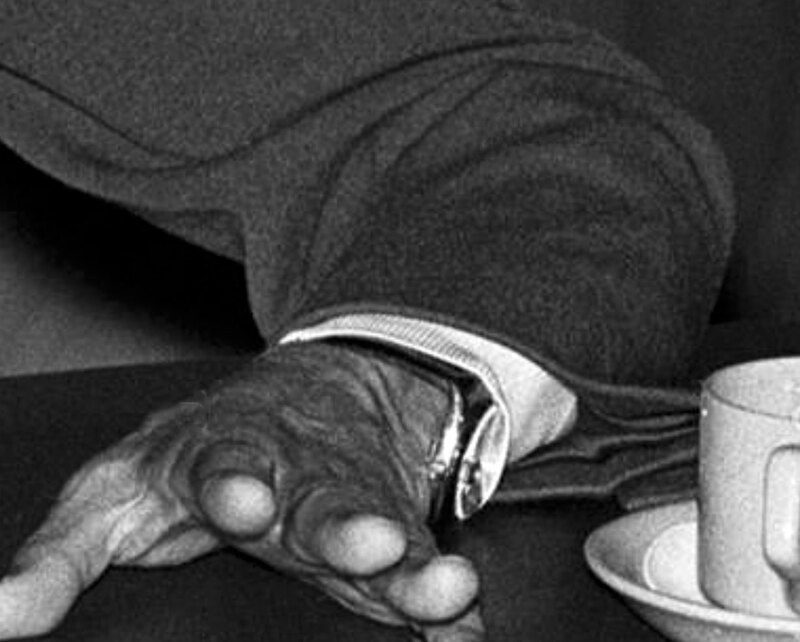 The close up photo above of Jacques-Yves Cousteau shows him wearing an early Rolex Submariner with pencil hands that looks like the similar vintage model seen below. 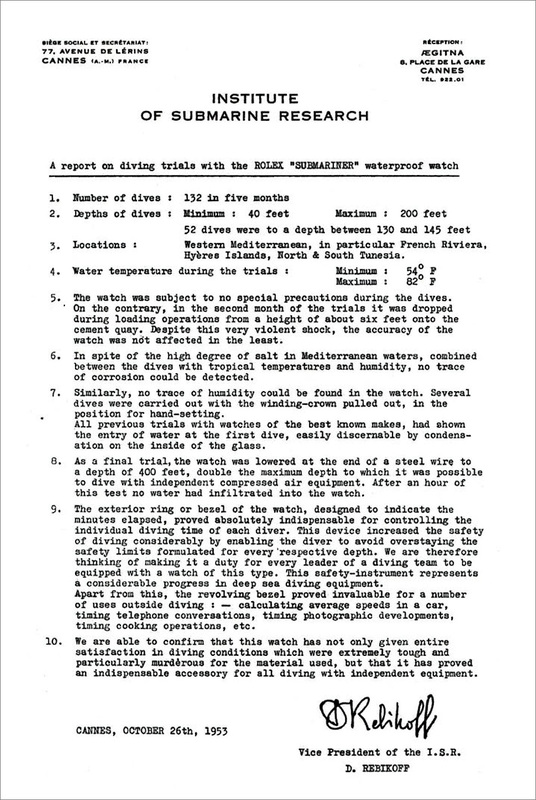 The document below confirms Jacques-Yves Cousteau and his team were testing Rolex Submariner prototypes in early 1953. 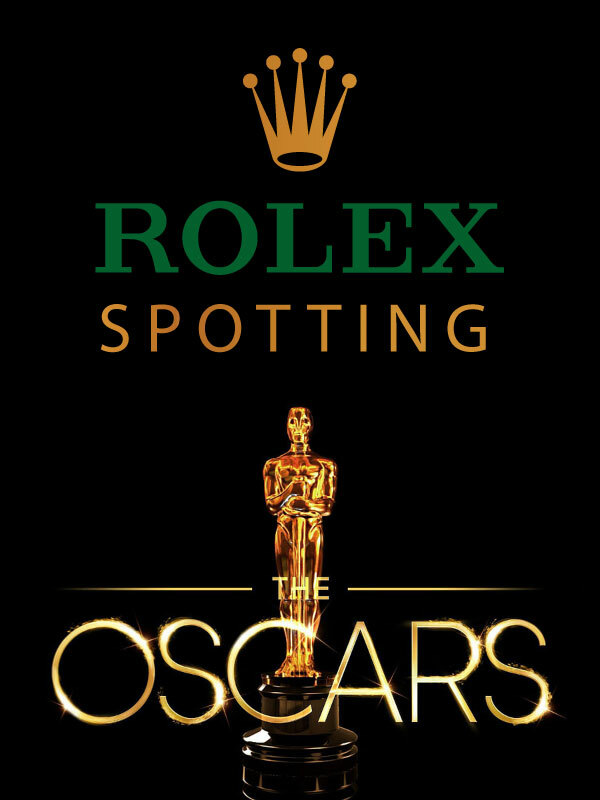 Jacques-Yves Cousteau's film, The Silent World won the Academy Award in 1957 for Best Documentary, which is the same year the vintage Rolex Submariner magazine ad seen below is from. 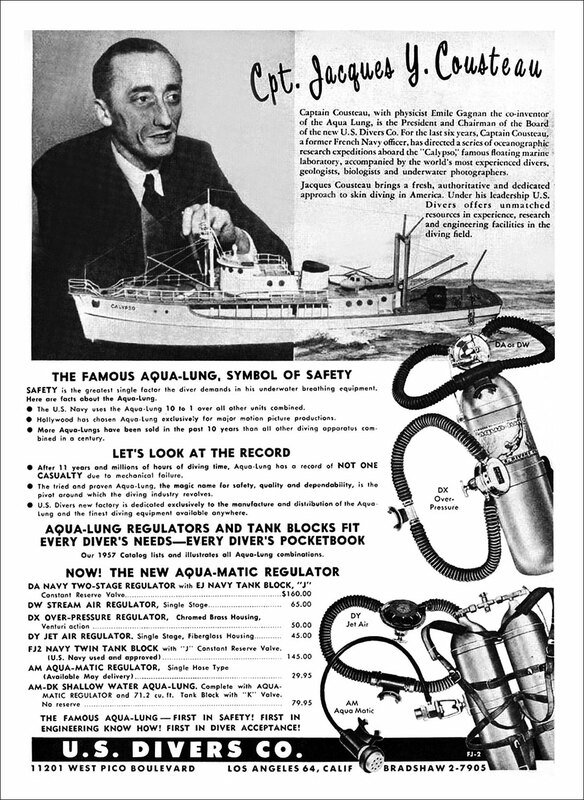 The magazine ad below which prominently features Jacques-Yves Cousteau is from 1958 who at the time as the Chairman of the Board of the new U.S. Divers company which sold the aqua-lungs he co-invented with Emile Gagnan. Jacques-Yves Cousteau was not alone as being a radical explorer who constantly pushed the envelope. 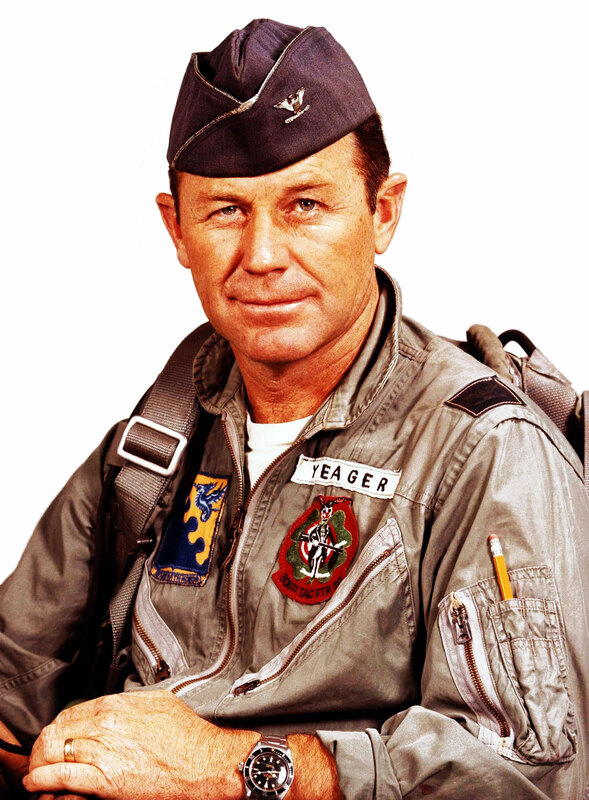 Other men of such stature also chose the Submariner as their tool watch including Chuck Yeager as we see in the 1956 photo below with his Rolex 6538 'Big Crown' Submariner on his wrist. 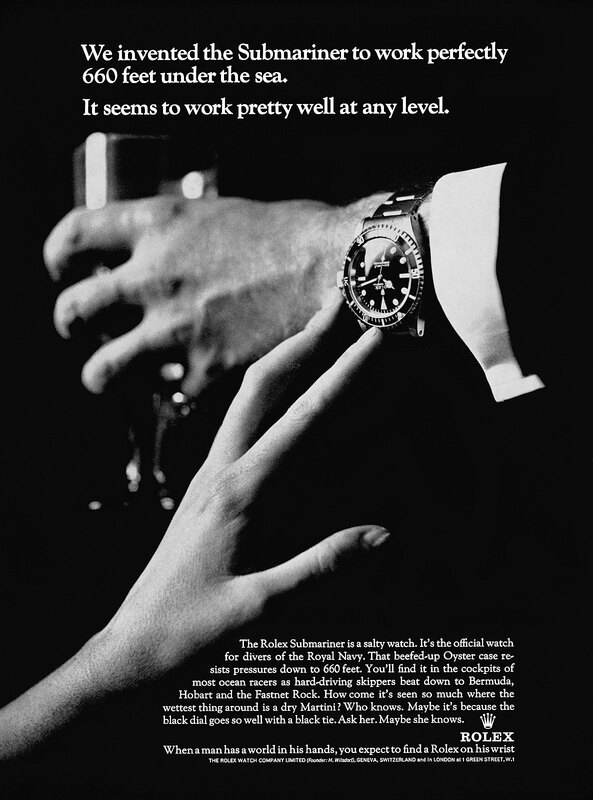 The Rolex Submariner ad from 1963 follows the aquatic theme as the essence of the Submariner. The Photo below shows the U.S. 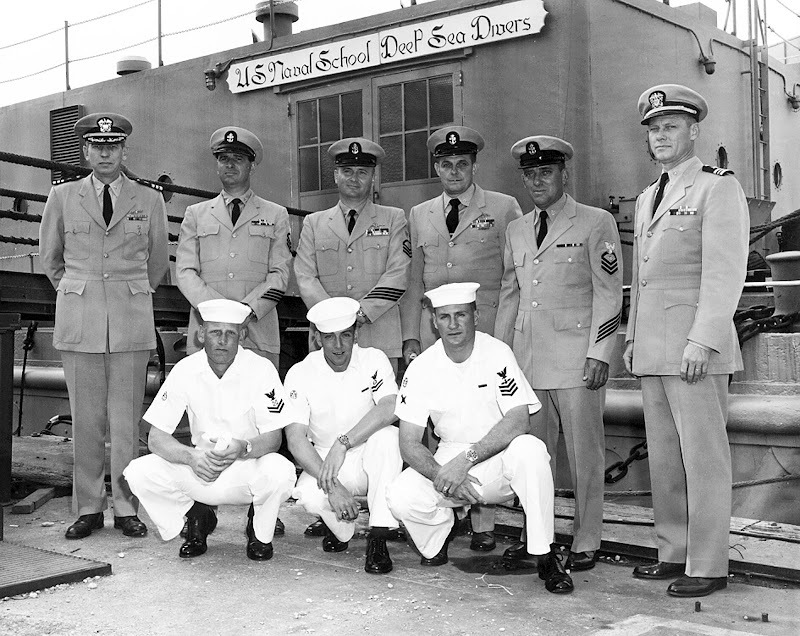 Naval School of DEEP-SEA DIVERS who also wore Rolex Submariner watches. 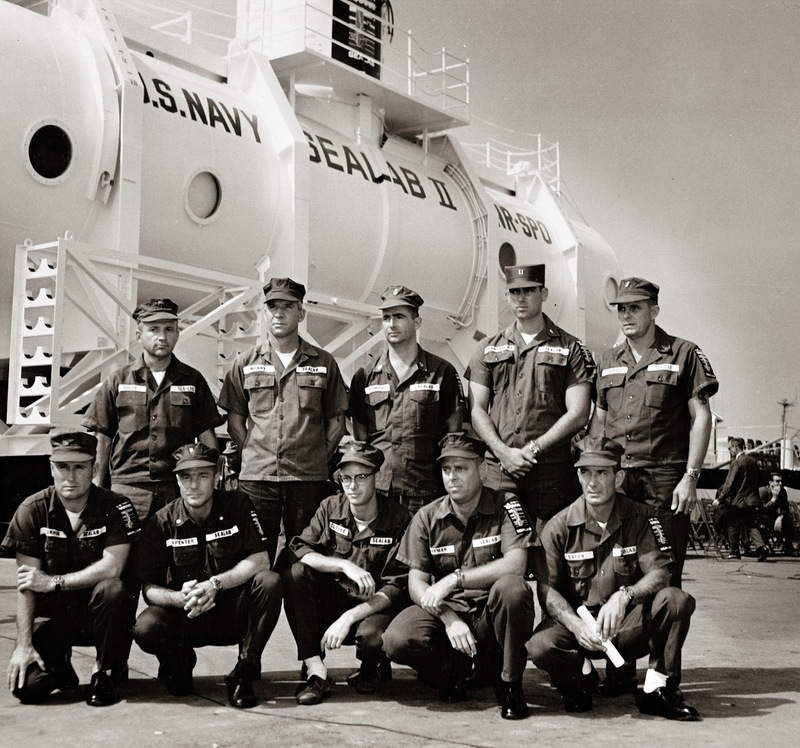 The man standing third from the left is pioneering saturation diver Bob Barth who went on to participate in SEALAB I, II & III. 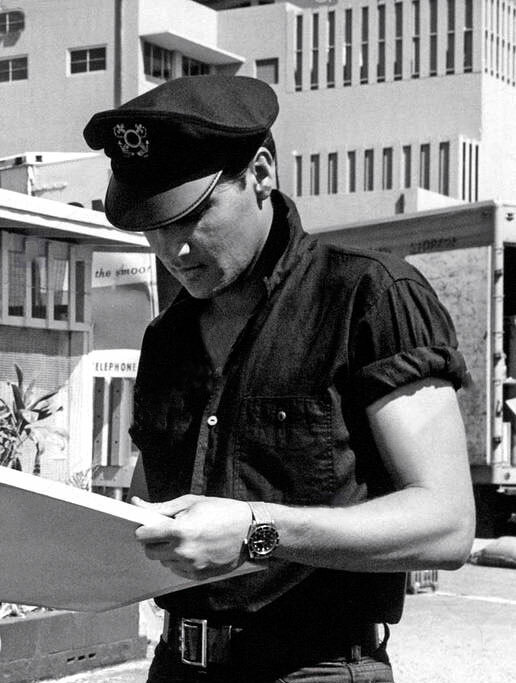 The popularity of the Rolex Submariner carried over into popular culture with actors like Elvis Presley as seen below in 1962 on the set of Girls, Girls, Girls wearing his Submariner 'Big Crown' on a leather strap. 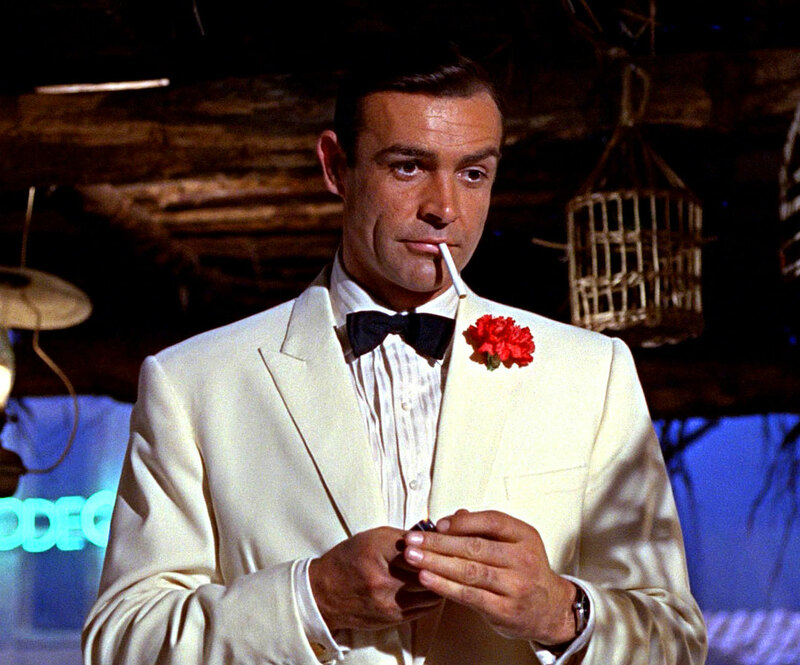 Sean Connery also wore a Big Crown Rolex Submariner [Reference 6538] in the early James Bond movies like Dr. No which debuted in 1962. 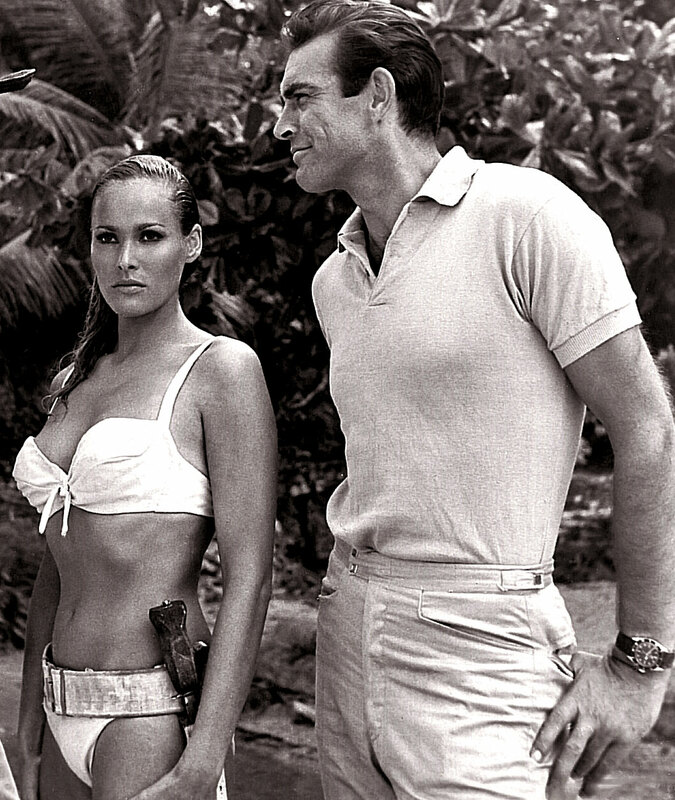 Sean Connery returned in Goldfinger in 1964 still sporting his big crown Submariner as seen in the photos below. 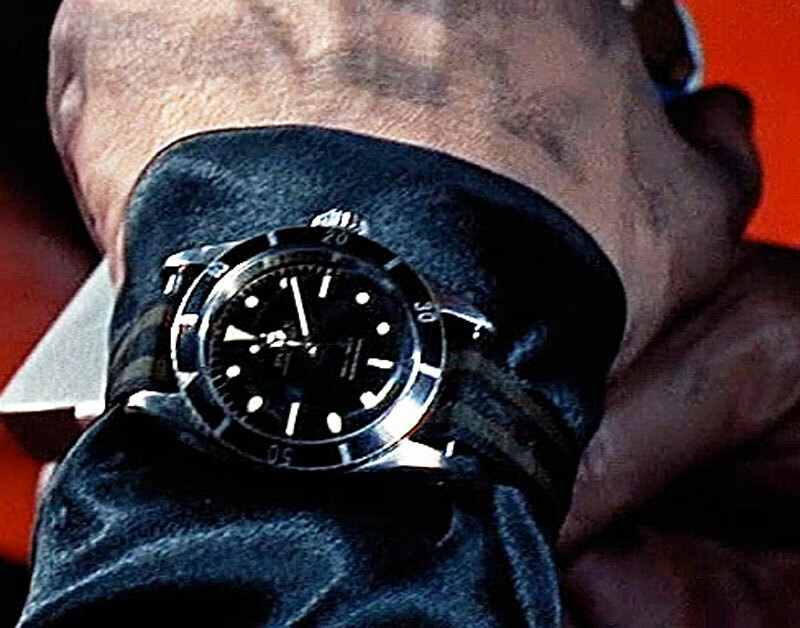 In the 1964 movie Goldfinger, Sean Connery as James Bond wears a Rolex Submariner [Reference 6538] as pictured below, on a Regimental belt strap. 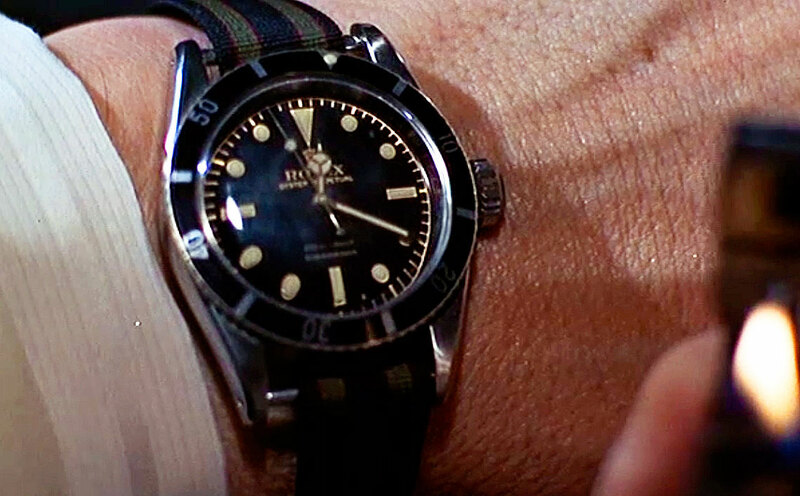 In Goldfinger Sean Connery is in an early action scene were he is wearing his Submariner over his SCUBA suit as seen below. 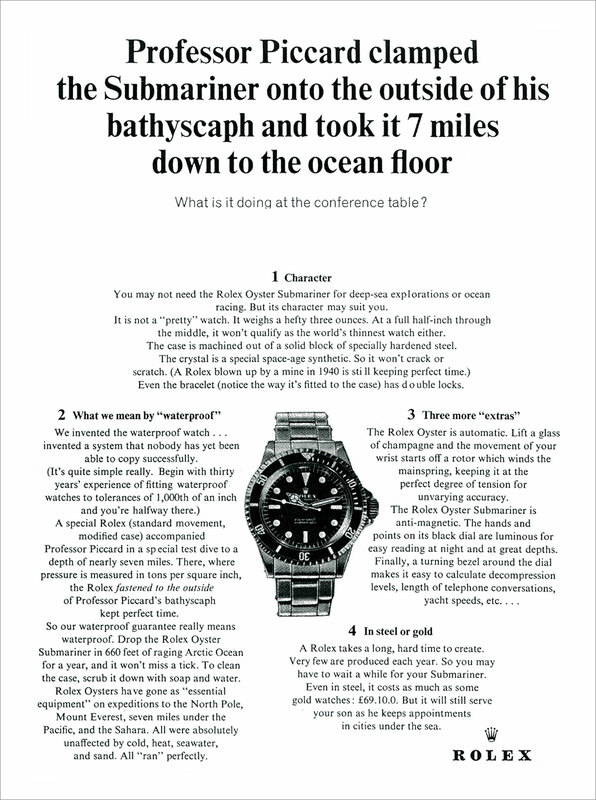 Below we see a 1966 Rolex Submariner magazine advertisement that talks about how Rolex came up with the Submariner and how it was designed for seagoing men. 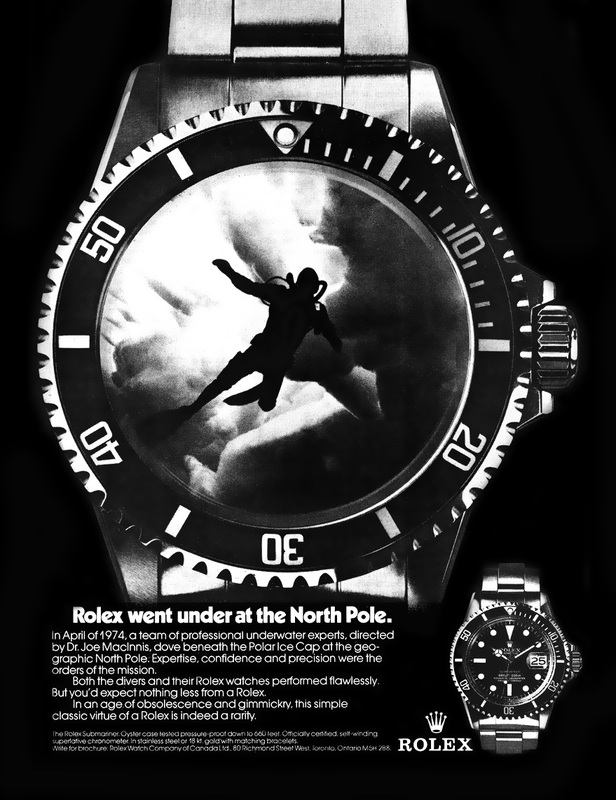 The next Rolex ad seen below is from 1968 and illustrates how focused Rolex was on undersea exploration. 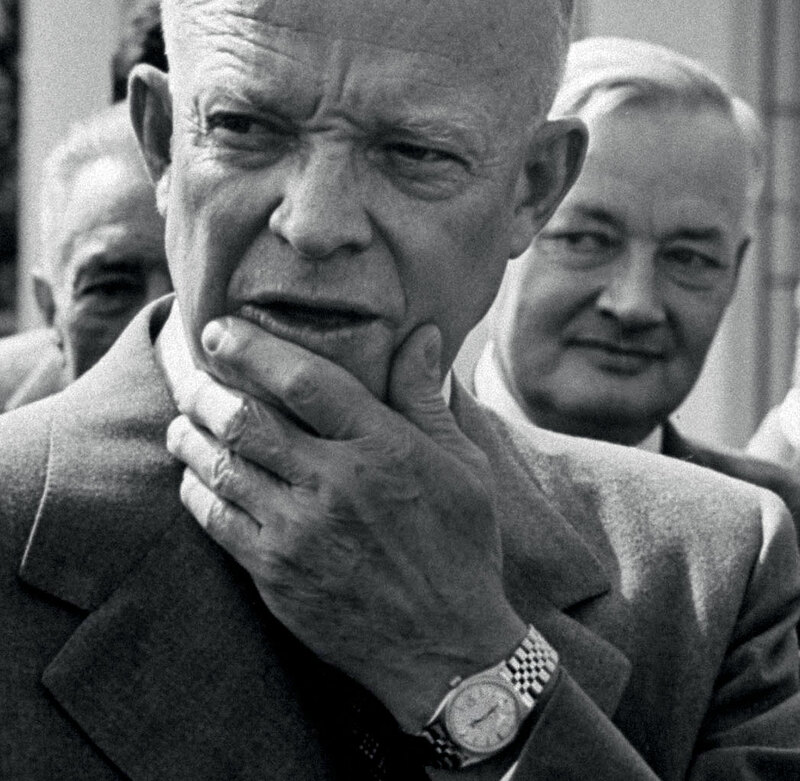 We just learned why the Rolex Submariner was named the Submariner! But where did the Rolex SEA-DWELLER get its name from? You are about to find out! 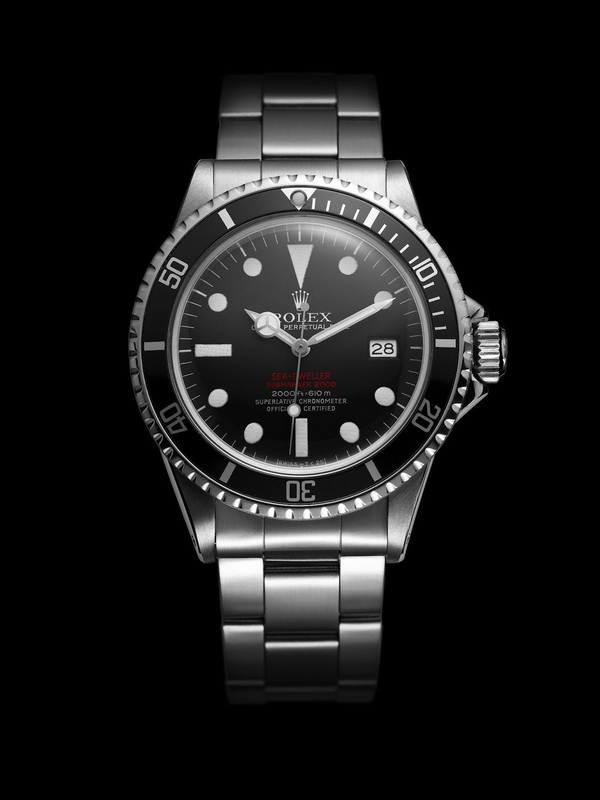 Before I came along to set the record straight, there was a falsely perpetuated myth that said Rolex had developed the SEA-DWELLER with the French diving company named COMEX. This was not true. 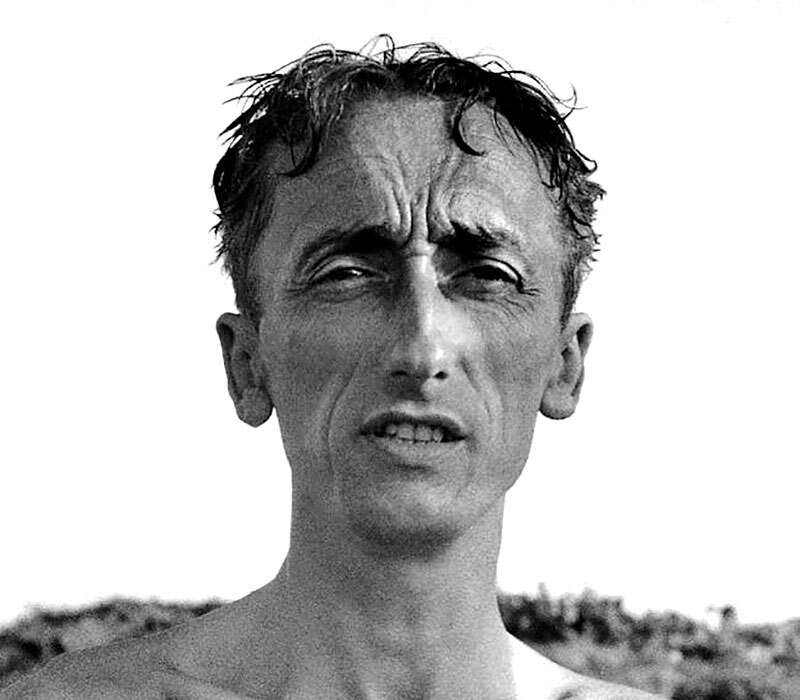 The photo below was taken in Southern France in Fontaine de Vaucluse in 1955 and it shows a young Jacques-Yves Cousteau at 45 years of age standing in front of a much younger Henri-Germain Delauze–at age 26–who would go on to found the revolutionary French diving company, COMEX. At the time Dalauze was a Cousteau team diver. This image is so profound I decided to crop and zoom it in for you. What makes this image so profound? It is an image of two French revolutionaries. Two men who would forever change the world of diving. 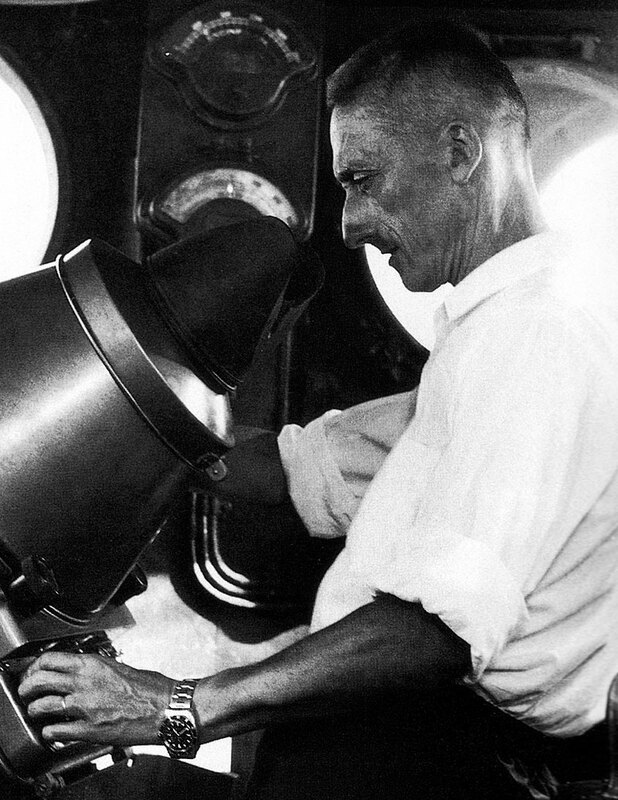 Jaques-Yves Cousteau co-invented the Aqua-lung which brought SCUBA Diving to life and Henri-Germain Delauze ended up being perhaps the greatest beneficiary of this technology as it evolved into saturation diving which Comex became a major pioneer in. 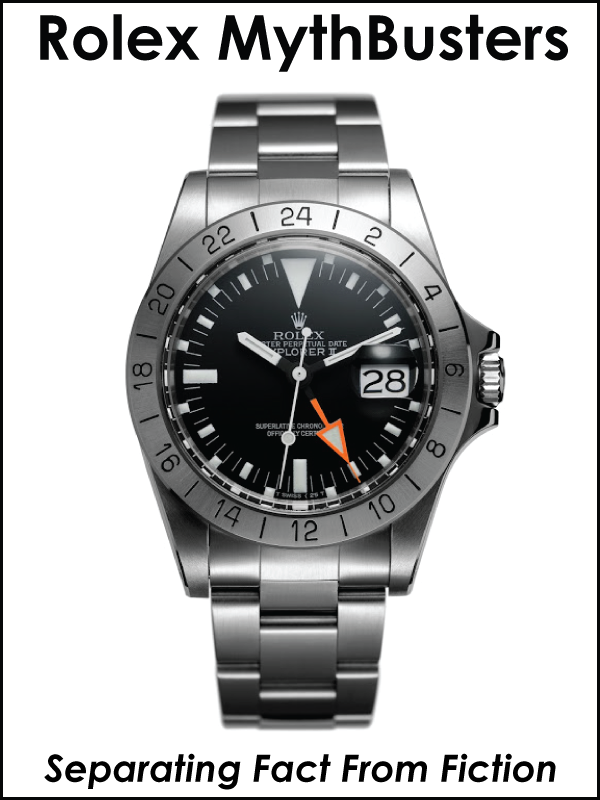 I interviewed Henri-Germain Delauze back in 2009 and he confirmed, it was the U.S. Navy SEALAB program that co-developed the SEA-DWELLER with Rolex—not COMEX. The photo below of Henri-Germain Delauze is from a story I wrote on his career achievements. In September 1962, Jacques Cousteau immersed his Calypso crew into their most ambitious adventure to date known as the Conshelf Project. The Conshelf project was the brainchild of a U.S. Navy Medical Corps., Captain named Dr. George Bond. Dr. 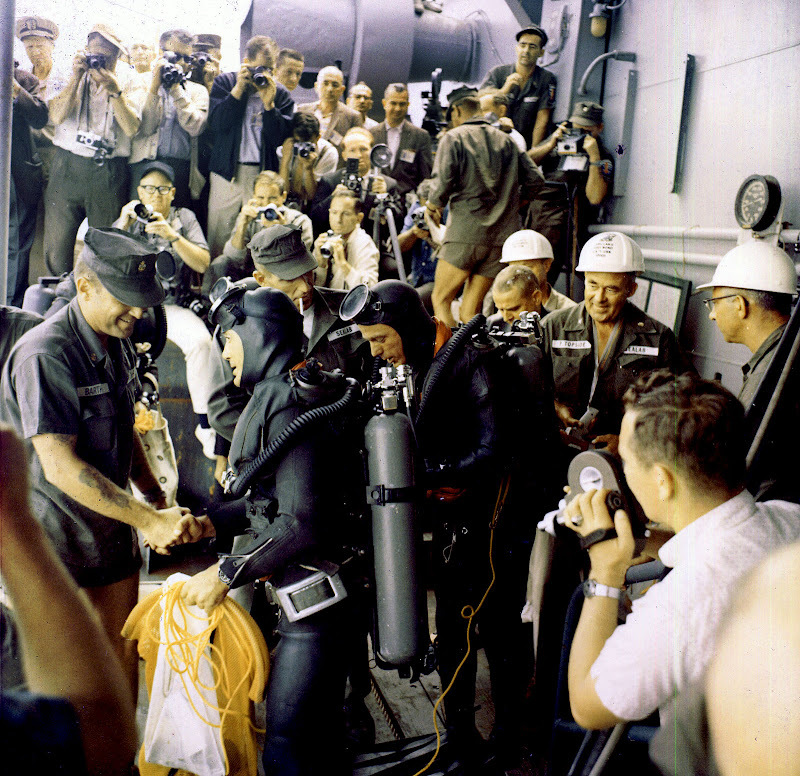 Bond conceived a new method of diving known as the "saturation method" which later became know as "saturation diving." 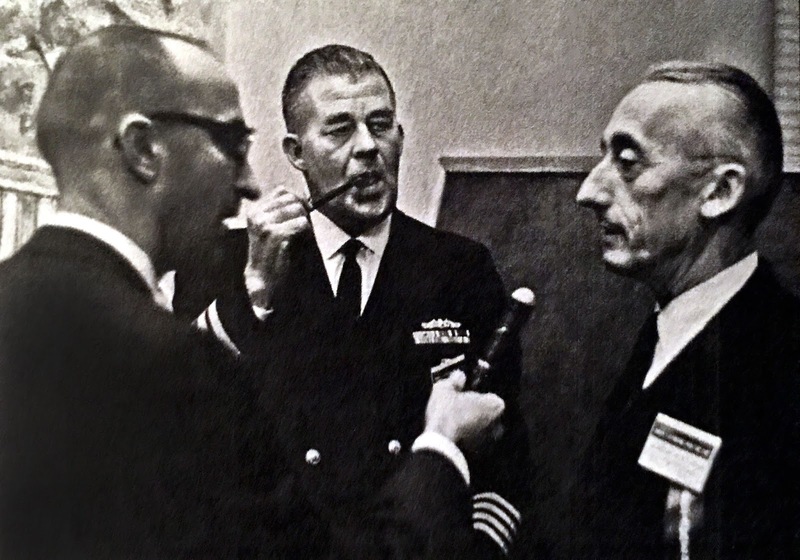 The photo below was taken in 1968, and it shows U.S. Navy Doctor George Bond being interviewed with his close associate, Captain Jacques-Yves Cousteau. In the interview, they were discussing U.S. Navy SEALAB III. Saturation diving created the opportunity for an underwater habitat where divers could live in an underwater house/structure/habitat so they could work on the sea floor, without having to decompress by coming up to the ocean's surface after each dive. Dr. 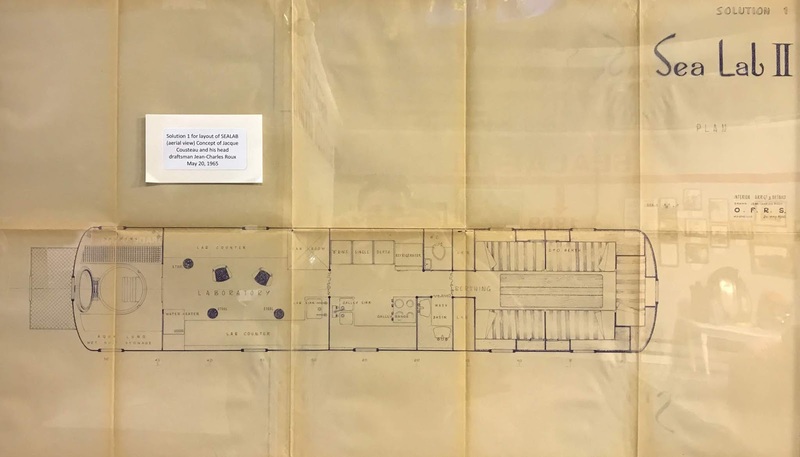 Bond submitted his plan to build this underwater habitat for saturated divers to the U.S. Navy and the U.S. Navy initially rejected the idea–so Dr. 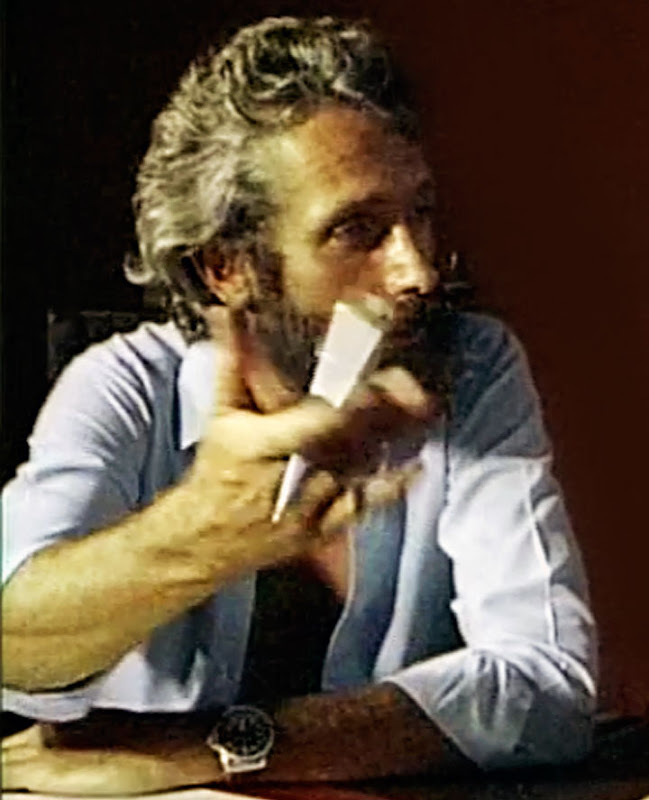 Bond submitted his idea to Jacques Cousteau and his Calypso diving team–and after careful evaluation Cousteau decided to undertake the project. 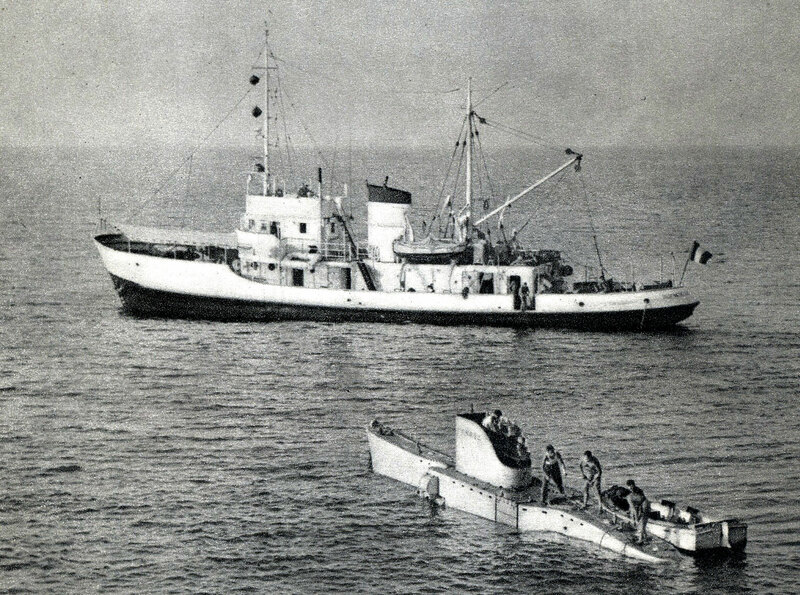 Conshelf I got underway in September of 1962, and according to Jacques Cousteau, the objective was "Two men living for one week in a small building at a depth of 37 feet and working several hours a day at 65 feet." The Conshelf I structure was essentially a huge drum about the size of an industrial shipping container that was ballasted with an open hatch for the divers to enter and exit the underwater house. In the photo below we see Conshelf I's barrel shaped habitat being tested for leakage before being submerged for the experiment. I may be wrong, but I think I recognize fellow DEEP-SEA Submariner, Jacques Piccard up on the top deck, leaning back, in the white shirt with dark slacks filming with a camera in his hand. 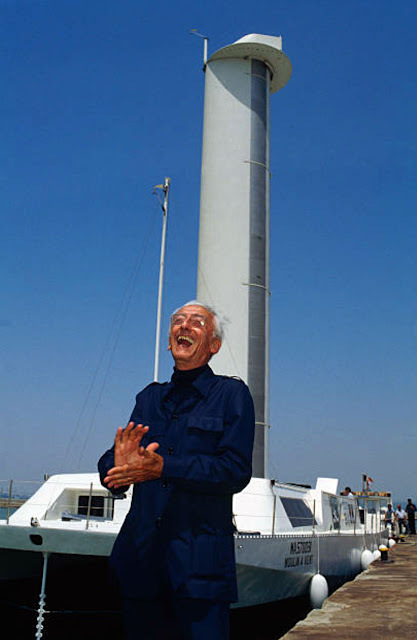 Jean-Michel Cousteau who is Jacques-Yves son mentioned he was close friends with Jacques Piccard. 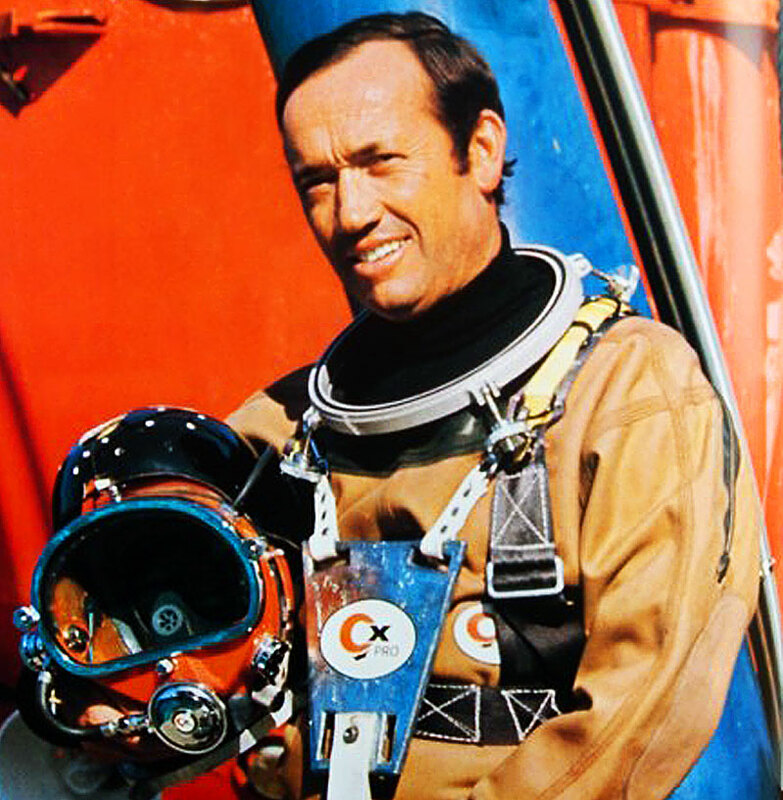 Jacques-Yves Coustea previously worked with Jacques Piccard on the Bathyscaphe Project, and would work with Piccard again in 1964 on a new floating laboratory nicknamed "Mysterious Island" and again in 1965 from April 13 to May 10 on a geophysical and acoustical mission along the south coast of France. It is kind of shocking we have never seen a photo of the two Jacques together, but this may be the first one. 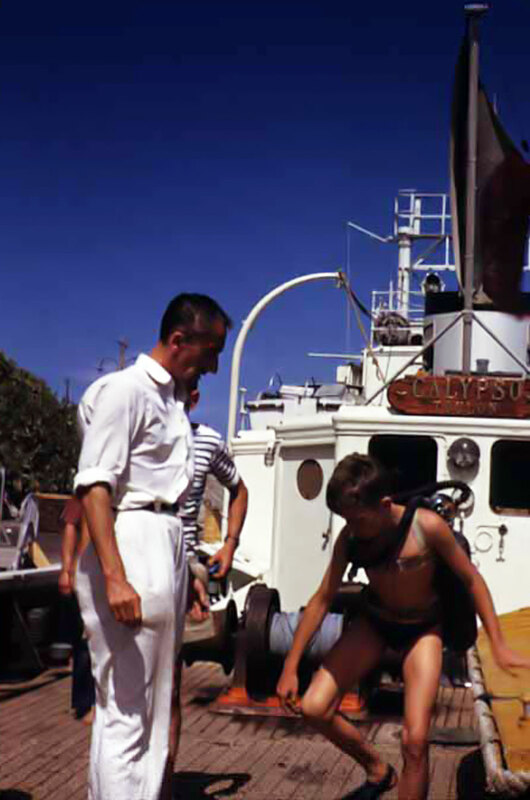 Cousteau, of course, is located in the bottom right hand corner of the photo seen above on the deck of the Calypso. 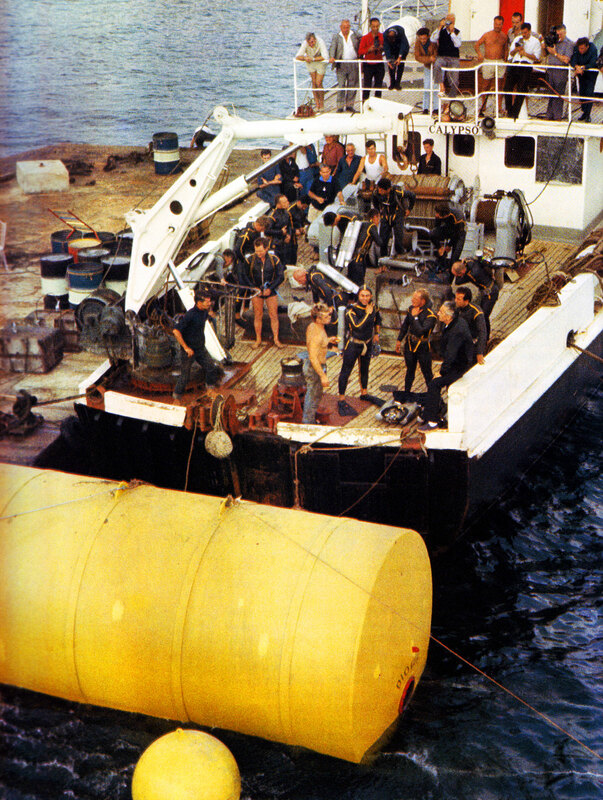 Albert Falco and Claude Wesly of the Calypso diving team (pictured below wearing red caps) swam into history when they became the first "Oceanauts [French]" or "Aquanauts [American]" or "SEA-DWELLERS [ROLEX]" to live or "DWELL" under the SEA. In the photo above we see Jacques Cousteau visiting with Falco and Wesly inside the Conshelf I habitat. 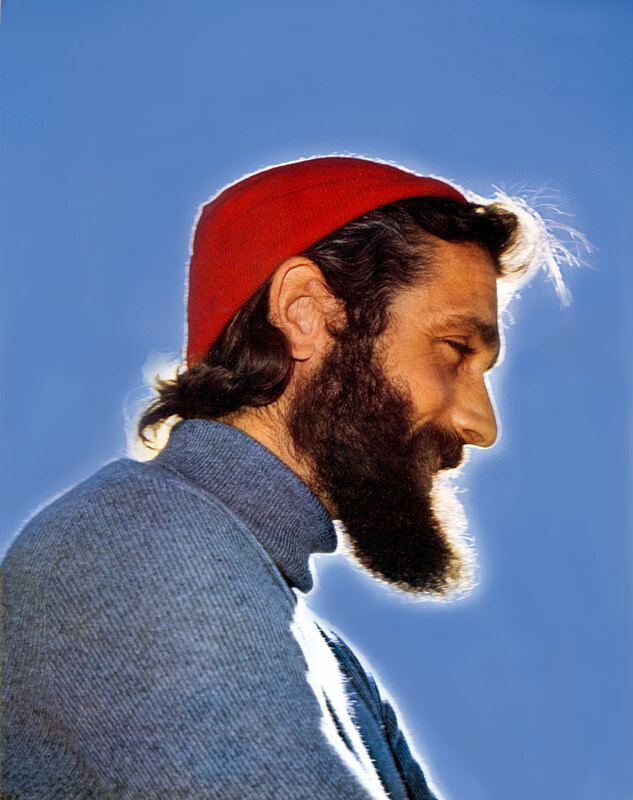 When I interviewed Jacques-Yves Cousteau's son, Jean-Michel Cousteau recently for this article, he mentioned he also visited Falco and Wesly. I think it is likely Jean-Michel took the photo above. So not only was Jacques-Yves Cousteau the inspiration for the original Rolex Submariner, but he was also the inspiration for the Rolex SEA-DWELLER as well. Ironically, it was the U.S. Navy SEALAB Aquanaut, Bob Barth who would develop the helium gas escape valve for the SEA-DWELLER in partnership with T. Walker Lloyd and Rolex in Geneva. 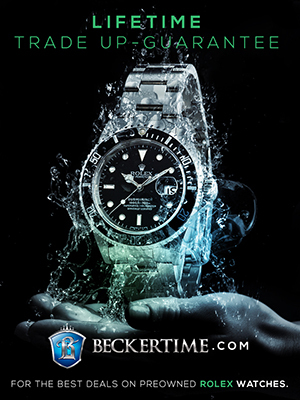 My great pal, Jose from Perezcope.com and I worked together on creating this amazing poster titled 'The History Of The Rolex SEA-DWELLER: Rolex's Conquest Of The Ocean", which is amazing!! Be sure to right-mouse-click on the poster below and open it in a new window to see all the amazing high-resolution detail. This timeline is also available as a magnificent poster on Perezcope.com in the timelines section. In the photo below taken later in Jacques-Yves Cousteau's life we seen him wearing a Rolex SEA-DWELLER. 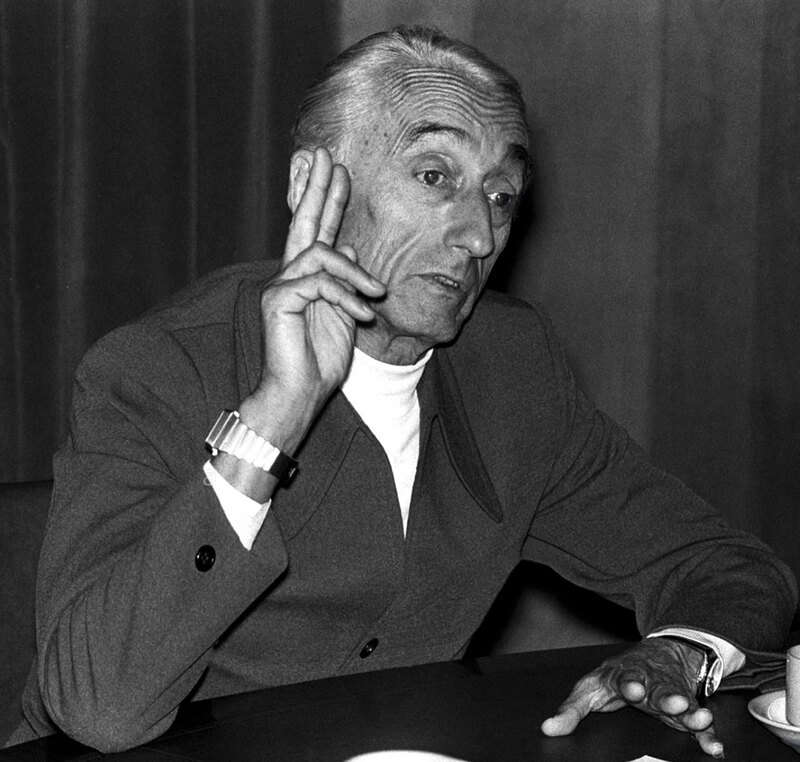 In my opinion, Jacques-Yves Cousteau was and remains the living personification and embodiment of both the Rolex Submariner and SEA-DWELLER. A few final thoughts on the subject of the Rolex SEA-DWELLER model. 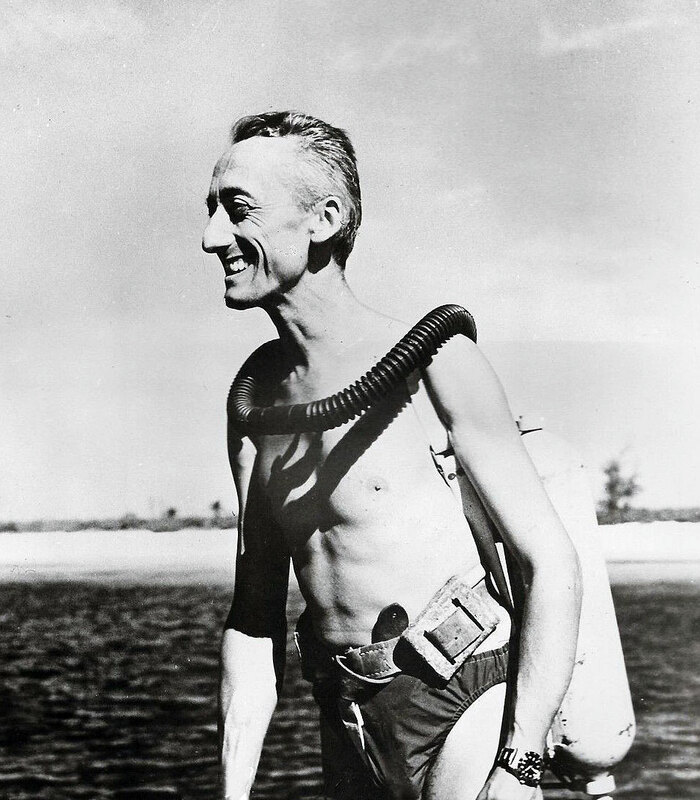 As we learned, Jacques-Yves Cousteau made a significant contribution toward being able to film underwater, which helped spurn on a new genre of science fiction characters including The Creature From The Black Lagoon, as well as Auquaman, and The Man From Atlantis. 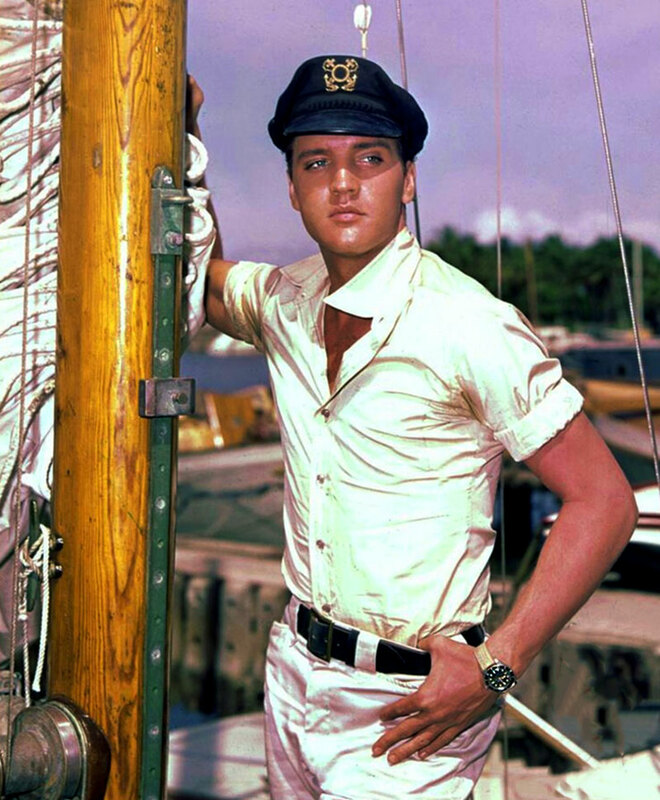 During the 1950s and 1960s many people became fascinated with the idea of men living in water, kind of like fish. The early saturation diving habitats like Conshelf and SEALAB were bold experiments in attempting to return man to the ocean. As a matter of fact, Jacque-Yves Cousteau's son, Jean-Michel told me that he originally wanted to become an architect so he could design underwater cities on the ocean floor. Jean-Micheal quipped, "And we know, for now obvious reasons why that never became a reality, but at the time it seemed like a great idea." 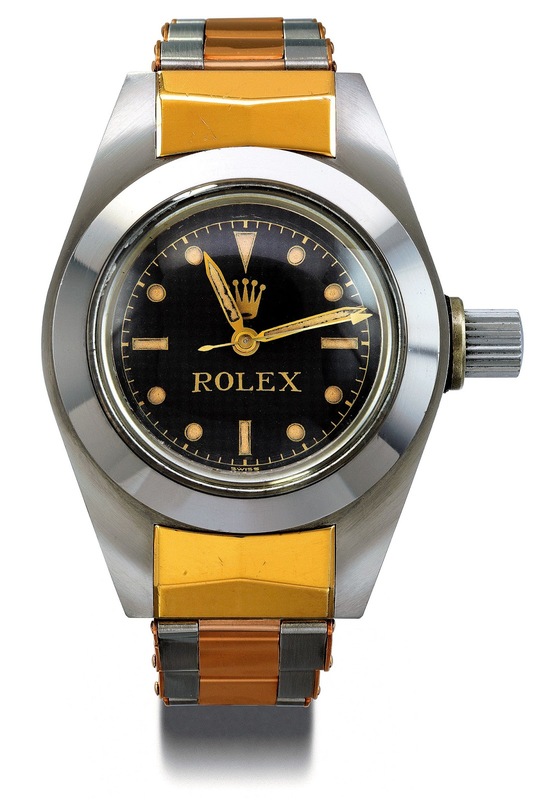 In the mid-to-late 1960s it was apparent to everybody, including Rolex, that Rolex owned the world of Aquatic Watches. 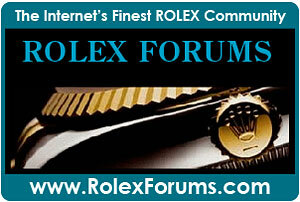 Rolex was eager to share this rich heritage with the world as we see in the 1964 ad seen below. It is also worth nothing that this ad serves as serious clue in the puzzle of the SEA-DWELLER. If we carefully read the conclusion above it number 4, it says "A Rolex takes a long, hard time to create...but it will still serve your son as he keeps appointments in cities under the sea." BINGO!!!! You see, back in 1964 the world was a lot bigger and slower. There was no internet or cable TV. People back then were easily fascinated with non-sensical aquatic science-fiction, like The Creature From The Black Lagoon, or The Man From Atlantis, or Aquaman, or even The Bermuda Triangle. The movie Jaws and Star Wars was still more than a decade away. The idea that man might build and occupy underwater colonies seemed very real, and with underwater habitat programs like Jacques-Yves Cousteau's Operation Conshelf, or the U.S. Navy SEALAB, it all seem real. 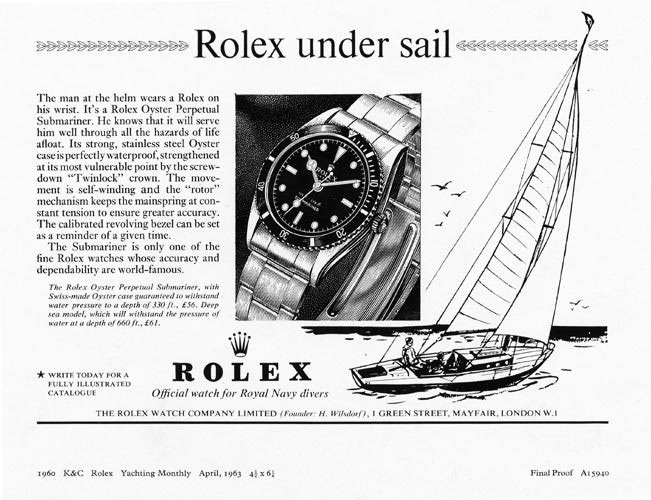 Even Rolex bought into it, and that is where the name "SEA-DWELLER" comes from, and means. Rolex was so inspired by Conshelf and SEALAB they named their deeper diving capable Submariner variant, The SEA-DWELLER. Yes. 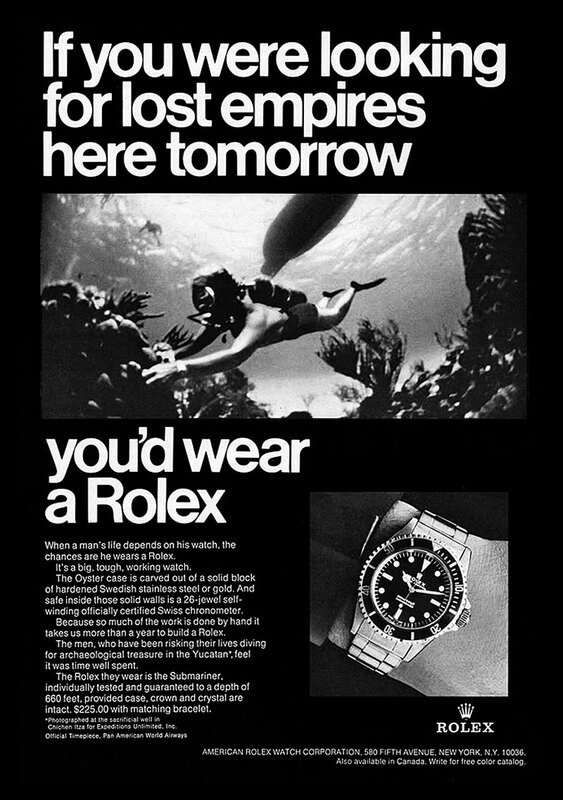 Even Rolex at the time thought it was likely men would live in the sea. 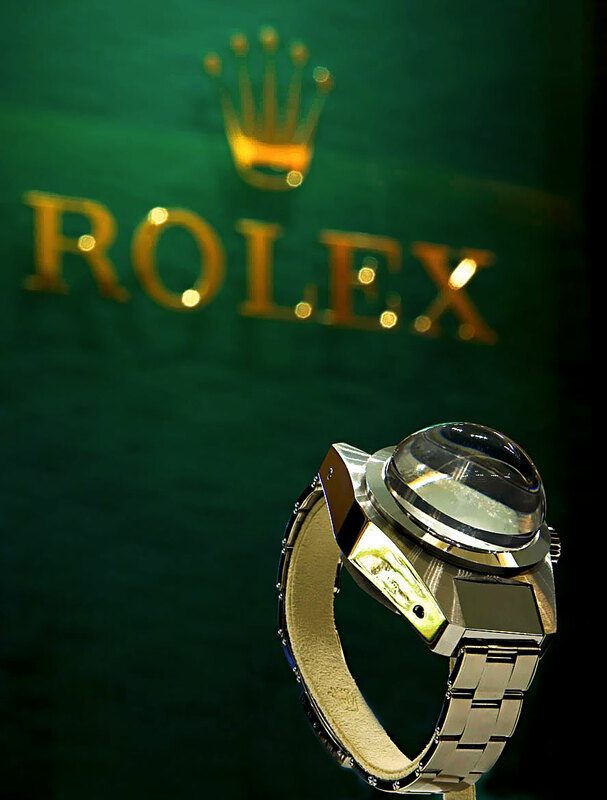 Ultimately Rolex SEA-DWELLER models would become popular tool watches for saturation divers from underwater construction firms like COMEX whose divers would work deep underwater building things like oil rigs. 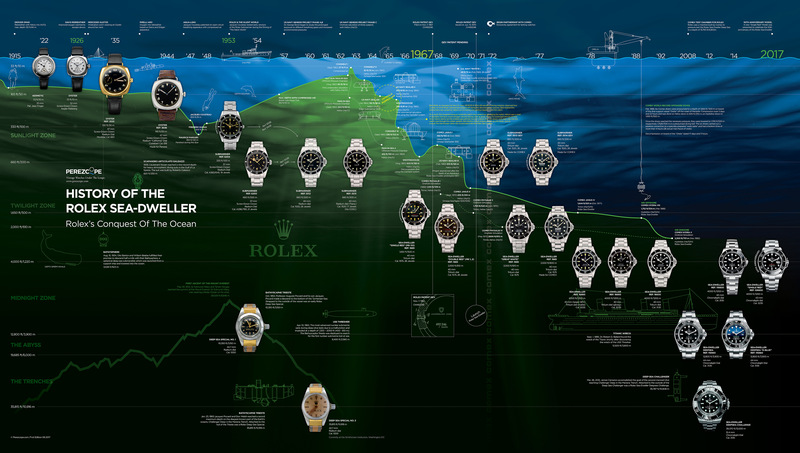 So if you have ever wondered how the Rolex SEA-DWELLER got its name, now you know. 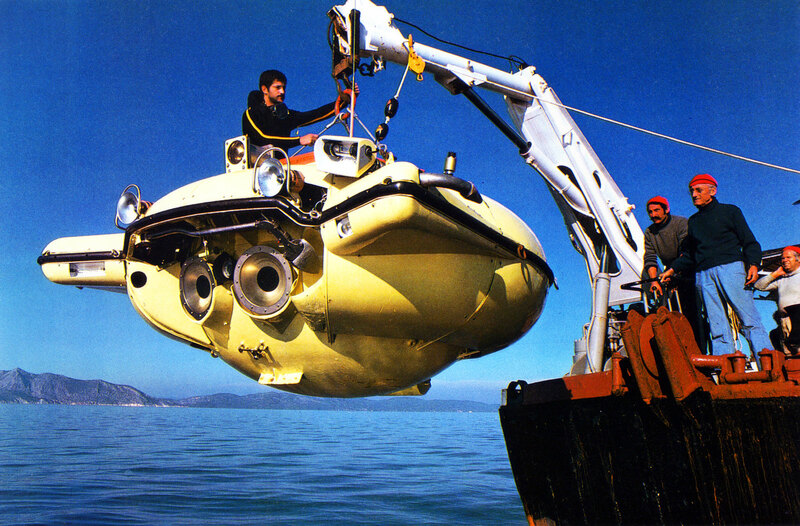 Jacques-Yves Cousteau's Calypso was extremely well equipped with innovative technology to capture the mysteries of the ocean including the SP-350 diving saucer submarine Captain Cousteau designed, which is pictured below as it is prepared for work in the Aegean Sea. 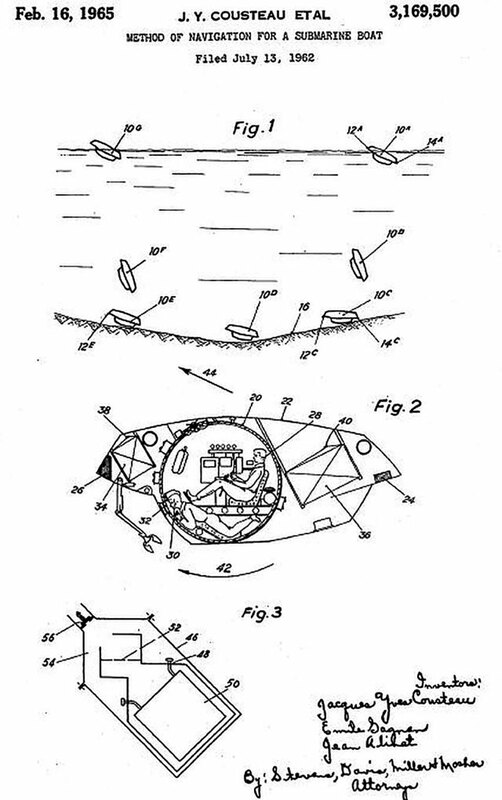 On thing is for certain and that is the fact Jacques-Yves Cousteau was a pioneer in the world of Submarine technology, as we see below in a patent he filed in 1965 for his two man submarine. 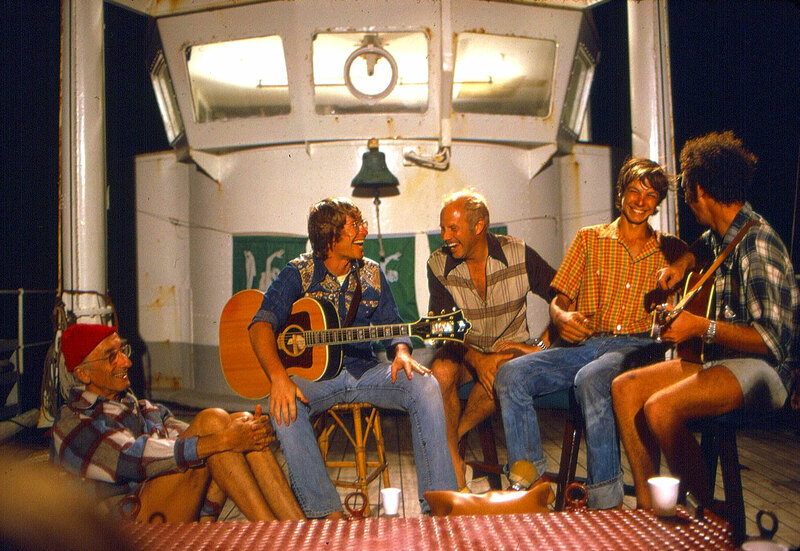 Richard Hyman took the photo below onboard the Calypso when they were filming in the Belize Barrier Reef and John Denver gave an impromptu concert for Captain Cousteau and his wife Simone. 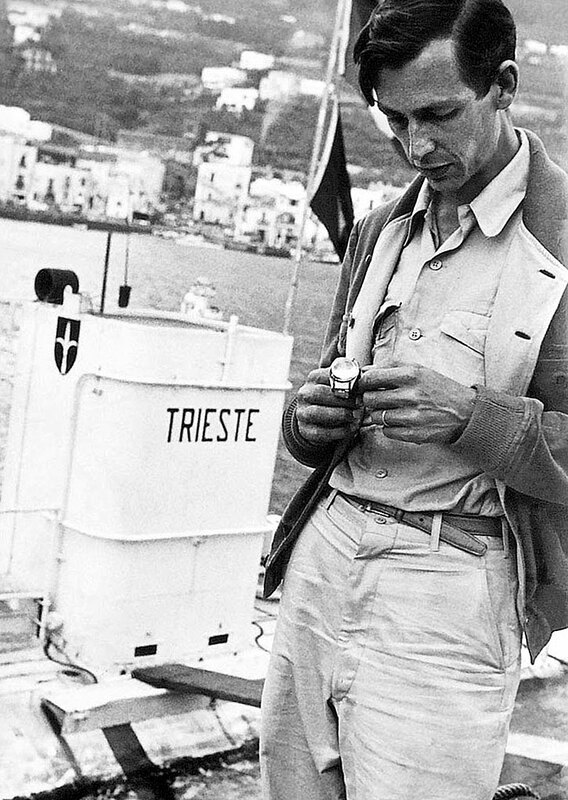 Jacques-Yves Cousteau not only wore a Rolex Submariner and SEA-DWELLER but also wore a white gold Rolex Day-Date on a leather strap which can be seen on his wrist in the photo below. 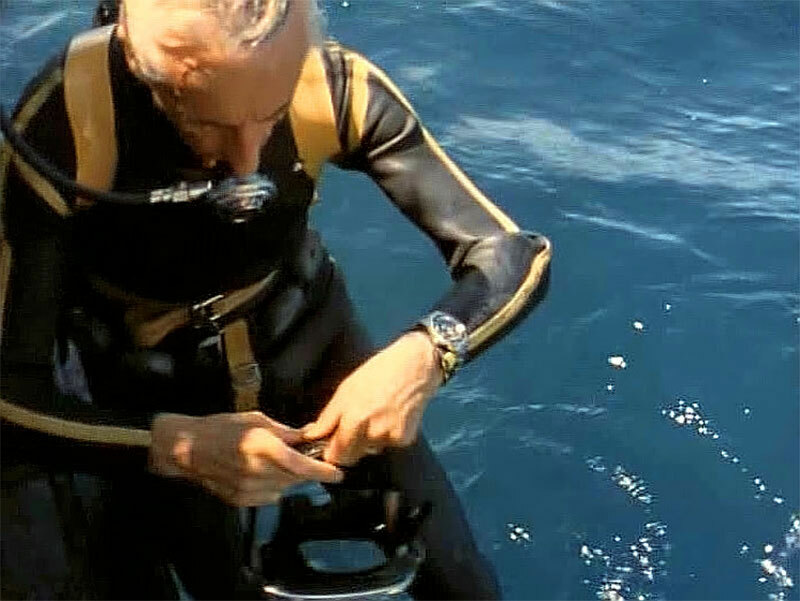 In the photo below we see Jacques-Yves Cousteau wearing two watches. On his right wrist he is wearing a Omega Marine Chronometer and on his left wrist he is wearing his Rolex Day-Date on a leather strap. 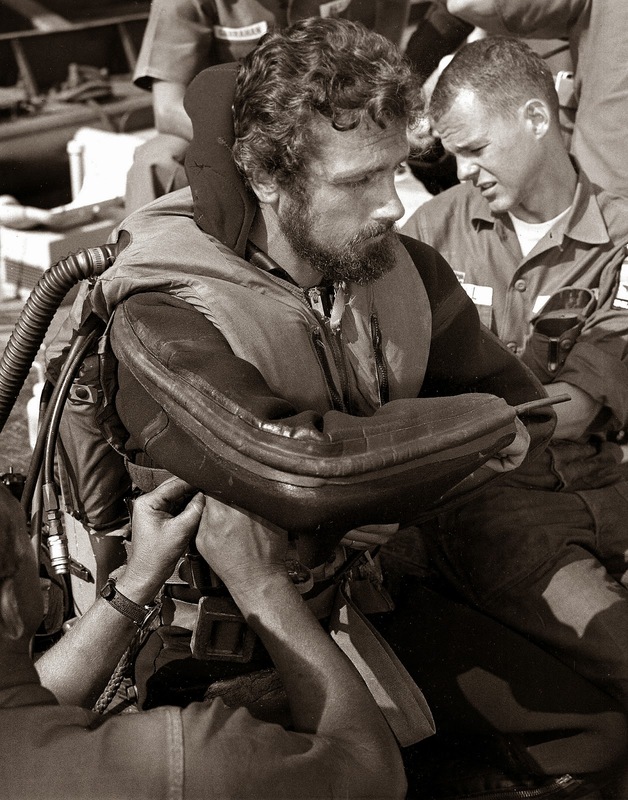 Why is Captain Cousteau wearing two watches at the same time? I assume it would be to keep track of time in two different time zones. In the close up image below we see the telltale characteristics of a Rolex Day-Date with the cyclops magnifier lens on the crystal as well as the classic Rolex Oyster shape. 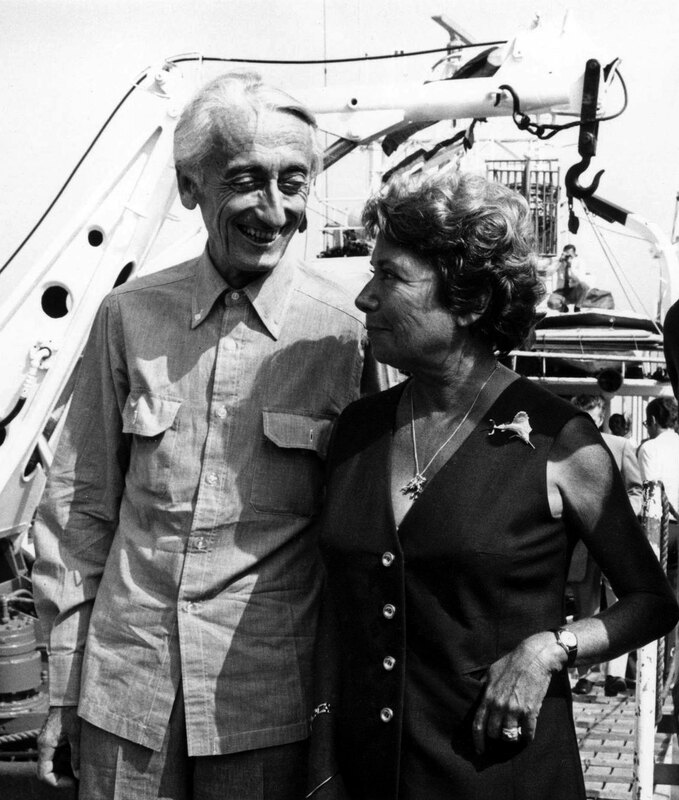 Jacques-Yves is pictured below with his first wife, Simone Melchior Cousteau aboard the Calypso. Simone who was commonly referred to as “La Bergère”, which when translated from French to English means: "The Shepherdess." In American English we might say she was like the den mother of the Calypso. Simone spent more time aboard the Calypso than anybody else, and loved it. Simone was also renowned for being extremely feminine and always being a perfect lady. As we see in the photo below, she wore a ladies Rolex Datejust. 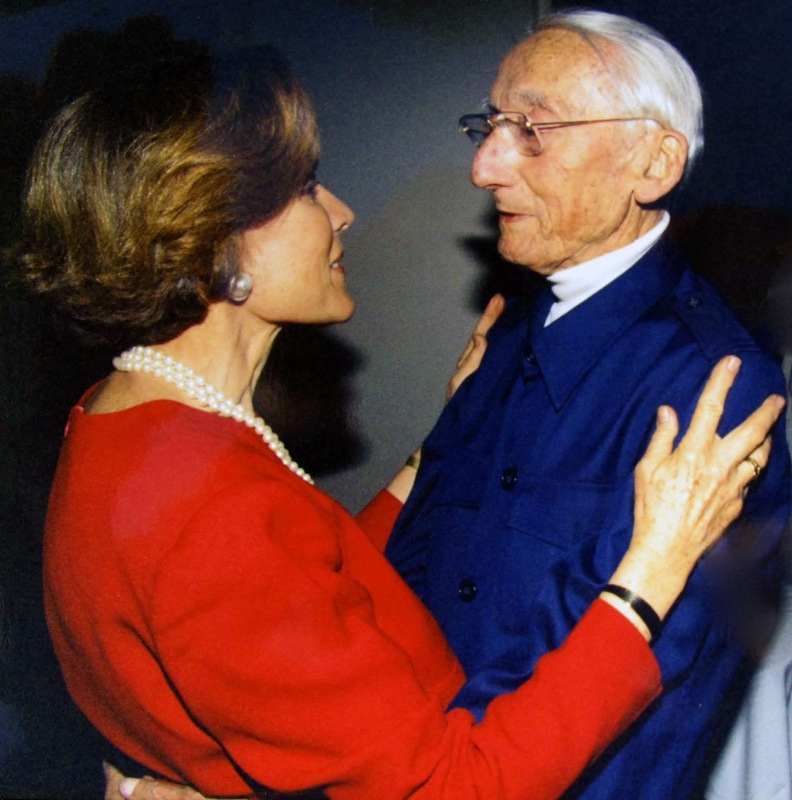 In the photo below we see Dr. Sylvia Earle embracing Jacques-Yves Cousteau. 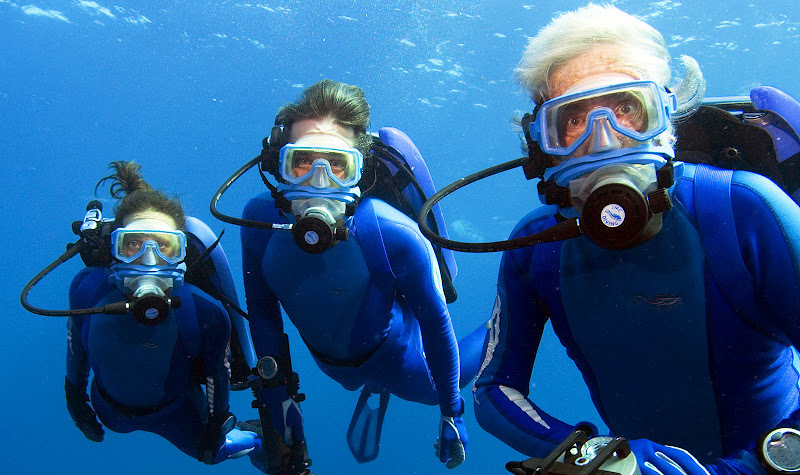 Dr. Sylvia Earle has been close with the Cousteau family for many years. 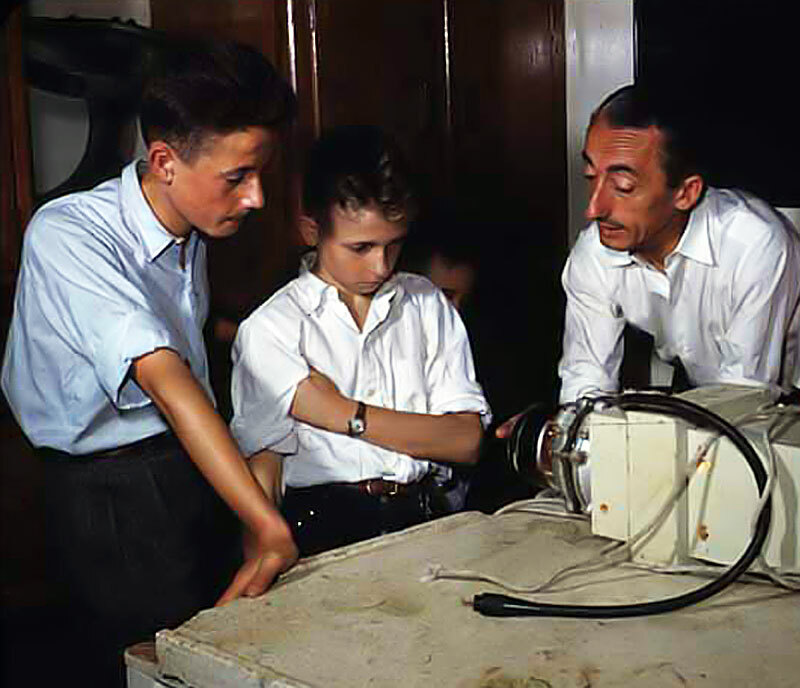 Jacques-Yves Cousteau is pictured below with his two sons, Jean-Michel, and Philippe in 1953 onboard the Calypso. In this next image also taken in 1954 onboard the Calypso by Harold Edgerton we see Jacques-Yves with his son Philippe. 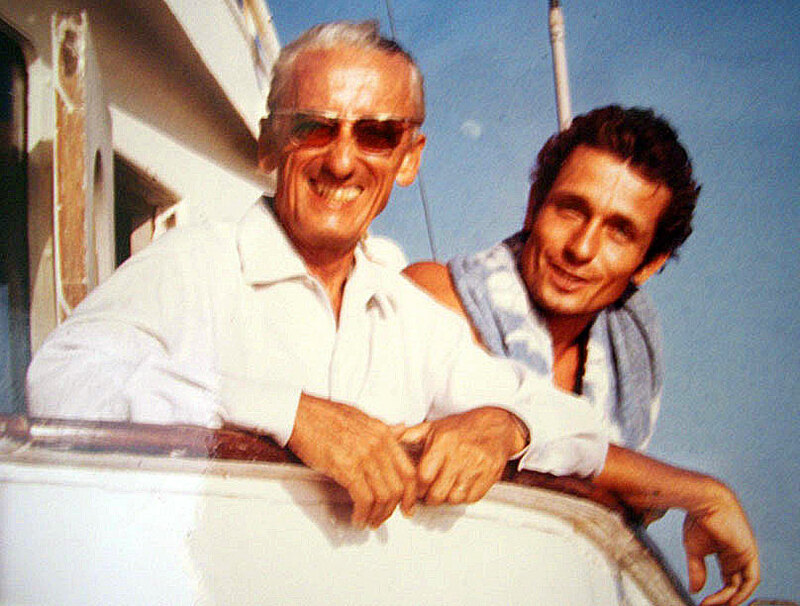 Philippe Cousteau is pictured below onboard the Calypso with his Father Jacques Cousteau in 1978. 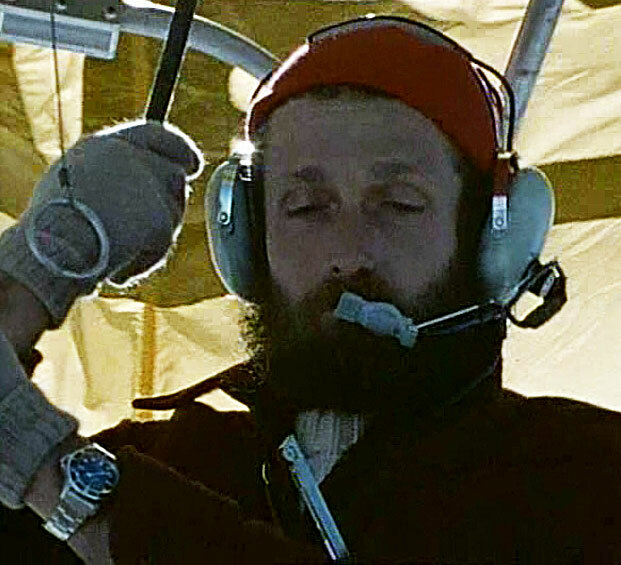 In this next photo we see Philippe-Pierre Cousteau after he grew a serious beard, and it was taken during a Jacques Cousteau documentary named "Voyage To The End Of The World", and notice he is wearing his trademark Rolex SEA-DWELLER in stainless steel with his trademark red Cousteau beanie. In the next image below we again see Philippe wearing his Rolex SEA-DWELLER. Philippe Cousteau was Jacques-Yves Cousteau's younger son, and in the photo below we see Philippe suiting up for a dive during SEALAB III. It is important to note that Philippe Cousteau and his father, Jacques Cousteau were always in close contact with the members of SEALAB, as Operation Conshelf and SEALAB ran concurrently. Philippe Cousteau was invited by the U.S. Navy to be an adviser and cinematographer for SEALAB III. 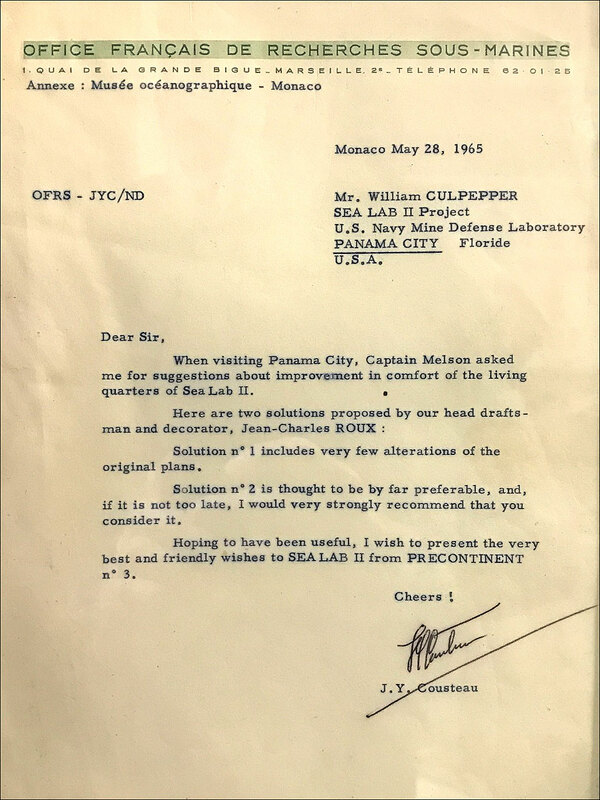 The letter below is from Jacques-Yves Cousteau to William Culpepper regarding the design of the SEALAB II habitat with recommendations from J.Y.C. The drawing below shows Jaques-Yves Cousteau's recommendation for the layout of the SEALAB II habitat. Special thanks to my right hand man, Jose from Perezcope.com for providing these historically significant images which he got when he traveled to Panama City in Florida to the SEALAB Museum. 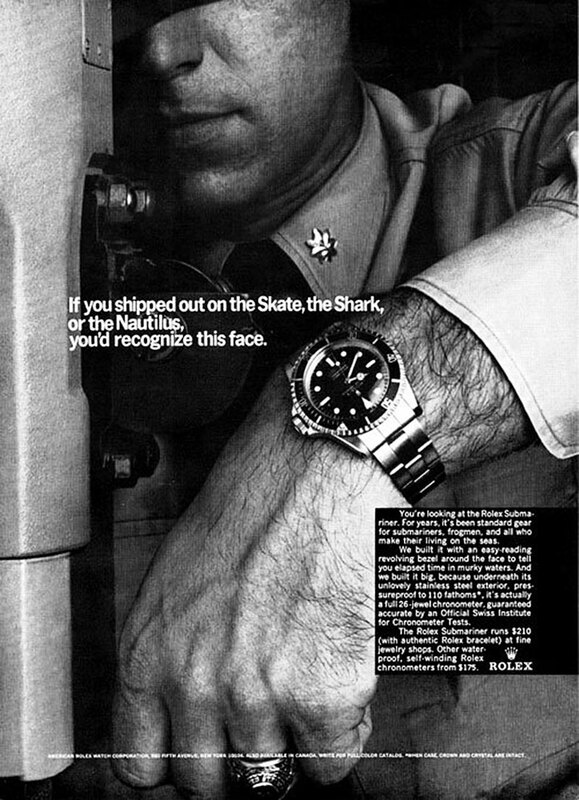 This next vintage Rolex ad is from 1974 and features Dr. Joe Macinnis who was a SEALAB III diver along with Philippe Cousteau. 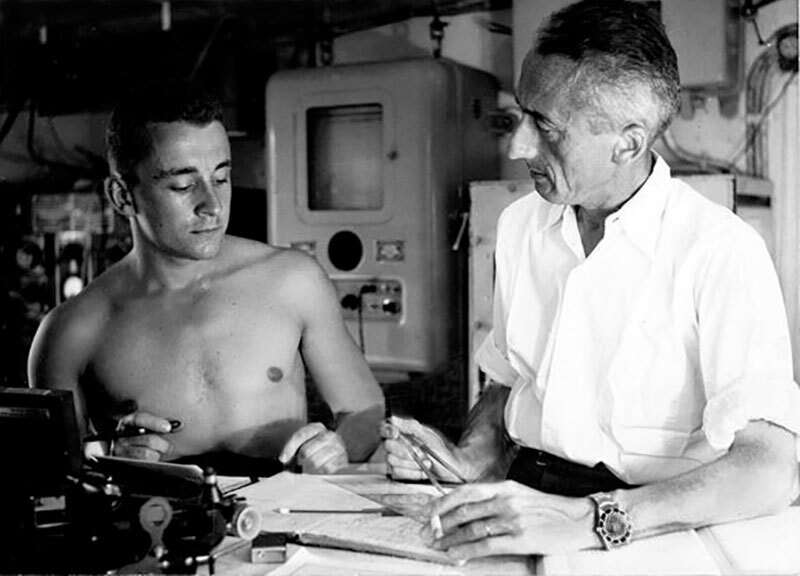 Philippe-Piere Couteau is pictured below with his father Jacques-Yves Cousteau, and Jacques seems to be admiring his sons Rolex SEA-DWELLER. Philippe Cousteau's Double Red Patent-Pending SEA-DWELLER is pictured below in a recent photo from an Antiquorum Auction. The caseback on this watch has an interior date stamp from the fourth quarter of 1967 that reads IV.67, with the serial number of 1,602,920. Philippe Cousteau's Rolex SEA-DWELLER sold on September 30, 2014 for $183,750 @ Antiquorum Auction House in New York. It is believed, based upon its serial number, this watch likely began its life as a Single Red-Sea-Dweller that ended up getting its dial replaced with a double red device dial. 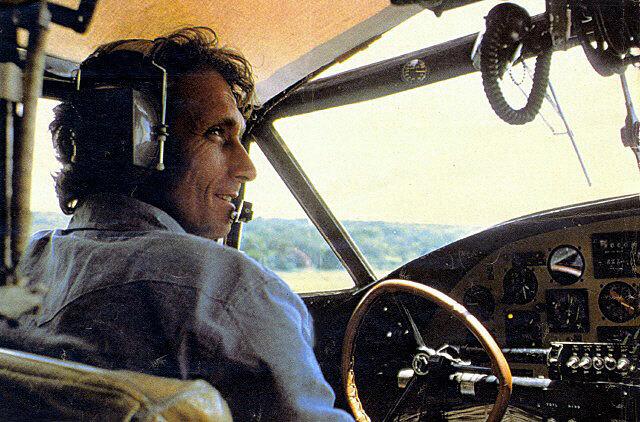 Philippe-Piere Cousteau was quite an explorer and risk taker, and he loved being an airplane pilot. 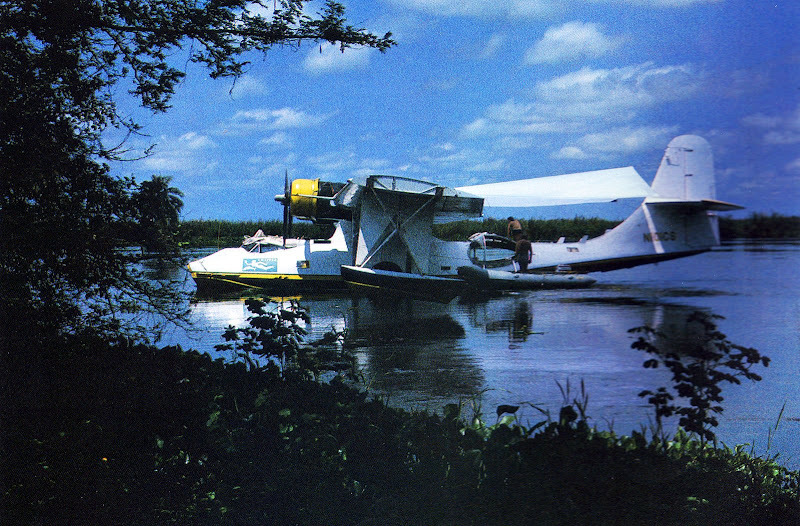 We see Philippe-Piere below in 1978 piloting his Calypso Seaplane above Lake Victoria in Uganda. Tragically, on June 28, 1979 Philippe was attempting to land the Cousteau amphibious Flying Calypso airplane boat (seen above and below) and when he attempted to land the seaplane, the nose wheel came down by mistake while landing and caused the Flying Calypso to flip and crash in the Tagus River in Portugal resulting in his death. His father Jacques-Yves Cousteau was completely devastated by the supreme tragedy as was the rest of his family. At the time of Philippe Cousteau's death, his American wife, Jan, was seven months pregnant with their son Philippe Cousteau Jr. Jacques-Yves Cousteau was devastated by his son Philippe's accidental death. 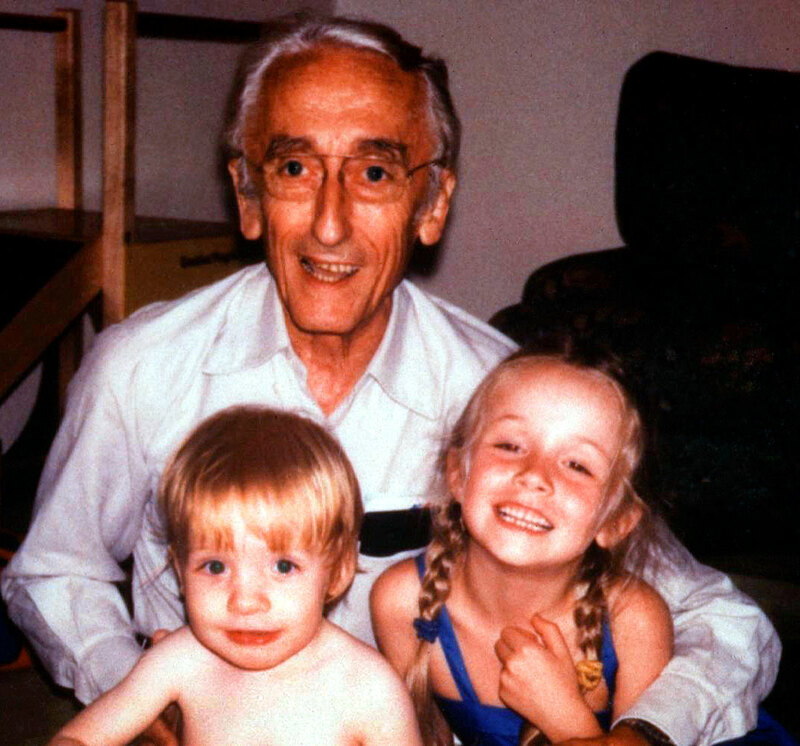 The photo below was taken several years later and we see Jacques-Yves with his grandchildren, Alexandra and Philippe Cousteau Jr.
"I'll never be able to fill my father's or grandfather's shoes, but hopefully I can stand on their shoulders and reach farther." –Philippe Cousteau Jr. 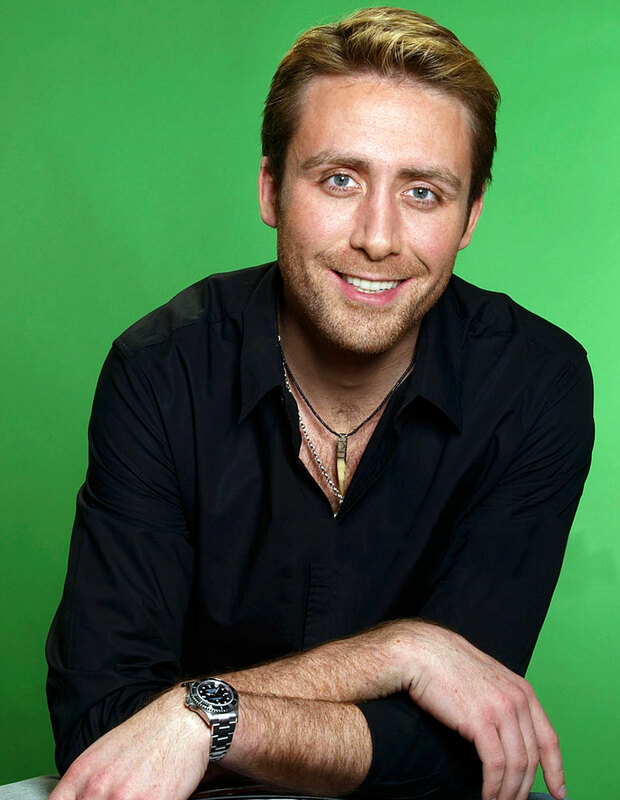 In the recent photo above, we see Philippe Cousteau Jr., wearing his Rolex SEA-DWELLER. Philippe Cousteau Jr, is Jacques-Yves Cousteau's grandson, and he received his Rolex SEA-DWELLER as a gift from his mother, Jan. In the video below we see Phillips Cousteau giving a Ted Talk which is fascinating. Alexandra Cousteau is Philippe Cousteau Jr's sister. Alexandra is a strong ocean advocate and can be seen below in the video talking about an expedition she was on for Oceana. 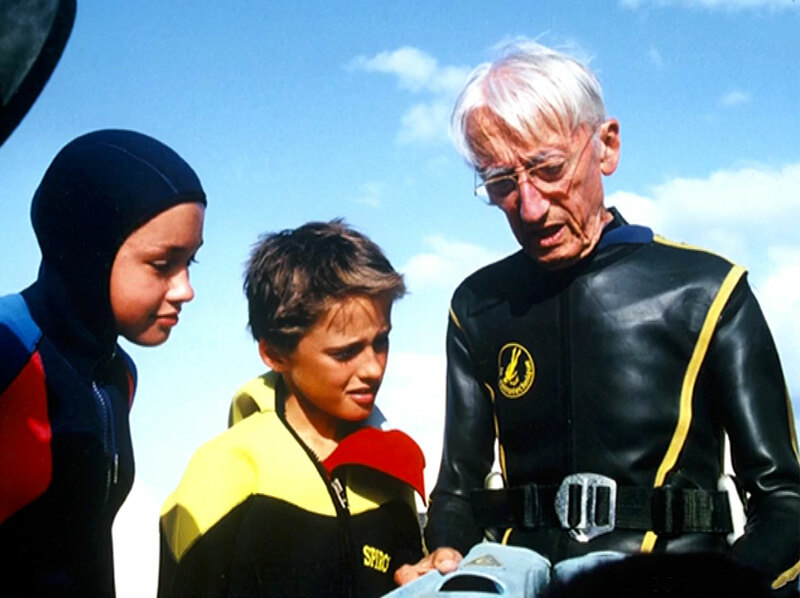 Jacques-Yves Cousteau had two boys with his first wife, Simone Melchior and in the photo below we see the next two generations of descendants. 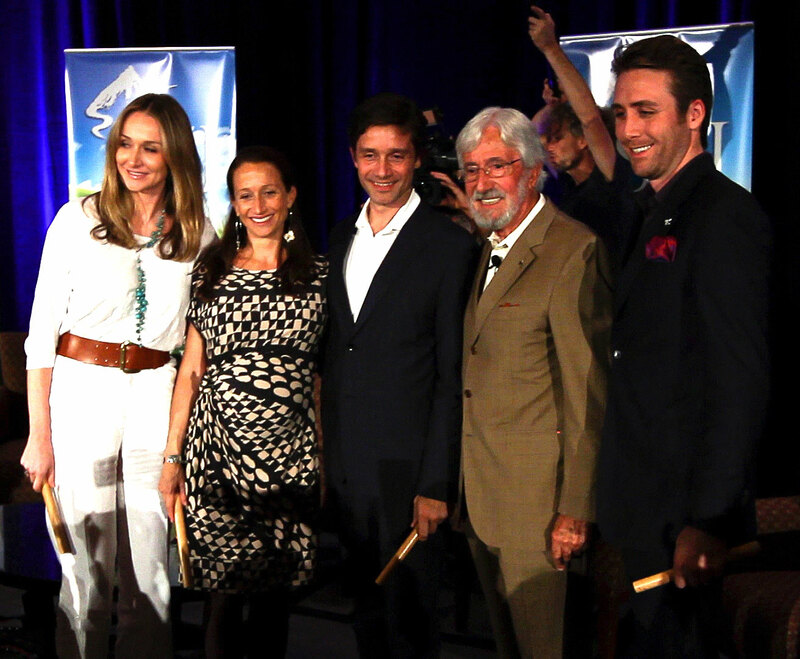 In the photo below we Jean-Michel Cousteau standing next to his son Fabien Cousteau, and daughter Céline Cousteau, surrounded by his nephew Philippe Cousteau Jr., and his niece, Alexandra Cousteau. 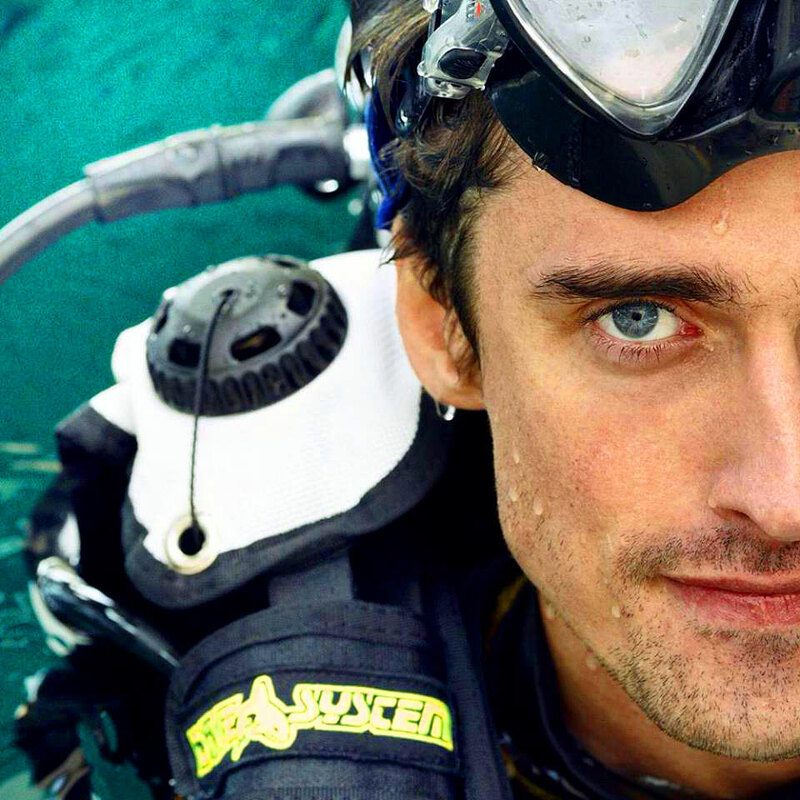 All four Cousteau grandchildren are amazing and have all followed in their grandfather's footsteps. Jacques-Yves Cousteau was married a second time to Francine Cousteau and they had two children, Pierre-Yves Cousteau, and Diane Cousteau. Jacques-Yves daughter Diana Cousteau, who is Pierre-Yves sister seems to have disappeared completely from the public limelight and has not been photographed for many years, which explains why I don't cover her in this story. Pierre-Yves Cousteau on the other hand is a public figure and is very similar to his father in many ways and is pictured below. 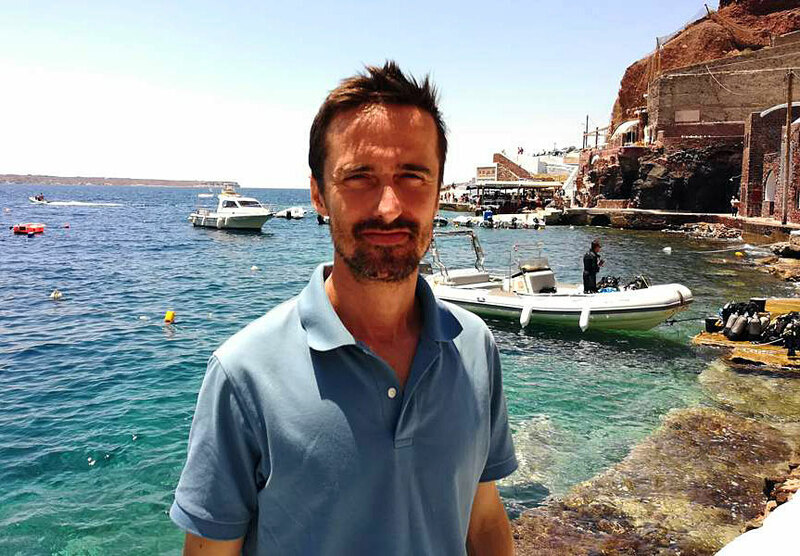 In particular he is a bold ocean environmentalist and he is pictured below in a recent photo on the Greek island of Santorini. I am glad I dug deeper to not only explore the significance of Jacques-Yves Cousteau Rolex history, but also how both of his sons were involved in the SEA-DWELLER history. 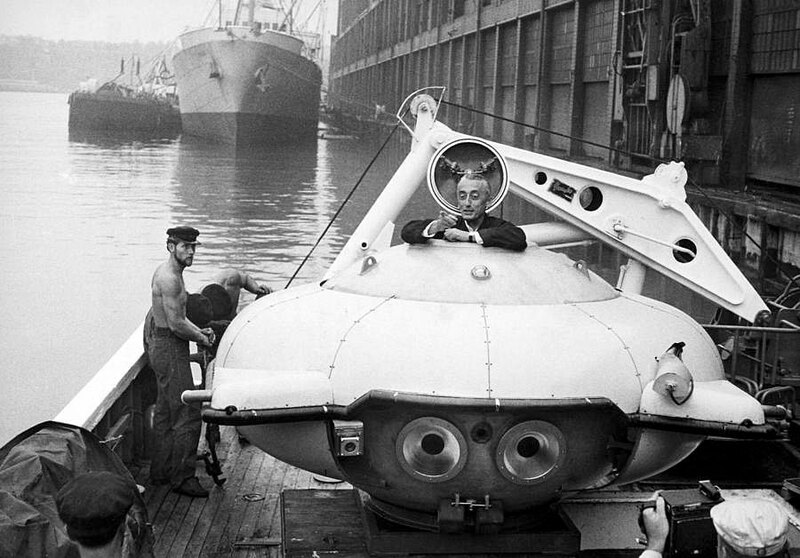 As we just learned, Jacques-Yves Cousteau was the living personification of both the Submariner and SEA-DWELLER. But Why? How did this happen? Was in happenstance or was it by design? I believe it was serendipitous for several reasons. 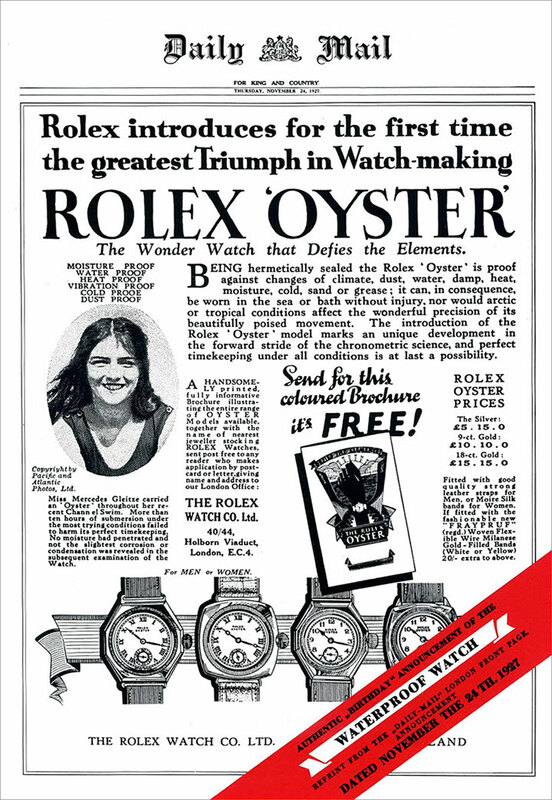 Let's get in the Rolex time machine and go back to the roaring twenties to find out why. 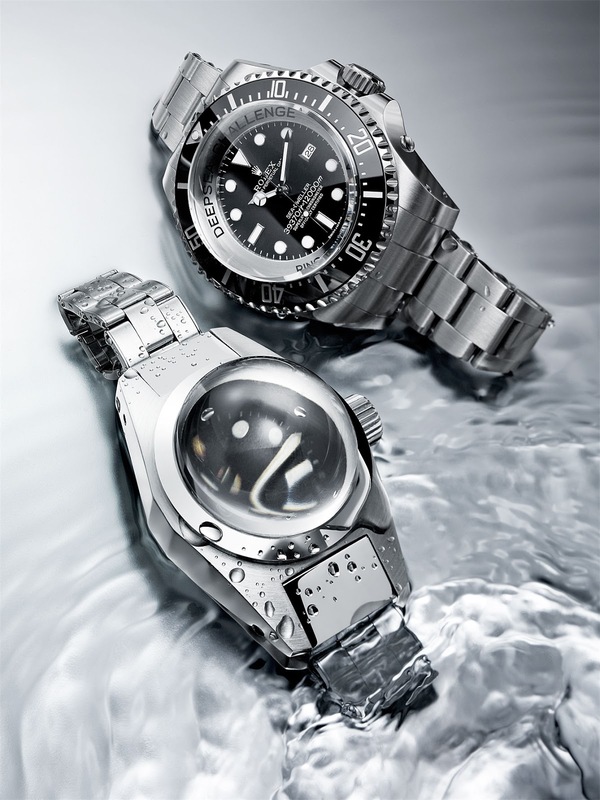 Rolex has always been an aquatic brand. 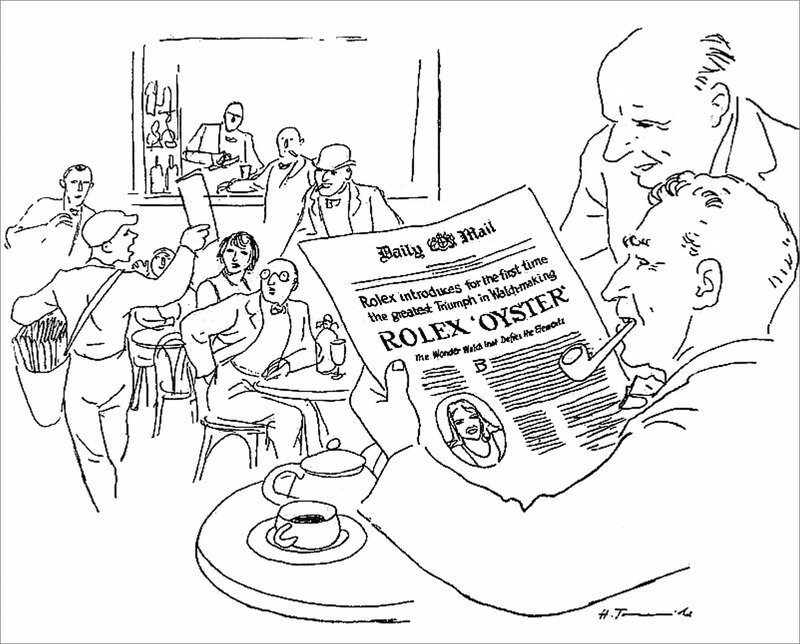 The next two photos are from a Rolex Oyster brochure and the first image depicts The Founder of Rolex, Hans Wilsdorf observing the Rolex advertorial he placed in the London Daily Mail on November 24th, 1927. I included a copy of the original Daily Mail ad below. 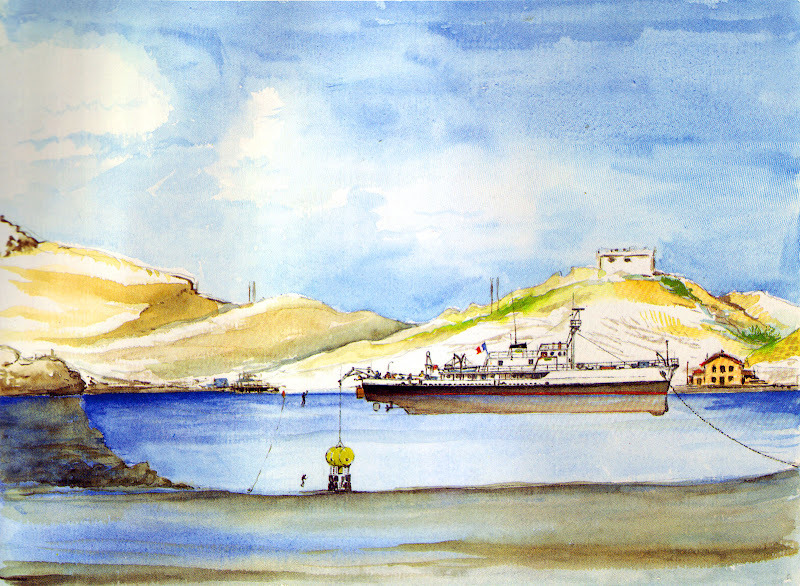 This next illustration depicts Mercedes Gleitze as she emerges from the English channel. In the past, I wrote a detailed article about Merceds Gleitze swimming the English Channel. 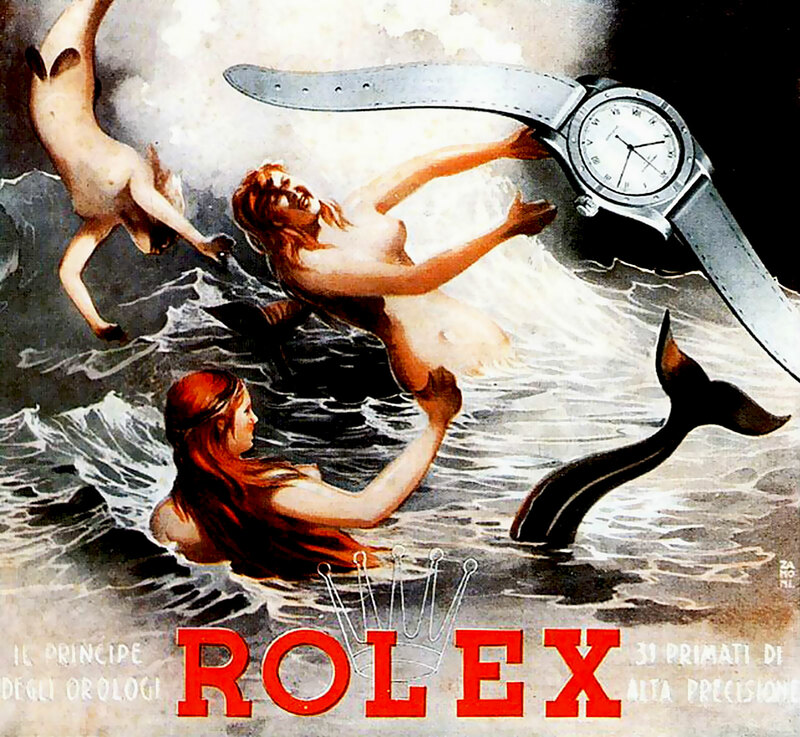 Posting the image above made me think about this other Italian Rolex Mermaid image I have posted in the past. 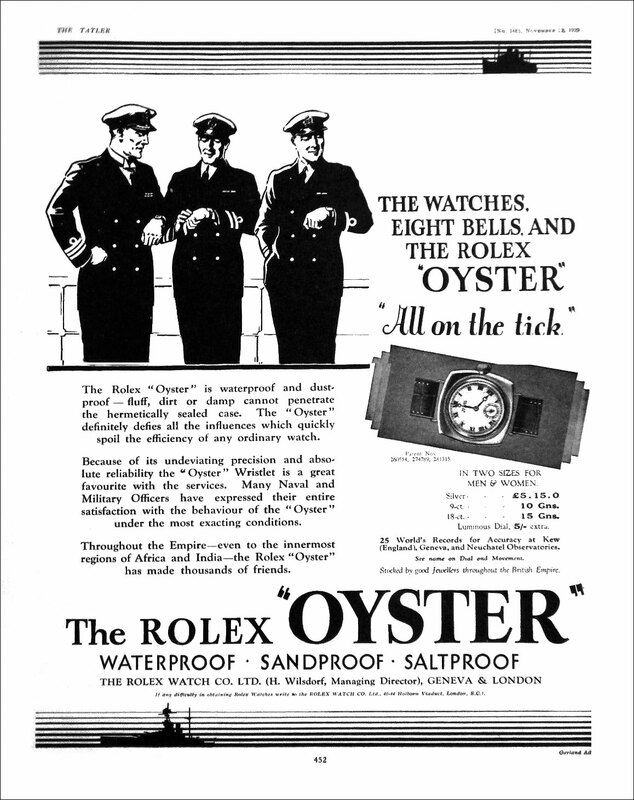 This is a fascinating Rolex magazine ad from 1929, which means Rolex had obviously already introduced their revolutionary "Oyster" waterproof case, but had not yet introduced their "Perpetual" automatic movement, which came along in 1931. 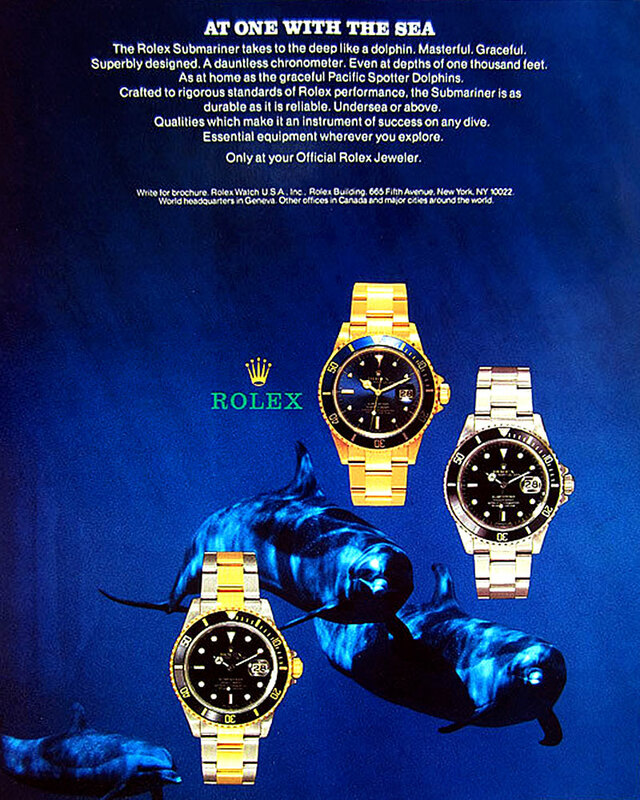 I am always fascinated when I find and publish another aquatic themed vintage Rolex ad which completes another piece of the Rolex history puzzle! 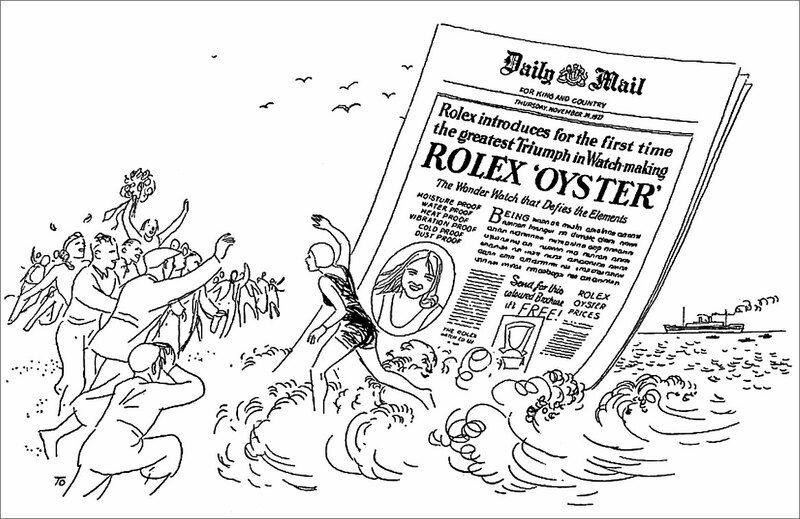 Rolex has maintained aquatic themed advertising since they invented the worlds first waterproof watch in 1927, which is named the 'Oyster'. The life aquatic is remains as much a part of Rolex's DNA as does Jacques-Yves Cousteau.